An Ordinary Meeting of the Bega Valley Shire Council will be held at Council Chambers, Bega on Wednesday, 25 November 2015 commencing at 2.00 pm to consider and resolve on the matters set out in the attached Agenda. 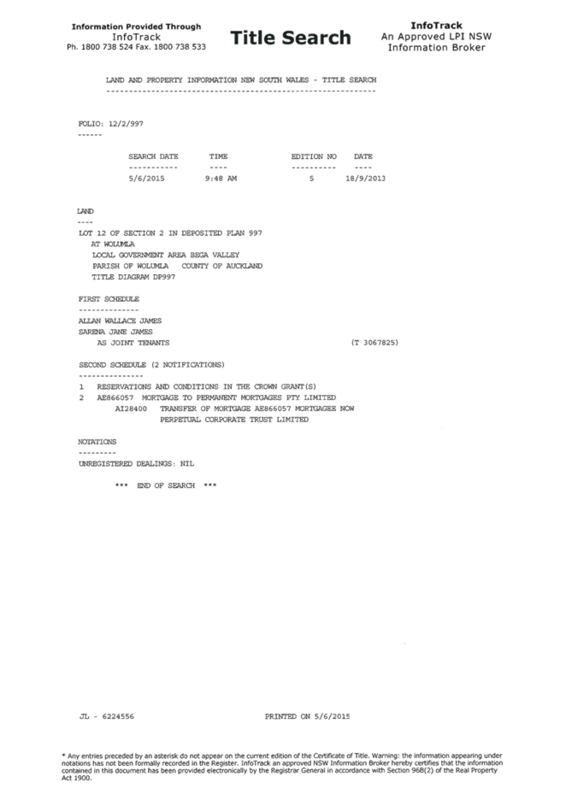 That the Minutes of the Ordinary Meeting held on 4 November 2015 and the Extraordinary Meeting held on 16 November 2015 as circulated, be taken as read and confirmed. 12.3 2014 - 15 Annual Report.......................................................................................................... 180 . 13.5 Certificate of Investments made under Section 625 of the Local Government Act, 1993 211. 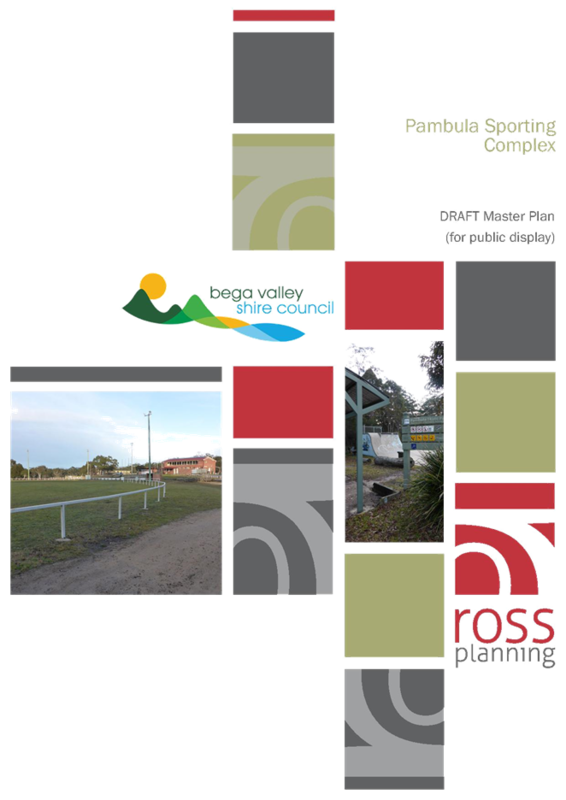 The purpose of this report is to detail the outcomes of the public exhibition and government agency consultation and to finalise the amendment to Bega Valley Local Environmental Plan 2013 to rezone Lot 331 DP 1035434. The objective of the planning proposal is to rezone the subject land from 1(a) Rural General to R5 Large Lot Residential with a minimum lot size of 5ha to permit the development of up to 10 rural residential allotments. Council received a Gateway Determination for the planning proposal on 14 August 2015 from NSW Planning and Environment and delegation of the functions of the Minister of Planning and Environment to make the plan. In accordance with the Gateway Determination, the planning proposal was placed on public exhibition for 28 days from 4 September to 2 October 2015 and three public submissions were received. Submissions were also received from the NSW Rural Fire Service (RFS) and NSW Roads and Maritime Services (RMS). 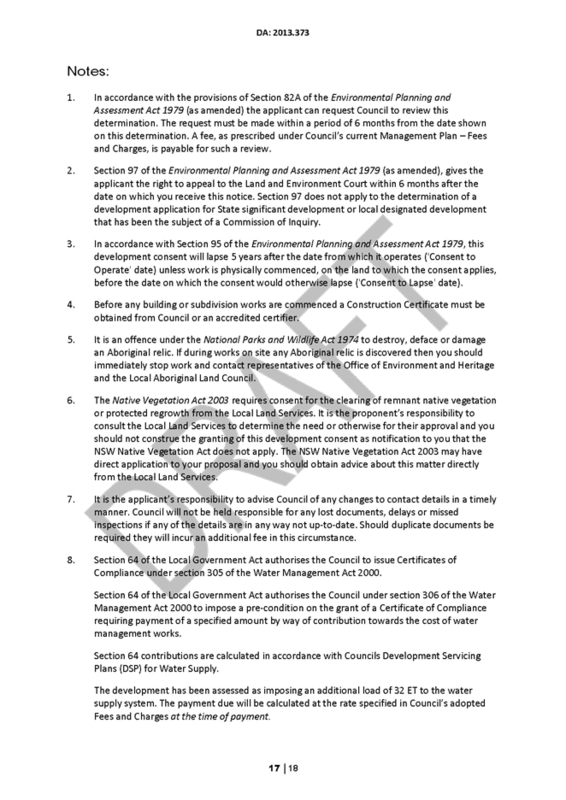 The exhibition of the planning proposal included notification on Council’s website, in local newspapers, in writing to affected and adjoining landowners and the Merrimans Local Aboriginal Land Council. 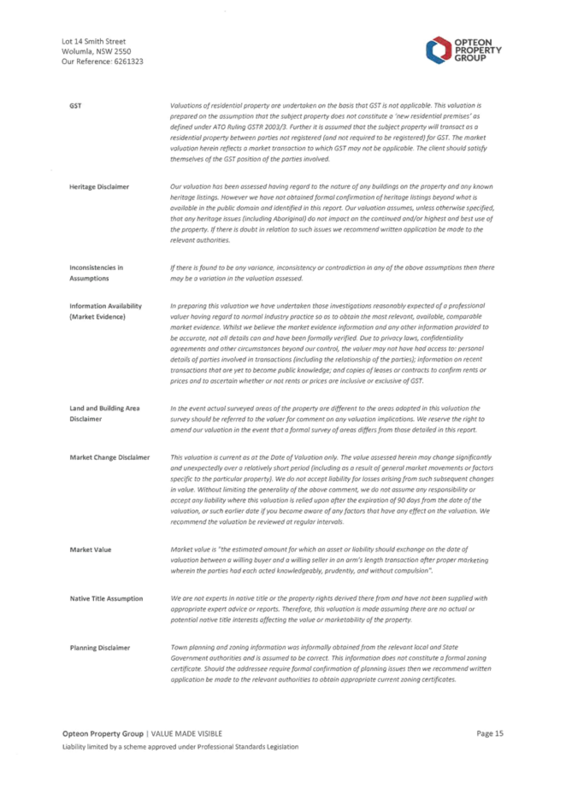 The agency submissions received by Council to the planning proposal, as well as the issues raised in the three public submissions, are summarised and discussed below. · The RMS commented that it is satisfied that the safe access to the area can be provided in the future. 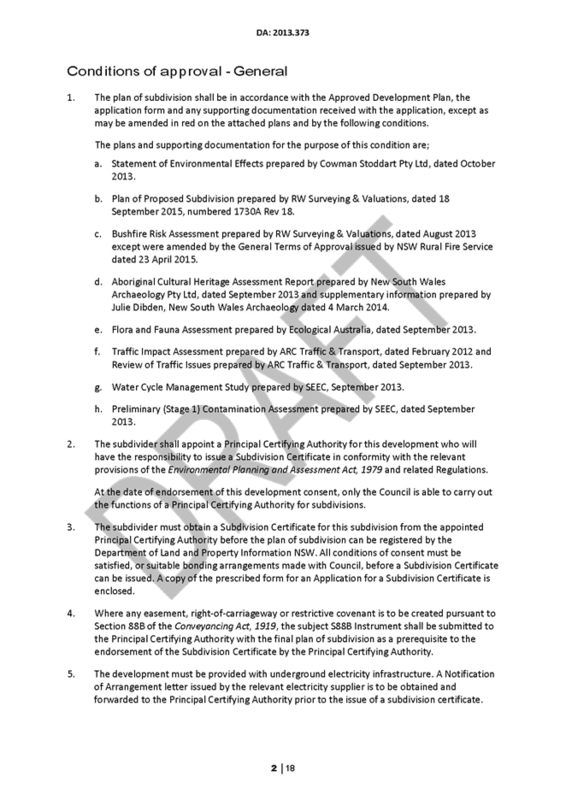 · In summary these matters were: minimising the interface to the bushfire hazard including consideration of a perimeter road, ensuring future lots can achieve APZs within boundaries and achieve the applicable radiant heat and Bushfire Attack Levels and locating dwellings within 200m from a public through road or provision of a secondary access route. 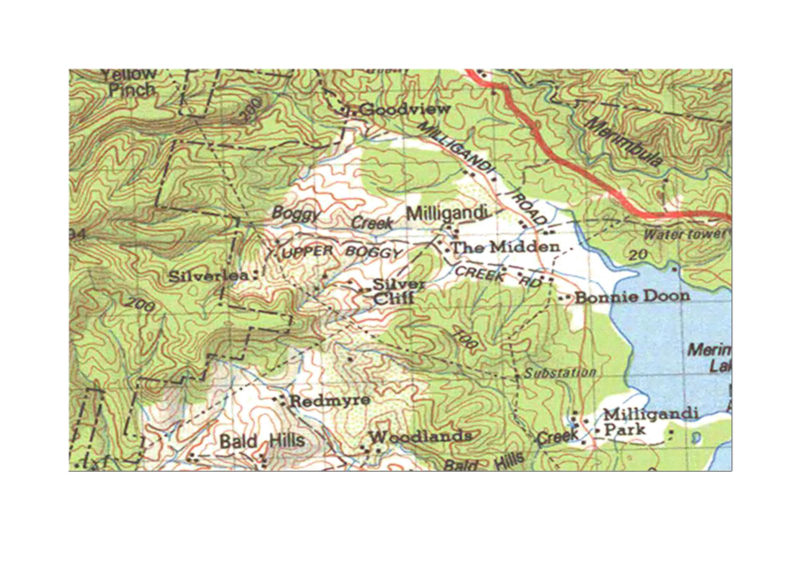 The northern portion of the land is mapped as bushfire prone (see Figure 2 below). It is acknowledged the subdivision concept plan included in the planning proposal does not comply with RFS Planning for Bush Fire Protection 2006, however Council’s Planning Services staff are of the opinion that it is likely the land could be subdivided in a way that would satisfy the RFS’s requirements. Use of the lot averaging clause provides options for the majority of future lots to be developed on the non-bushfire prone land which is relatively unconstrained in terms of bushfire hazard. Because part of the subject land is bushfire prone, the Development Application for subdivision will require the approval of the NSW RFS, prior to approval by Council, and as such all future lots will be required to meet the standards of RFS Planning for Bush Fire Protection 2006. 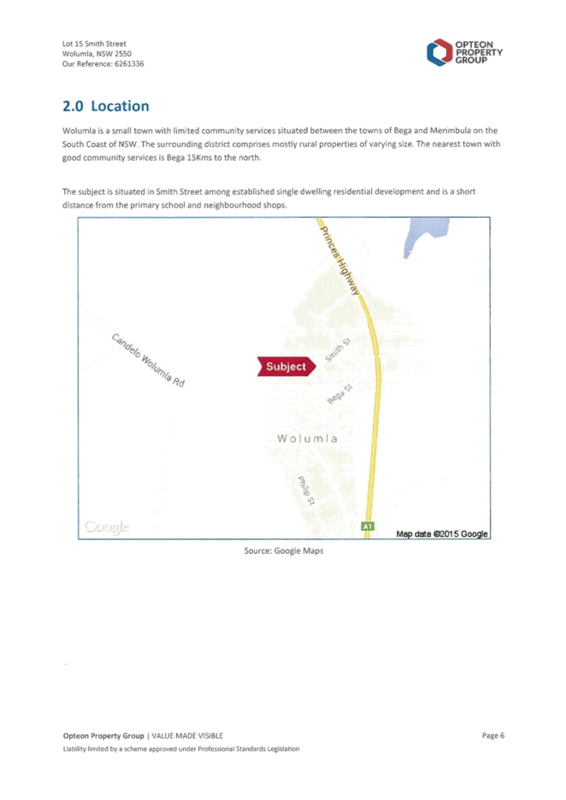 · Adjacent owners submitted they were influenced by the privacy / rural zone and its restrictions on further subdivision when purchasing properties and rezoning will negatively impact on the quality of life from overlooking development and increase in traffic. Lot 330 DP 1035434 is approximately 4ha and contains a dwelling and is surrounded on three sides by the subject land; and Lot 9 Section 26 DP 2591 contains a dwelling on 2ha and is located on the western boundary of the subject land. The land adjacent to the subject land on the southern side of the Bermagui Cobargo Road and to the east has been subdivided into lots of around 4ha in size and various concessional lot subdivisions in the surrounding rural land typically range from 2 to 8 hectares in size. The majority of these lots contain dwellings. While lots created primarily for rural residential purposes are not uncommon in the vicinity, the privacy and amenity of the existing adjacent owners will be affected by the development that is likely to result from the planning proposal. This is particularly the case for the owners of Lot 330 DP 1035434 as the proposed access would run along the eastern boundary of their property. These impacts are largely unavoidable due to the restrictions on the location of the proposed access to the Bermagui Cobargo Road and the topography of the site. However, the proposed minimum lot size provides flexibility in terms of future subdivision layout and the application of the provisions of Council’s Development Control Plan 2013 will ensure that both the location of lots and the subsequent dwellings are placed as sympathetically as possible with regard to neighbouring amenity issues. It is considered the proposed subdivision of the subject land would be consistent with the fragmentation of land in the area. The proposed minimum (or average) lot size of 5ha could produce a maximum of 10 lots on the subject land, which would be in keeping with surrounding rural residential development. 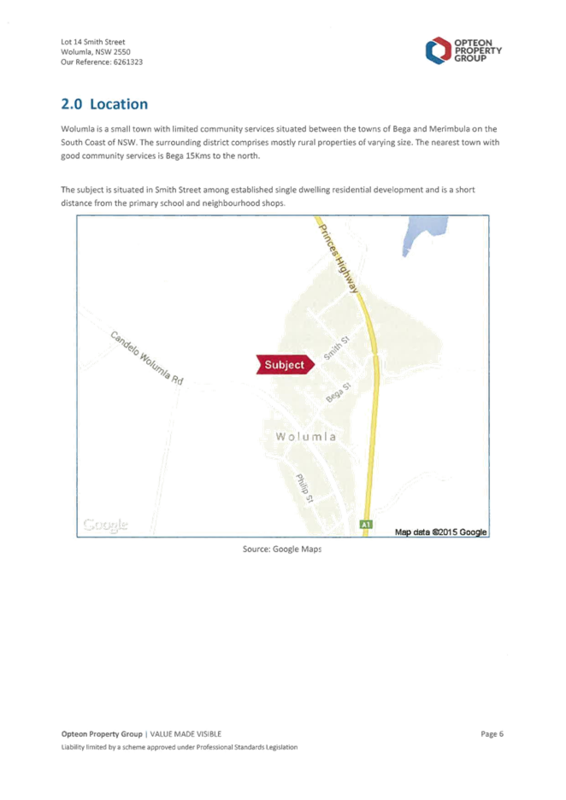 There is a demonstrated need for additional rural residential zoned land in the Cobargo area. The proximity of the subject land to the village of Cobargo and relative lack of environmental constraints on most of the site, make it a suitable location for expansion of rural residential development in the Cobargo area. Recommendation: No amendments to the provisions of the planning proposal are recommended. Access to the subject land has been the subject of discussions between RMS, Council and the applicant’s consultant. The RMS is satisfied with the proposed location of the access as detailed in the planning proposal and requires that any future lots use the proposed access point to the Bermagui Cobargo Road. A reduction in speed limits on the Bermagui Cobargo Road is not considered by the RMS to be appropriate. 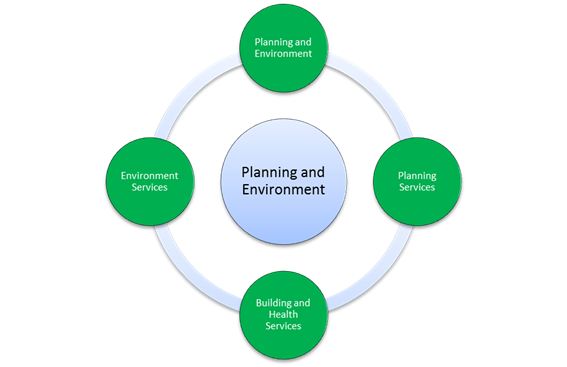 Recommendation: No changes to the provisions of the planning proposal are recommended. Lot 330 DP 1035434 has an easement to a dam on the subject land and the right to pump, supply and store water. Should the subject land be rezoned this right will be maintained on the basis that the 88B restriction is an in force legal instrument. As such, any future subdivision of the land must ensure the existing water supply line and source is maintained or a new alterative supply arrangement is formulated so that the legal terms of the 88B restriction benefitting lot 330 are maintained. Council’s Senior Environmental Health Officer is satisfied that the On Site Waste Water Disposal – Effluent Capability Study provided in support of the planning proposal, demonstrates that waste water from the development likely to result from the planning proposal, can be adequately disposed on site. The report is based on on-site soil testing and demonstrates sufficient effluent management areas can be located outside of the buffers to the subject land’s network of gullies. · Native vegetation regrowth at the top of the hill has created a wildlife corridor providing habitat for kangaroos and echidnas. Council’s Environmental Services Staff have inspected the site and advised the native vegetation in the northern third of the property increases in density with pockets of new regrowth (1-5 years), older regrowth (5-25 years) and the occasional mature remnant trees including several trees with hollows. The lot has components of a wildlife corridor in the early stages of regeneration linking the larger remnant patches of vegetation to the north and south of Cobargo. The corridor takes the form of linear strips of vegetation generally following the ridge lines and gullies diagonally from the northwest to the southeast of the lot eventually connecting to Narira Creek. Subdivision of the northern portion of the subject land will be constrained by the vegetation density and steepness of the land which will restrict options for the location of building envelopes and on-site sewerage treatment, potentially resulting in greater cumulative impacts on the vegetation. 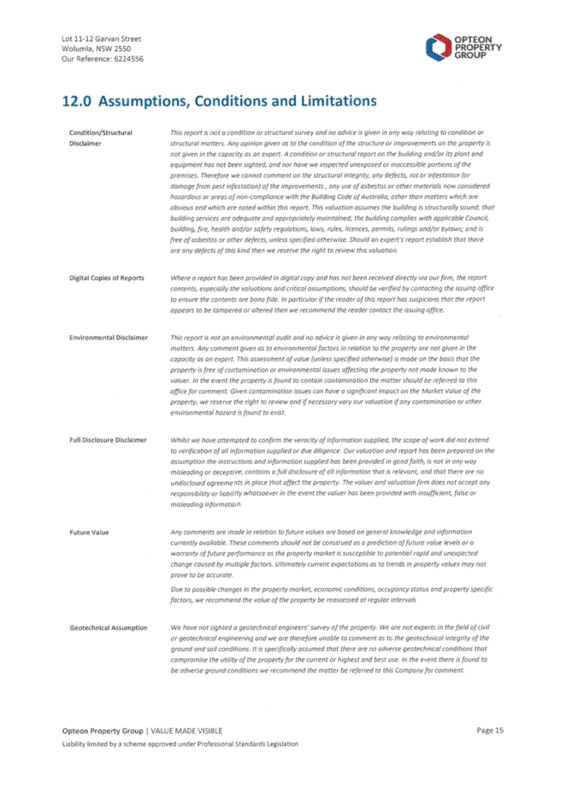 Furthermore, impacts from future landholder activities and their allowances such as clearing regrowth and fence lines under the Native Vegetation Act 2003 can result in on-going cumulative impacts. 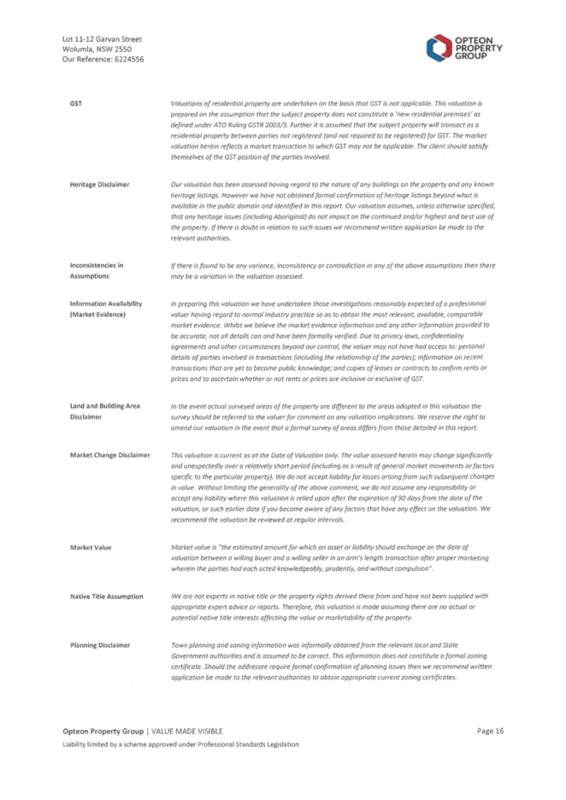 Recommendation: To mitigate the potential for future subdivision to fragment the northwest southeast corridor and encourage the maintenance of a contiguous patch of vegetation in the future, it is proposed to zone the northern portion of the land as E4 Environmental Living in recognition of the land’s environmental values (see Figure 3 below). 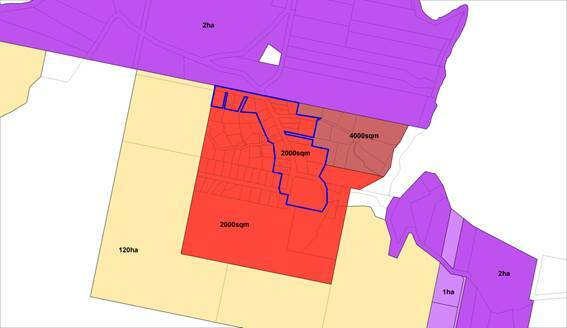 Moreover, the proposed zoning boundary relates reasonably well to the bushfire prone land (discussed above). No amendment to the proposed 5ha minimum lot size is recommended to enable the future subdivision pattern and lot sizes to conserve and reflect environmental values of the land in accordance with the lot averaging provisions. · There is a discrepancy between the lot sizes on the conceptual subdivision layout and the proposed minimum lot size for the land. 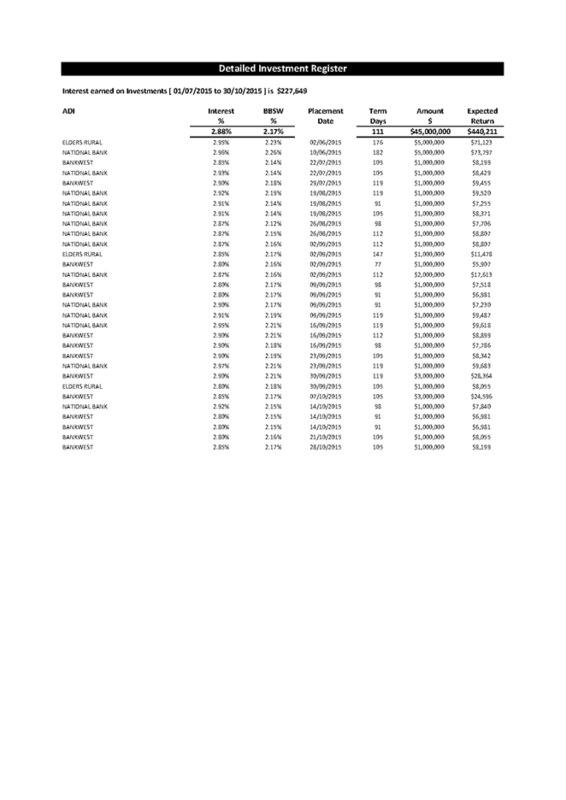 The “discrepancies” occur due to the use of the lot averaging clause. 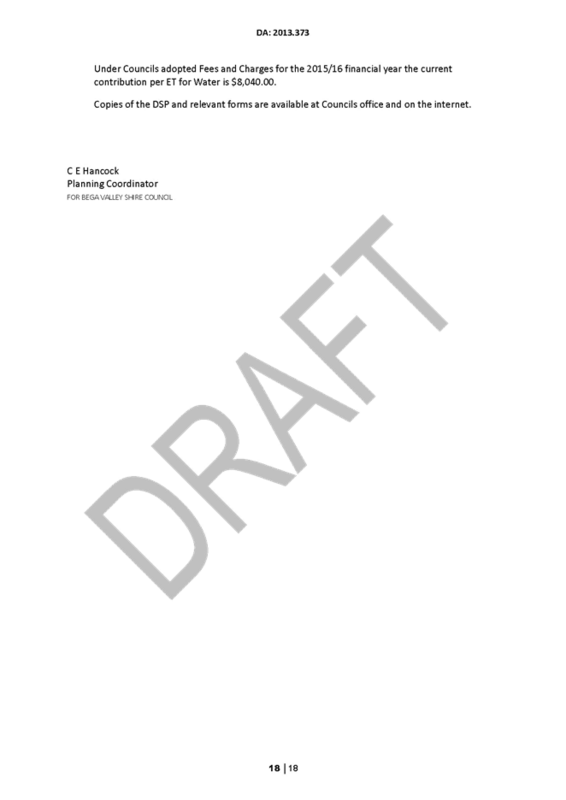 It is noted that subdivision concept plans are not endorsed by the planning proposal process. Public and agency consultation of the planning proposal has been completed and a range of issues have been raised in submissions. 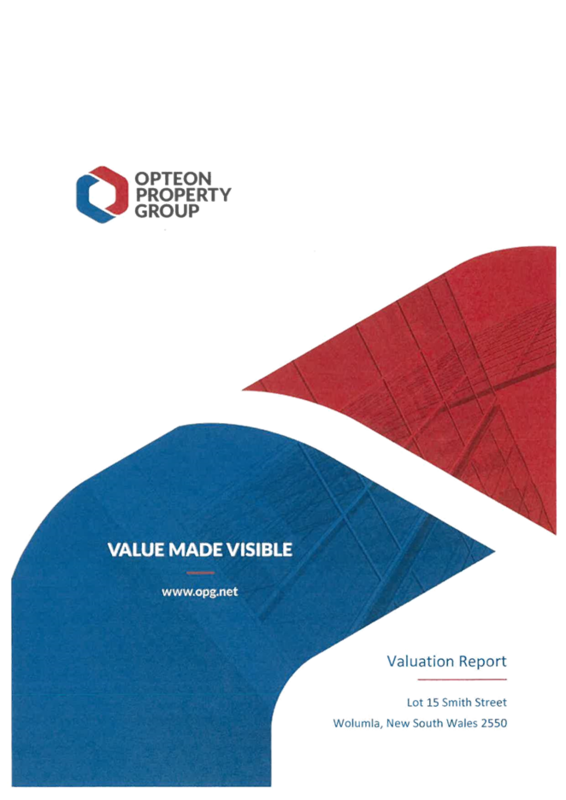 The issues involving the potential loss of privacy and quality of life of adjacent residents can be mitigated at the detailed subdivision design stage through the provisions of the Bega Valley Local Environmental Plan 2013 and Development Control Plan 2013. The RMS is satisfied with the proposed access, the applicant has adequately demonstrated the site is suitable for on-site effluent disposal at the scale of development proposed, and concerns regarding security of water supply are addressed through an existing (and continuing) restriction on the title of the subject land. Council staff is of the opinion a suitable subdivision design in the order of 10 lots is achievable on the site that meets bushfire requirements and adequately addresses potential environmental impacts including those regarding native flora and fauna. 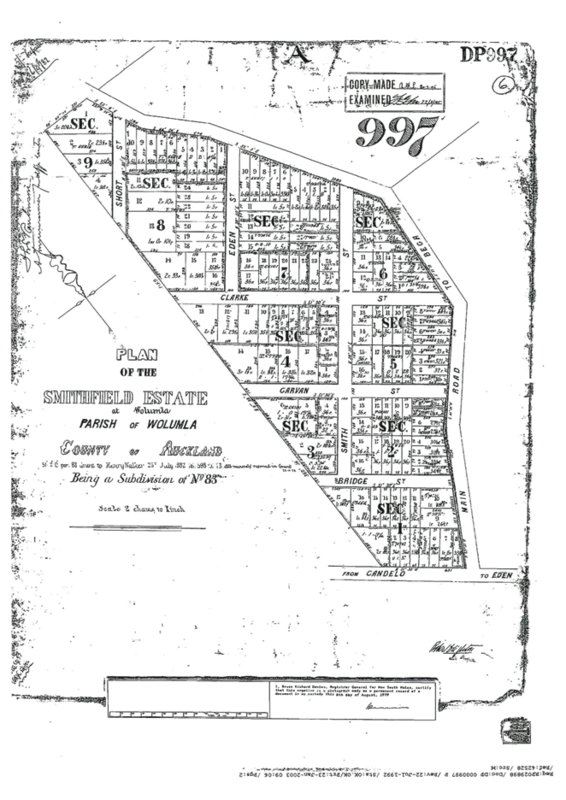 It is recommended the proposed minimum lot size of 5ha is not altered, but that the land be zoned a combination of R5 large Lot Residential and E4 Environmental Living as illustrated in Figure 3 of this report to recognise the environmental values of the northern portion of the subject land. 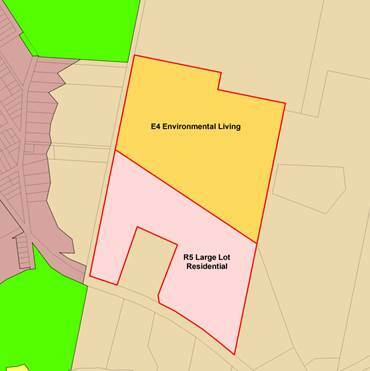 The proposed amendment of part of the proposed R5 zone to E4 is considered minor and does not require re-exhibition of the planning proposal. As such, Council can proceed to finalise the plan in accordance with the delegations issued by the Minister for Planning and Environment under Section 59 of the Environmental Planning and Assessment Act 1979. 1. 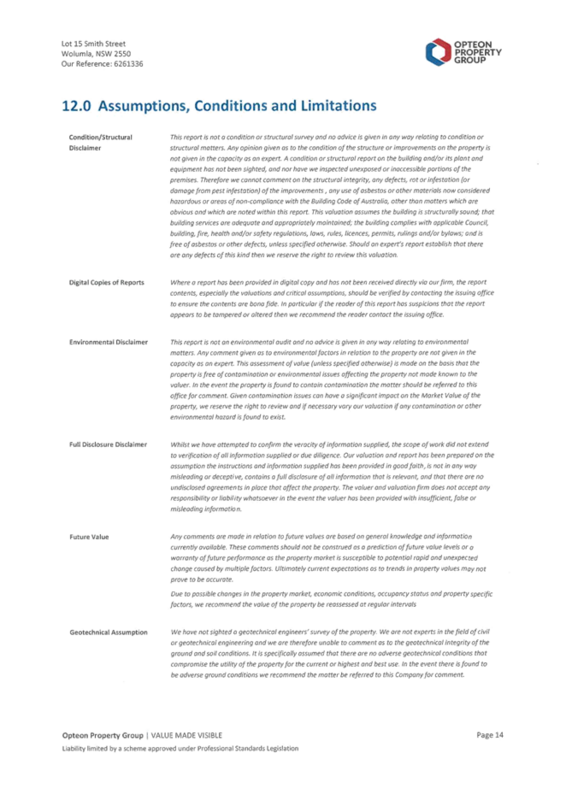 That Council resolves to adopt the amendments to Bega Valley Local Environmental Plan 2013 subject to the minor alterations contained in Figure 3 of this report. 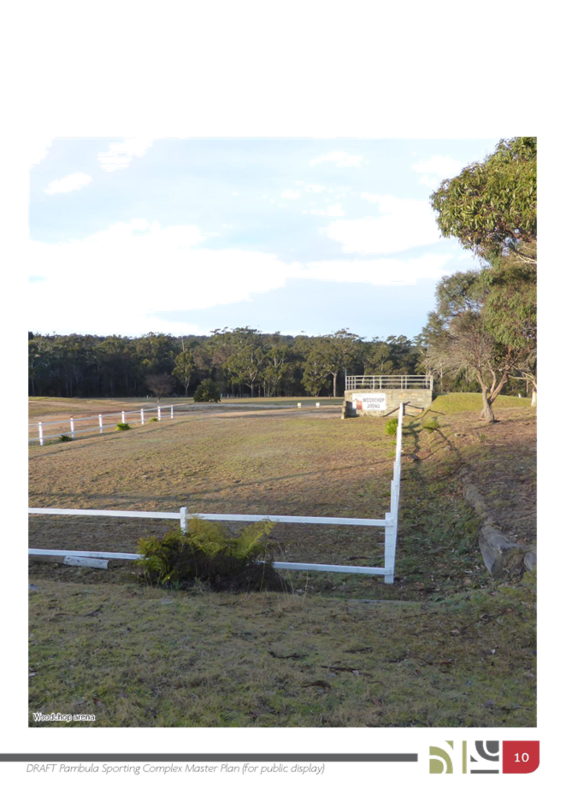 The application for a 33 lot subdivision, being Stage 2 of Tathra River Estate, was deferred at the Council meeting of 14 October 2015 to enable staff to provide Council with additional information in relation to matters raised in addresses. 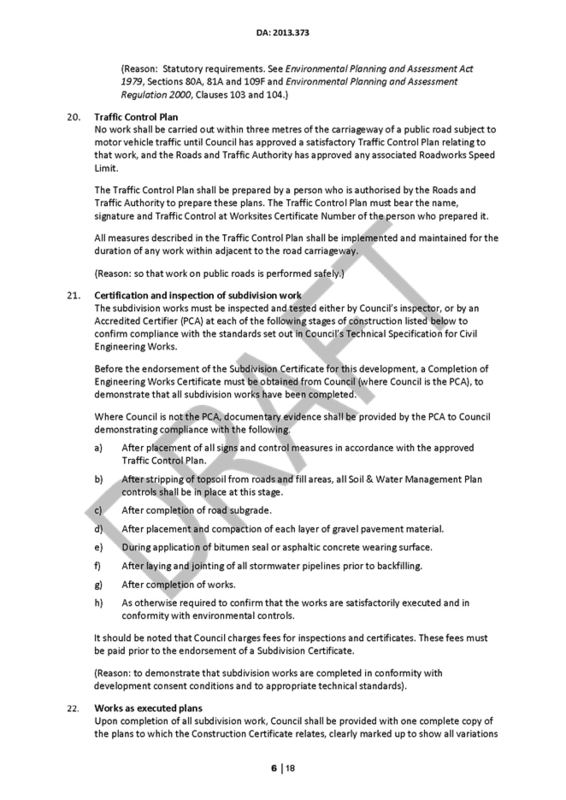 This report provides additional clarification on those issues and provides an amended Draft Consent for Council’s consideration. 1. 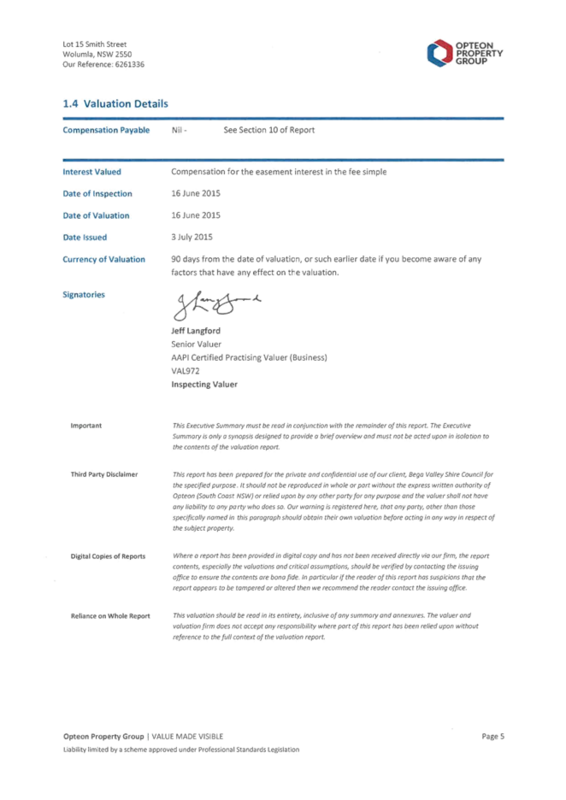 That Development Application 2013.373 for a 33 lot subdivision at Lot 2 DP 582074 Thompson Drive, Tathra be approved subject to conditions as provided as Attachment 5 to this report. 2. That those persons who made a submission be advised of Council’s decision in this regard. The proposal consists of the subdivision of Lot 2 DP 582074 into 32 allotments, varying in size from 3,987.3m2 to 17,692m2 with a proposed reserve dedication of 22.16 hectares and a residue allotment of 74.70 hectares. The proposed subdivision would be constructed in two parts, with the first stage comprising Lots 1-18 and the second stage comprising Lots 19-32 plus the residue lot and reserve dedication. 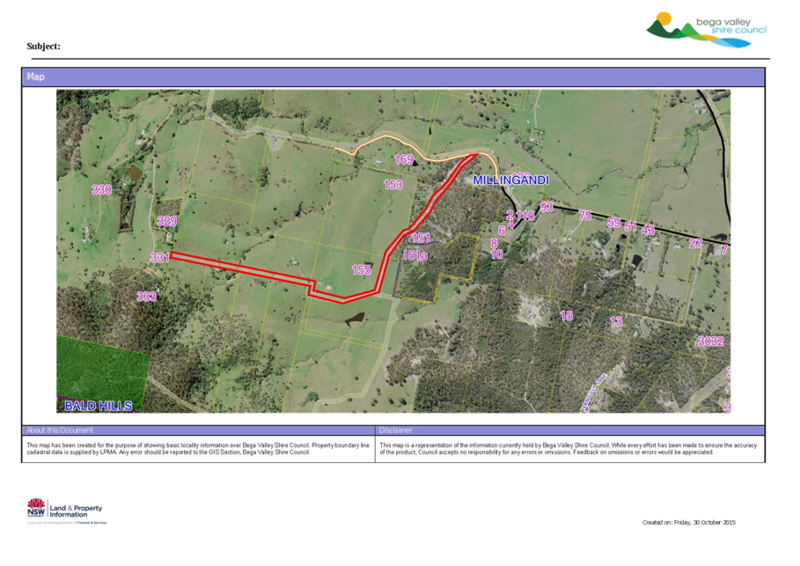 It is proposed all access to the subdivision will be provided via Thompson Drive from Tathra Road. Internal access will be via a number of new roads off Thompson Drive and Wheeler Avenue. 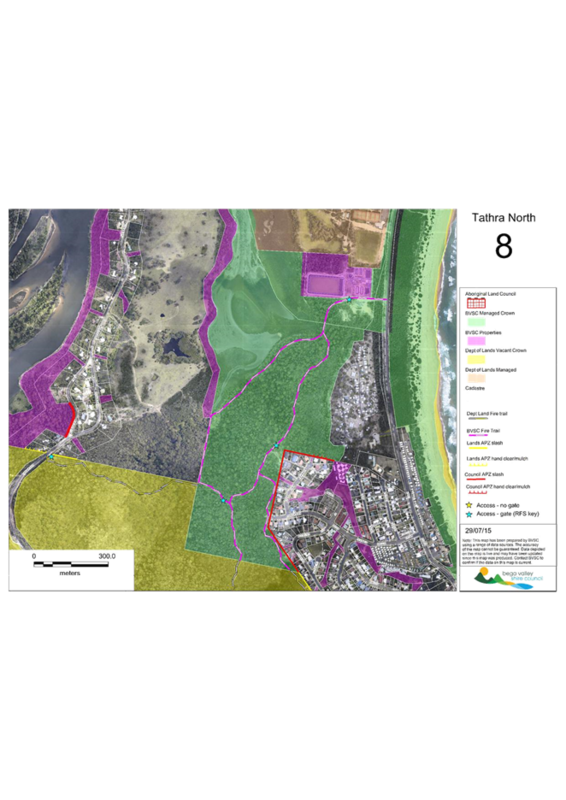 The site comprises a total of 130 hectares located on a peninsula between the Bega River Estuary and Blacka Ada Swamp. 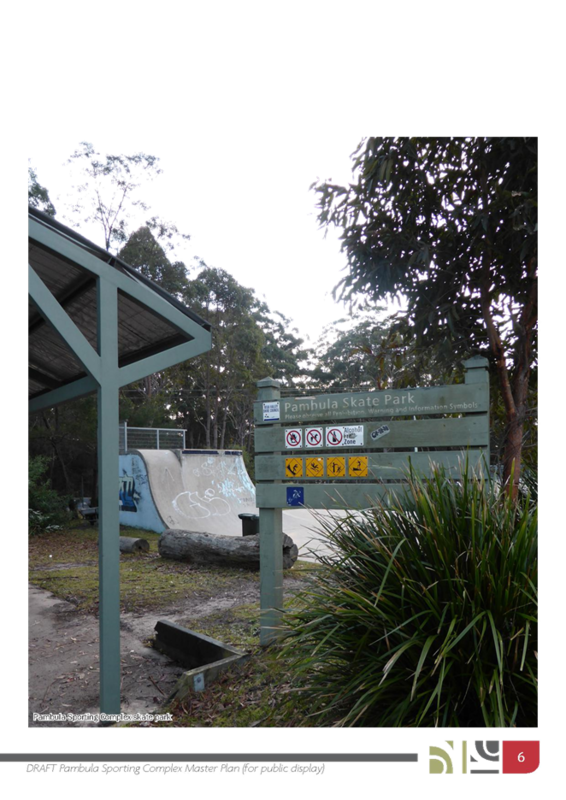 The land adjoins 63 residential allotments that were previously developed along Thompson Drive and is known locally as Tathra River Estate. The land that is the subject of this Development Application (DA) is located to the north and east of the existing residential development. The land is dominated by an elevated ridge crest visible from surrounding areas, the Bega River and the coast. The topography generally slopes to the Bega River and adjoining coastal wetlands (identified under SEPP14 – Coastal Wetlands). It is a sensitive coastal location as identified by SEPP 71. The site has been extensively cleared with a long history of grazing. 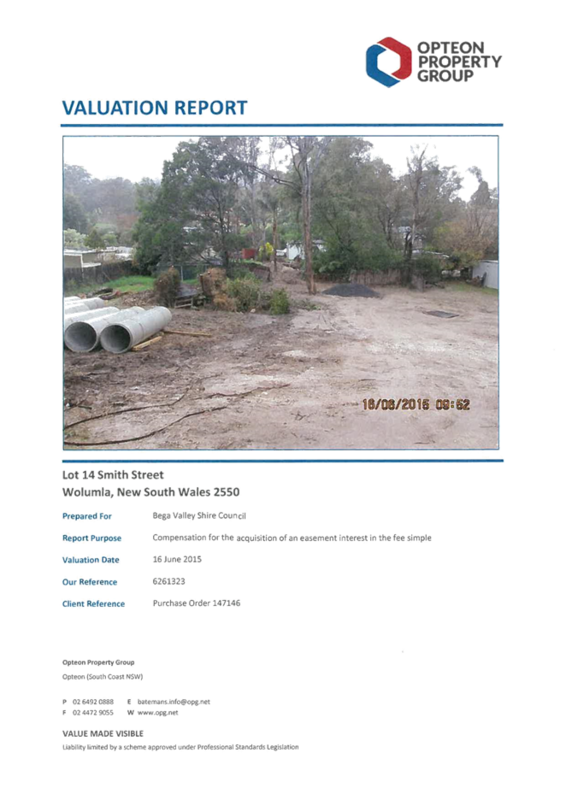 The staff advice to the developer, since pre-lodgement discussions, has been that our best practice position, based on previous advice from NSW Health and the Environment Protection Authority, is that subdivisions which rely on onsite effluent disposal should not be connected to a reticulated water supply. The basis of this position is that where an unlimited water supply is available, additional pressure is placed on disposal systems to accommodate the wastewater generated from those developments. As such, the applicant presented for Council’s consideration a stand-alone subdivision in terms of water and sewer servicing. There is capacity for the proposed subdivision to connect to reticulated water. The subject land is currently outside of the Development Servicing Plan for Water Supply (DSP) area, however Council’s engineering staff have confirmed there is capacity to accommodate the proposed 33 allotments. 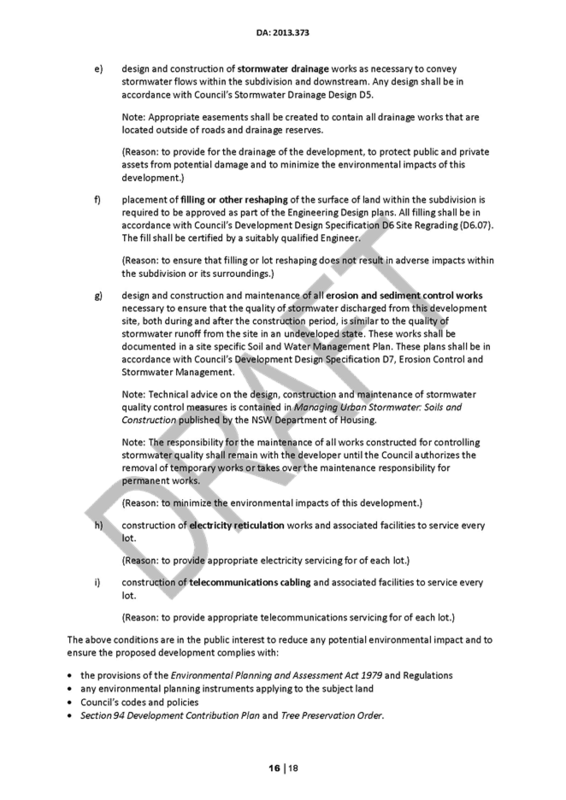 Clause 5.8 of the Water Development Servicing Plan states that new developments may be proposed outside of the boundary of the DSP and provided there is no planning or other constraints to the development, Council may approve construction of essential assets to service such a development. The cost of servicing the development must be at the full cost of the developer in addition to standard Section 64 Contributions per allotment. 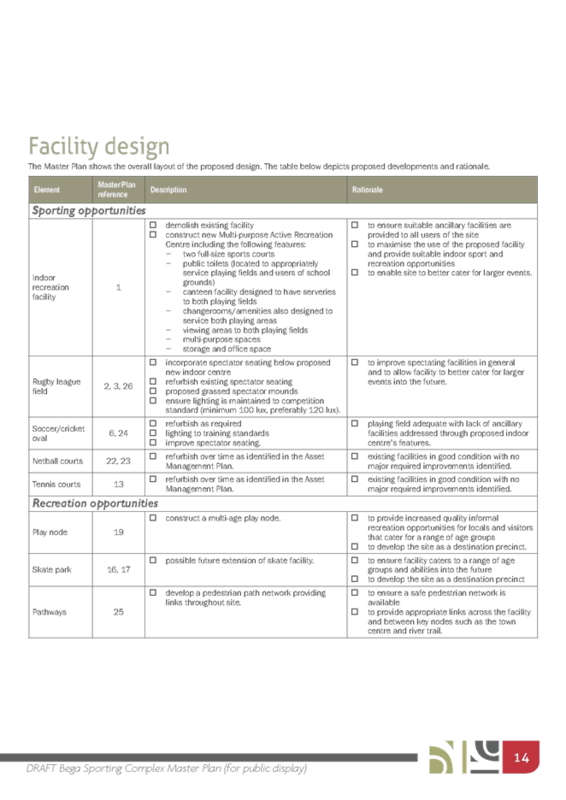 Staff sought clarification from the applicant in relation to the design capacity of the proposed systems of effluent management, as detailed in the Water Cycle Management Study prepared by SEEC, September 2013. SEEC have responded confirming the systems have been designed in accordance with Council’s DCP 2013 to cater for 1000 litres of water per day. A review of water consumption rates for the existing 63 dwellings within Tathra River Estate showed the average water consumption over the last three years has been 443 litres per day. SEEC submit there would be no difference in efficiency or operational capacity of the proposed effluent disposal systems using rainwater harvesting or a reticulated water supply. 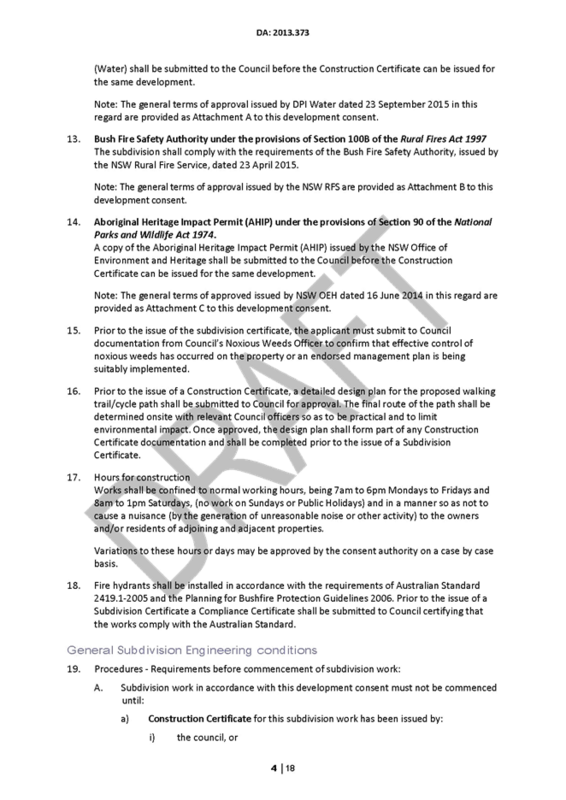 As such, should Council resolve to approve the subdivision, additional conditions of consent have been inserted into the Draft Consent requiring construction and supply of reticulated water infrastructure, including the provision of water hydrants, and payment of Section 64 contributions (see amended draft consent conditions 18 & 33- 36 and Advisory Note 8 provided in Attachment 1 to this report). 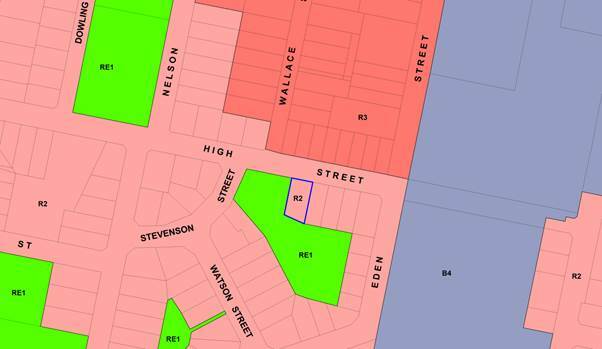 Council staff has assessed the proposed subdivision as a rural residential style subdivision, even though the current zoning of the land is urban. This is on the basis the strategic direction for this land indicates large lot residential development is appropriate for the character and topography of the site. As such, staff were comfortable with the provision of overhead electricity within the subdivision, which would link to the existing overhead electricity provided in the existing estate. 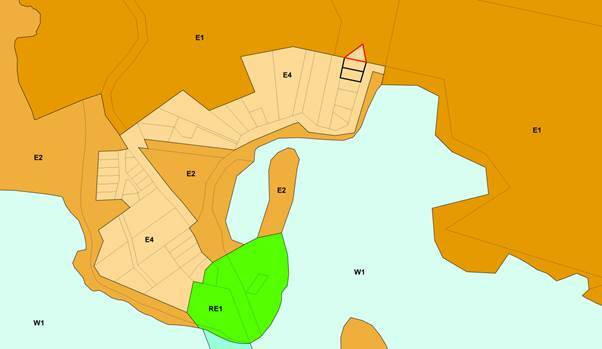 “Please be advised that our client has arranged for initial electricity reticulation designs for this subdivision. These designs have been based upon underground extension of power throughout the subdivision which is over and above Bega Valley Shire Council’s subdivision requirements”. The development must be provided with underground electricity infrastructure. A Notification of Arrangement letter issued by the relevant electricity supplier is to be obtained and forwarded to the Principal Certifying Authority prior to the issue of a subdivision certificate. In relation to the provision of stand-alone electricity supply (e.g. solar or wind generation), there is opportunity for any future landowner to submit a proposal for a stand-alone system that is not connected to the grid. The provision of a reticulated water supply servicing the proposed subdivision would generally eliminate the need for large rainwater tanks. The requirements of BASIX would still result in rainwater harvesting requirements (normally for use in toilet flushing and use on landscaping) however the tank size would likely be much smaller. It is noted that future landowners may still choose to install larger sized rainwater tanks and the placement and visual impact of such would normally be assessed at the time of lodgement of the dwelling house applications. Council has responsibility for maintenance of the fire trail network in and around the urban areas of the Shire where Council is either the landowner or Trustee of the reserve network. As detailed in the report to Council of 14 October 2015 there is an existing fire trail network that traverses Crown reserve land to the east of the subdivision and through to Tathra-Bermagui Road, which is currently maintained by Council as Trustee of the Reserve. 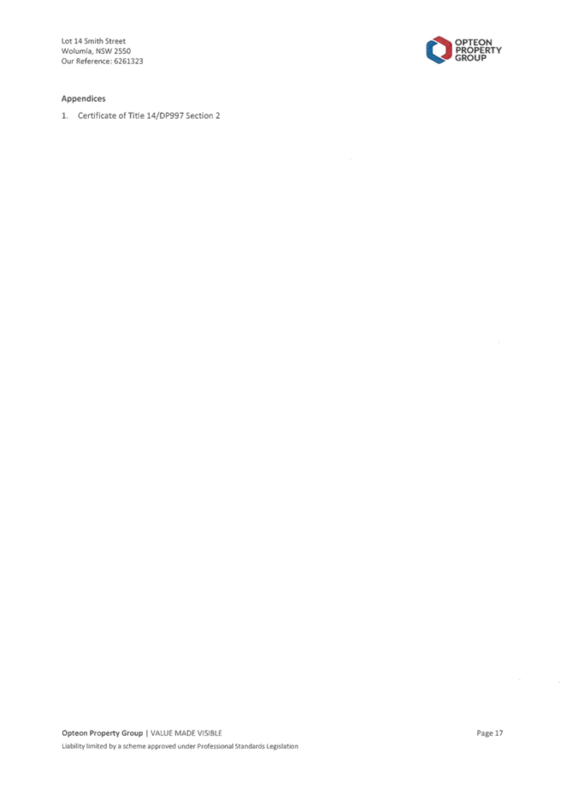 Attachment 2 to this report provides a map indicating the fire trail network adjoining the subject site. This fire trail network is on Council’s monitoring schedule and receives maintenance works as required. The proposed development meets the objectives of the zone, is a permissible land use, is considered to achieve the orderly and economic use and development of land (consistent with the objects of the Environmental Planning and Assessment Act 1979) and is consistent with the SEPP 71 masterplan for the land. 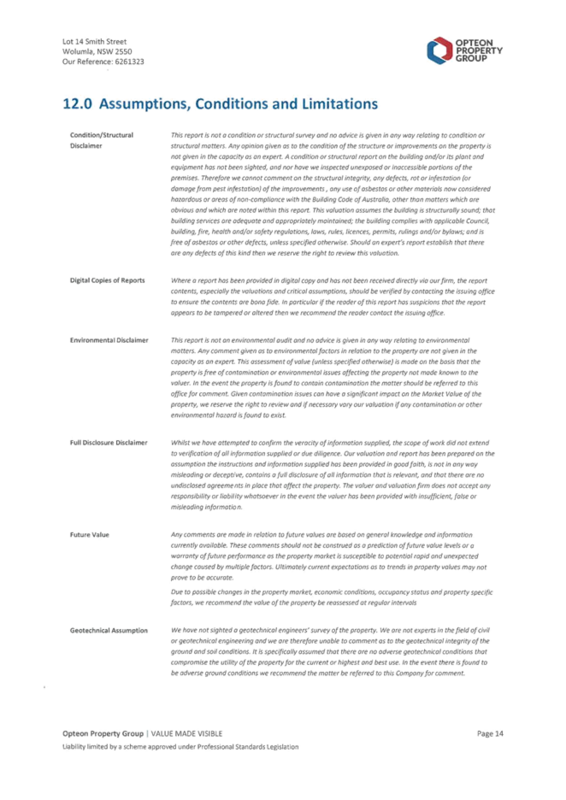 A wide range of impacts have been identified in the assessment of the application and, where appropriate, suitable mitigating measures have been identified, either through the provision of revised plans and additional information from the applicant, or through recommended consent conditions. In considering all relevant matters under Section 79C of the Environmental Planning and Assessment Act 1979, the proposed development would be suitable for the subject site and approval of the application would be in the public interest. 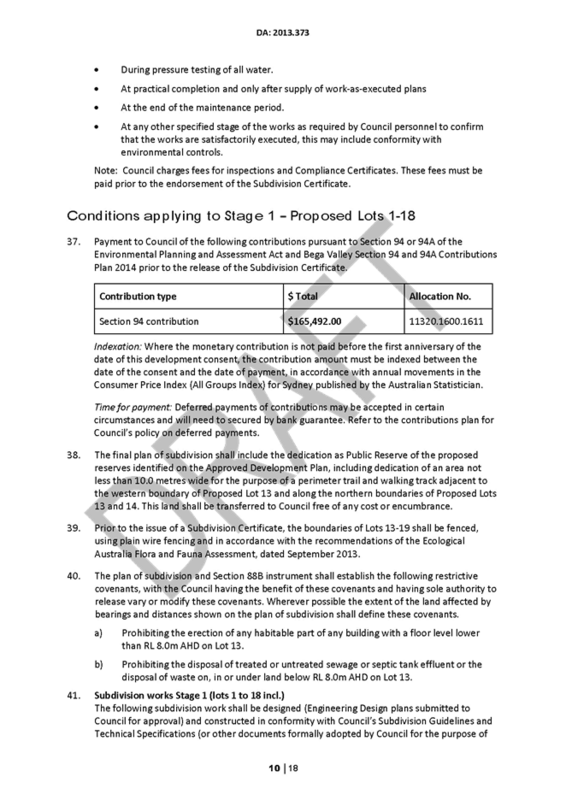 Approval of the development is recommended subject to conditions provided in the draft consent as Attachment 1 to this report. 1. 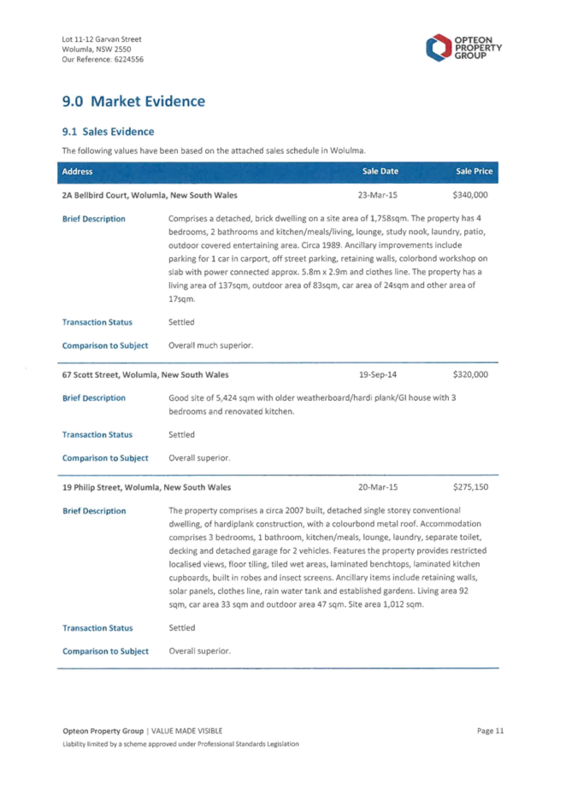 That Development Application 2013.373 for a 33 lot subdivision at Lot 2 DP 582074 Thompson Drive, Tathra be approved subject to conditions as provided as Attachment 1 to this report. 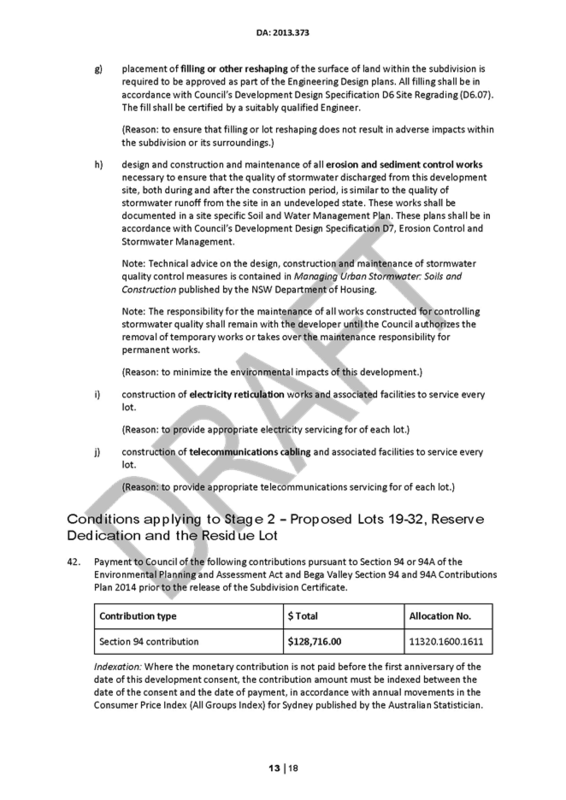 The purpose of this report is to detail the outcomes of the public exhibition and government agency consultation and to finalise the amendment to Bega Valley Local Environmental Plan 2013: Minor Amendments No. 3 involving various properties. “1. 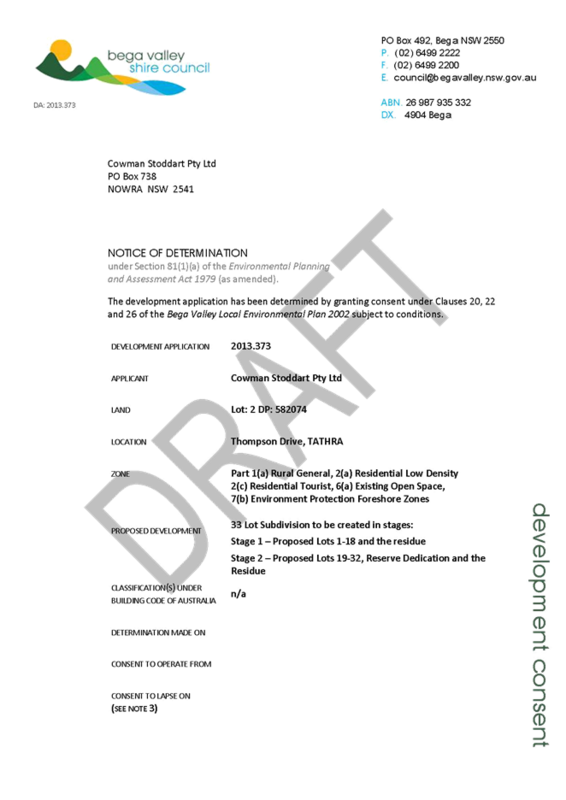 That Council staff prepare a Planning Proposal to amend Bega Valley Local Environmental Plan 2013 and associated maps in accordance with the recommendations contained in the body of this report. The objective of the planning proposal is to rectify a number of minor zone and lot size map anomalies affecting land in Glen Mia Estate and High St Bega, Wonboyn and Mogareeka and inconsistencies within the R2 Low Density Residential and R3 Medium Density Residential land use tables. Council received a Gateway Determination for the planning proposal on 11 September 2015 from NSW Planning and Environment and delegation of the functions of the Minister for Planning and Environment to make the plan. In accordance with the Gateway Determination, the planning proposal was placed on public exhibition for 14 days from the 2 to 16 October 2015. Council staff received several telephone and counter enquiries from the community regarding the planning proposal, particularly in relation to Glen Mia Estate Bega and Wonboyn, however only four written submissions were received. A submission was also received from the NSW Rural Fire Service. The exhibition of the planning proposal included notification on Council’s website, in local newspapers, in writing to affected and adjoining landowners and the Bega and Eden Local Aboriginal Land Councils. The agency submission received by Council to the planning proposal as well as the issues raised in the four public submissions are summarised and discussed below. · The NSW Rural Fire Service raised no concerns or issues with the planning proposal in relation to bush fire. Currently Health Consulting Rooms are permitted in the R2 Low Density Zone with consent. The planning proposal aims to amend the land use table by removing Health Consulting Rooms as a permitted use in the zone. 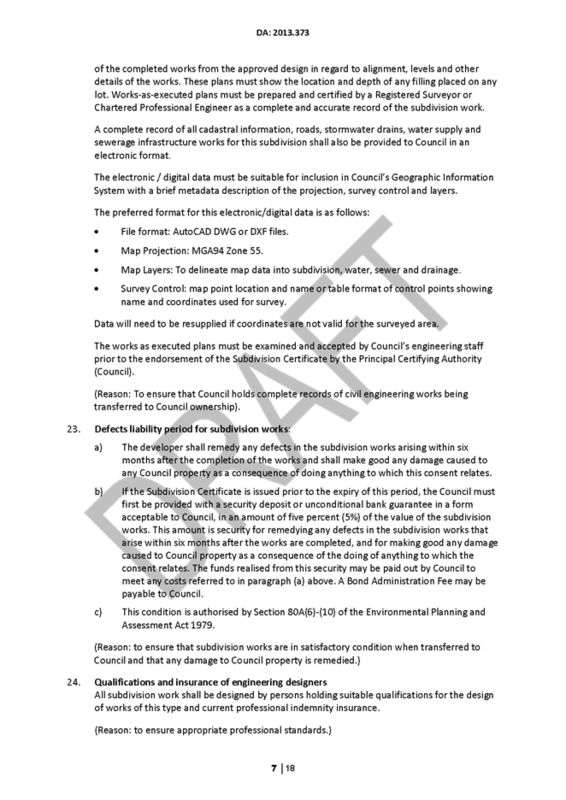 · No public submissions were made to the Planning Proposal in relation to this part of the planning proposal. Currently Business Premises are a permitted use with consent in the R3 Medium Density Zone. 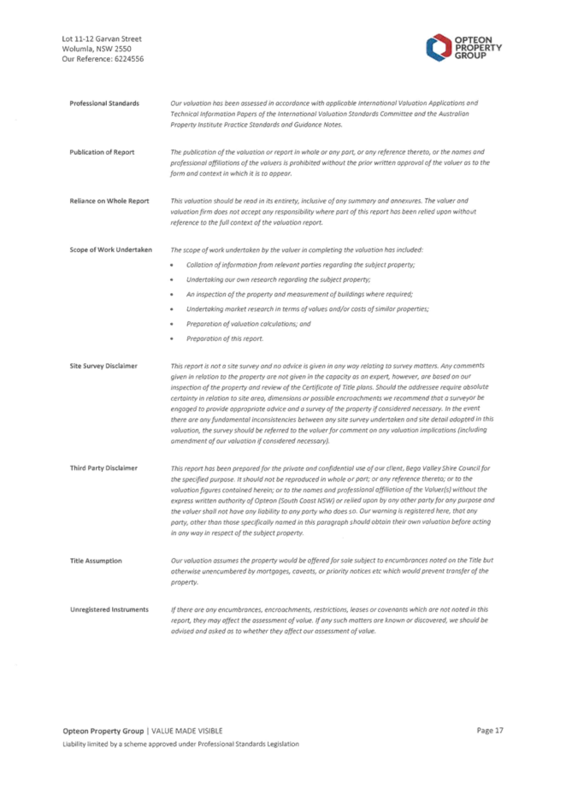 The planning proposal aims amend the land use table to list Businesses Premises as a prohibited use in the R3 zone. The planning proposal aims to amend the minimum lot size for part of Wonboyn village that currently has a 1,000sqm minimum lot size to 2,000sqm. The purpose of the amendment is to be consistent with clause 4.1A of BVLEP 2013 and Council’s adopted minimum lot size for all unsewered residential land, which requires a minimum of 2,000sqm. · One public submission was made in relation to this land by the owners of Lot 154 DP 812002 raising concerns that the planning proposal may change current Council guidelines regarding on-site effluent disposal systems on blocks smaller than 2,000sqm or affect their building options in the future. Lot 154 DP 812002 was created for the purposes of a dwelling and despite being under the current 2,000sqm standard for dwellings on unsewered lots, a dwelling can be approved on the lot under the provisions of BVLEP 2013 where Council is satisfied a suitable on-site sewage management system could be designed for the subject lot. There is only one other affected vacant lot that is less than 2,000sqm and Council is currently determining a Development Application for the erection of a dwelling on the lot. The planning proposal aims to amend the minimum lot size for that portion of the Glen Mia Estate in Bega with lot sizes in excess of 1,000sqm from 550sqm to 4,000sqm to reflect the intention of the original consent and give a clear indication of the subdivision development potential of the land. 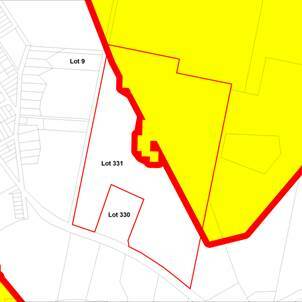 · One submission signed by the owners of three Glen Mia Estate lots suggested the minimum lot size should be 5,000sqm instead of 4,000sqm to prevent further subdivision and attached a copy of the 88B instrument applying to their land which states that “No lot shall be further subdivided”. · A second submission requested permission to subdivide their lot in the same style as their neighbour. · The third submission questioned the rationale behind the 4,000sqm figure given that water, power, sewer and roads are provided in the Glen Mia Estate and villages have a minimum lot size of 1,000 or 2,000sqm and stated a preference for a 1,000 or 2,000sqm minimum lot size to apply. In addition to the written submissions, Council staff received several telephone calls as well as counter enquiries from residents, the majority of whom supported the planning proposal in relation to Glen Mia Estate. The majority of these existing owners bought into the Estate believing the amenity and character of the area would be retained and there is widespread support for retaining the current subdivision pattern. 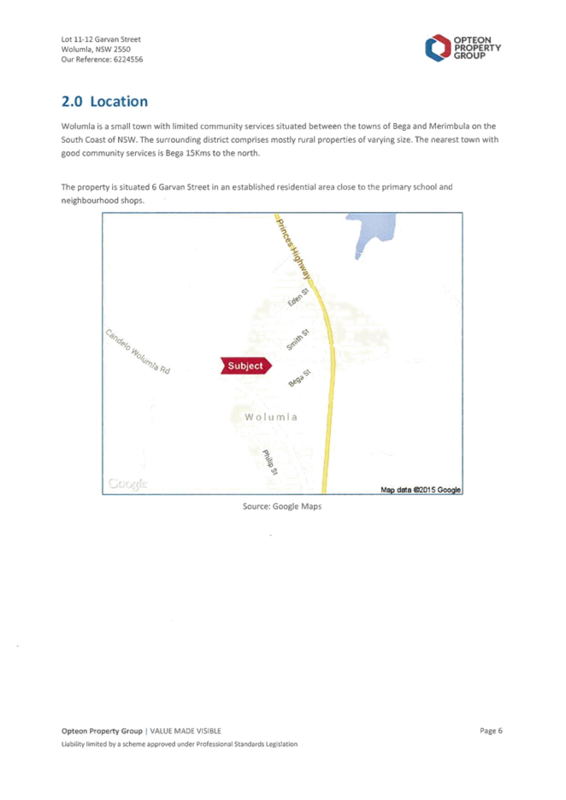 The original application for the 156 lot subdivision of Glen Mia Estate stated that: “the application represents the final residential development of this parcel”. 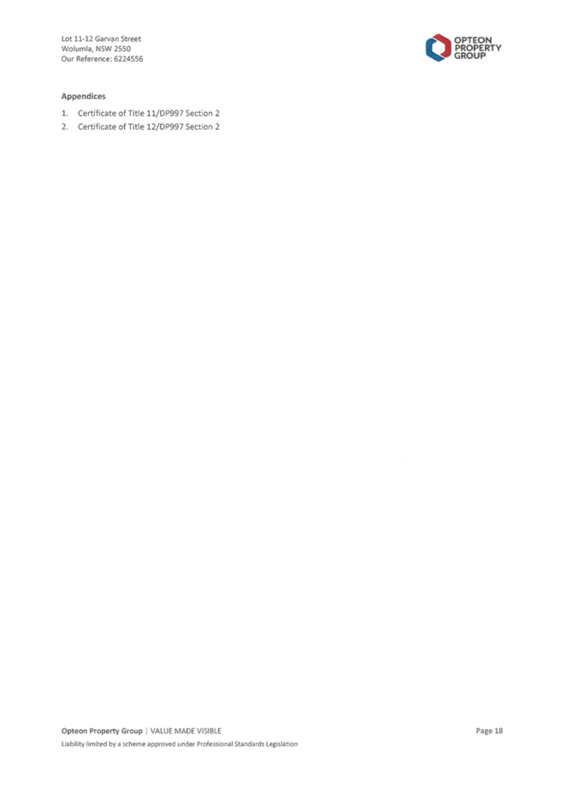 On approving the subdivision at the meeting of 23 September 2003, Council considered a submission that the lot sizes are excessive and the lot yield did not reflect the potential of the land. The approved subdivision was the subject of extensive discussions and environmental reporting. 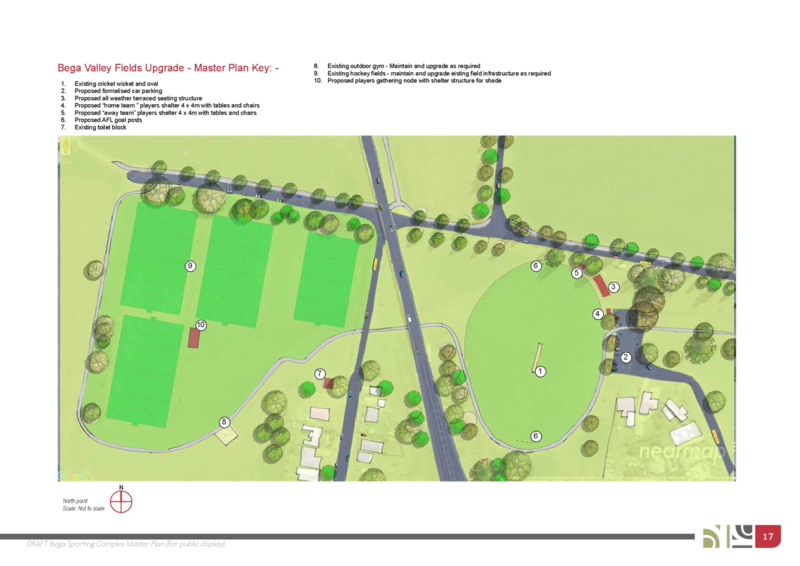 The proposed lot yield and configuration directly reflects the lands capability to support residential development and takes into account the site characteristics, flora and fauna, engineering and heritage issues, including the location of aboriginal scar trees. The rationale behind the decision to amend the minimum lot size to prohibit further subdivision in the Glen Mia Estate was intended to maintain the amenity of the existing residents and align BVLEP 2013 with the original subdivision yield and layout as approved by Council. There are also limitations on any extension of the existing sewage infrastructure that was installed to meet the capacity of the original subdivision layout. The planning proposal aims to rezone Lot 1 DP 377455 which is privately owned from RE1 Public Recreation to R2 Low Density Residential and apply a 550sqm minimum lot size and 0.5:1 floor space ratio in keeping with the surrounding land to accurately reflect the tenure and use of the land. The planning proposal aims to rezone Lot 304 DP 821500 which is privately owned from E1 National Park to E4 Environmental Living with a 2,000sqm lot size in keeping with the surrounding land to accurately reflect the tenure and use of the land. Public and agency consultation of the planning proposal has been completed. 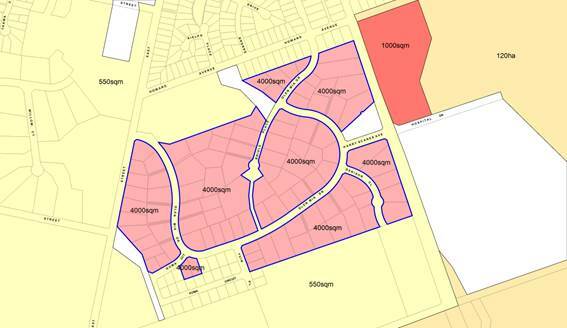 Following a review of the issues raised in the submissions relating to minimum lot sizes in Glen Mia Estate Bega and part of Wonboyn Village, it is considered no changes are necessary to the planning proposal as exhibited. It is recommended Council proceed to finalise the Plan in accordance with the delegations issued by the Minister for Planning and Environment under Section 59 of the Environmental Planning and Assessment Act 1979. 1. 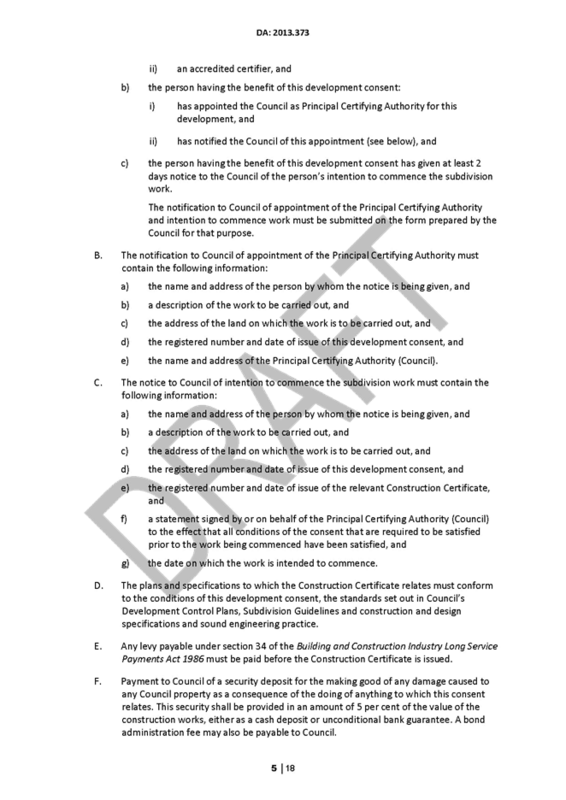 That Council resolve to adopt the amendments to Bega Valley Local Environmental Plan 2013 as exhibited in the Planning Proposal: Minor Amendments No. 3. 2. That, using the delegations issued by the Minister for Planning and Environment, Council proceeds to finalise the plan under section 59(2) of the Environmental Planning and Assessment Act 1979. Councillors and Council officers continue to receive enquiries to extend the lifeguarding services within the Shire. Funds are available through the Lifeguarding Special Rate Variation to provide an extension to services. This report seeks a resolution from Council in relation to how this program should be extended on the basis of risk management and recommendations from the Australian Lifeguard Service. Council provides professional lifesaving services at seven beaches across the Shire during the January school holiday period. In 2015 the service ran from 26 December 2014 to 27 January 2015. The services are delivered via a contract with Australian Lifeguard Service (ALS) (the professional arm of Surf Life Saving NSW). The annual lifeguarding service is funded through a recurrent Special Rate Variation (SRV) for the specific purpose of providing lifeguard services. The SRV amount for 2015/16 is $184,000. The money is used to provide services at the busiest time of year and, in doing so, helps to manage hazards and risks for the increased numbers of beaches goers during that time including both residents and visitors. In February 2015, a trial was undertaken to extend the Council lifeguard service at Tathra Beach. The proposal to extend the service was put forward by the Tathra Chamber of Commerce to promote Tathra as a beach holiday destination outside of the traditional Christmas and New Year holiday period. The service ran from 1 February 2015 to 28 February 2015 and the cost was $12,950 including GST. Council facilitated the extension of service through a variation of its existing contract with ALS. The cost of the extension was funded through a Southern Phones grant ($3,000) and the balance contributed by local business through the Tathra Chamber of Commerce. There is currently a three year contract in place with ALS and changes to the contract are managed through formal variations. This report seeks to formalise Council's position in regard to proposed lifeguard service extensions. 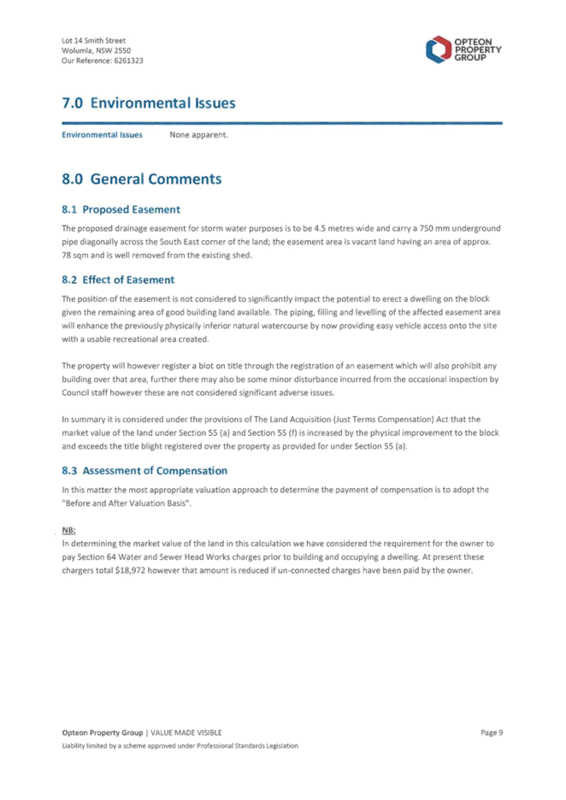 · Fundamentally the service is a hazard and risk management control strategy. Key risk management considerations are: beach conditions; site popularity and user numbers; and incident responses. 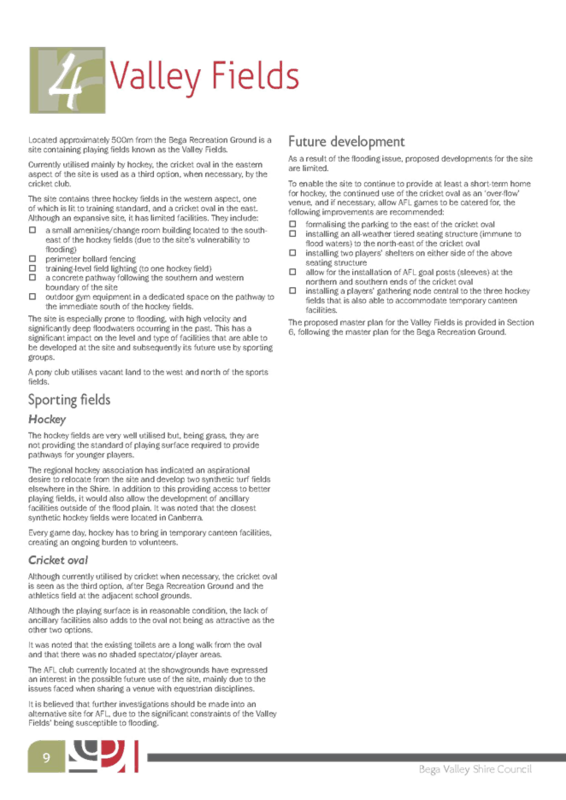 These risk factors should be the basis to determining Council services and in turn Council funded extension of services. · The SRV to fund the primary service is paid for by property owners. While it is important that the potential tourism and economic benefits are considered, it is also very important that a significant number of Shire residents are able to take advantage of the services funded through the SRV. · Both the above items lead to a preference for service extensions being during ‘warmer water’ holiday periods that will benefit both residents and visitors. These weeks would be the week leading to Christmas or the April / Easter holiday periods (noting potential differences between NSW and Victoria holidays). · If the SRV does not cover the total cost of Council funded services, the shortfall would need to be funded through a decrease in services in other leisure and recreation areas, or raising additional funds. 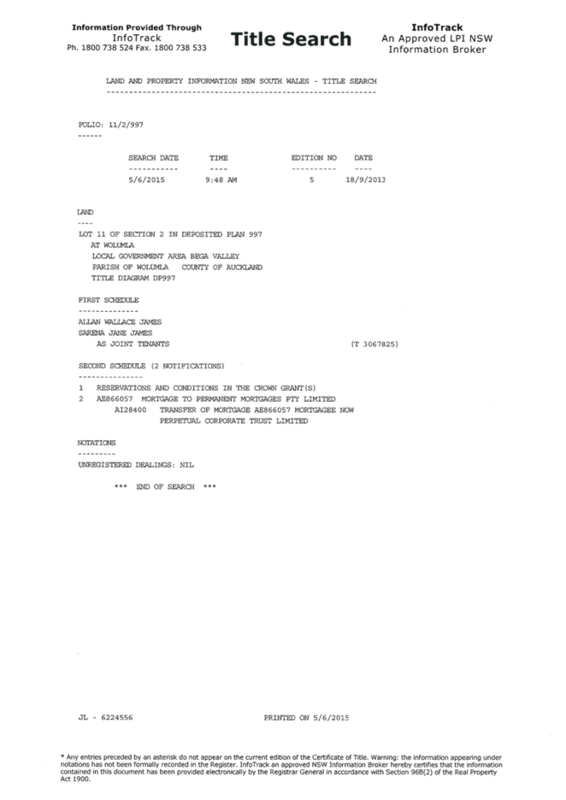 · Where the benefit is primarily an economic one (i.e. limited opportunities for residents to benefit) the beneficiaries should be primarily accountable for covering the costs of the services, however Council can facilitate an extension through its existing contract arrangement, noting no additional Council funding is available to extend services. The Bega Valley Shire covers approximately 225km of coastline. Within the Shire there are 101 ocean beaches. While the coastline is large our beach management resources are relatively modest. As such Council only provides lifeguard services on seven beaches in the Shire. Local surf lifesaving clubs provide full weekend supervision during the summer period and partial weekend services from October to early April. Under their current contract ALS provide detailed reports to Council at the end of each summer season. A key part of the report is the recommendations made by ALS to improve services. These are based on a hazard and risk management approach considering location, beach popularity and user numbers, beach conditions and incident responses. 1. Explore the means to fund an additional lifeguard at Bar Beach, taking the number of lifeguards serving this location to two lifeguards across the current coverage period. 2. Explore the means to fund an extension of all lifeguard services within the Bega Valley Local Government Area to cover all summer schools holiday periods. 3. Provide lifeguard services during the Autumn School Holiday periods, particularly at Merimbula. 4. Explore the means to fund the lifeguard services at Merimbula, Bar Beach, Short Point, Camel Rock and Aslings Beach to provide supervision on weekends (Saturday, Sunday and public holidays) until the end of February. These services should also provide coverage over the four day Easter holiday weekend. 5. Explore the means to fund mid-week patrols at Tathra and Pambula from the start of December to the end of February. The annual lifeguarding service is funded through a recurrent SRV for the specific purpose of providing lifeguard services. The SRV amount for 2015/16 is $184,000. The cost of the current contracted 2015/16 lifeguard service will be $157,605.45 (ex GST), which leaves $26,395 available. 2. $32,330 - extension of all lifeguard services within the Bega Valley Local Government Area to cover all summer schools holiday periods. 3. $70,285 (Non SLSC Beach x 5: $9,570.00; SLSC Beach x 3: $7,445) - lifeguard services during the Autumn School Holiday periods, particularly at Merimbula. 4. $51,655 - lifeguard services at Merimbula, Bar Beach, Short Point, Camel Rock and Aslings Beach to provide supervision on weekends (Saturday, Sunday and public holidays) until the end of February. These services should also provide coverage over the four day Easter holiday weekend. 5. $46,675 - mid-week patrols at Tathra and Pambula from the start of December to the end of February. Due to indexation in the SRV the budget amount for 2015/16 is $184,000. There is funding of $26,395 available to increase services. · Fully fund the ALS recommendation 1. 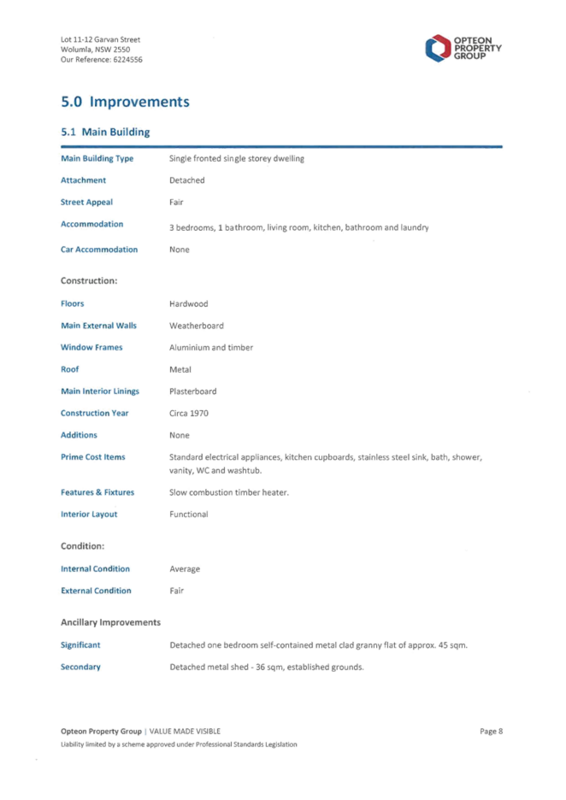 · Partially fund ALS recommendation 2. · A weekday service at beaches from the Monday before Christmas. · A weekend service at non SLS Club beaches the weekend before Christmas. Community Ambition L1: Well-being and safety. Outcome Area L1.3: Services provided to support lifesaving, rural fire service and State Emergency Service. 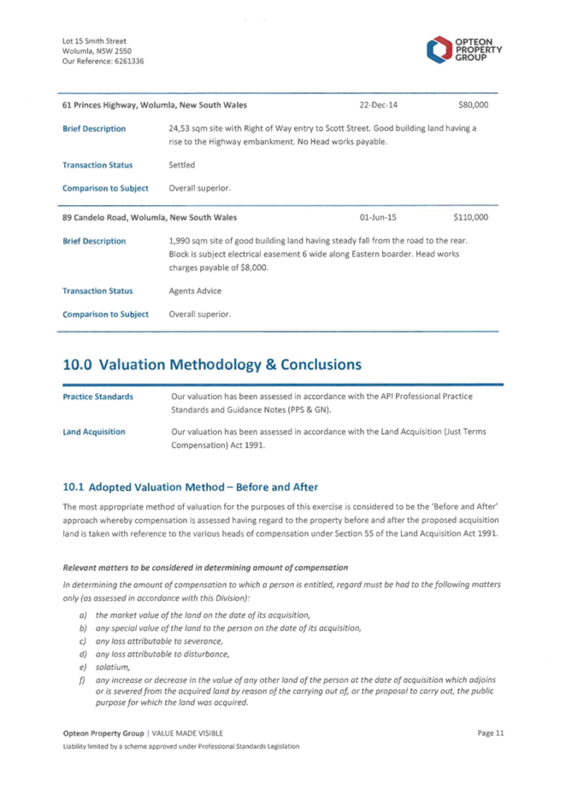 BVSC 2015 – 2016 Operational Plan: The review and delivery of the summer lifeguard services is identified within action L1.3.2 in the 2015/16 operational plan. The purpose of this report is to formalise Councils’ position in regard to proposed lifeguard extensions. The key objectives of the beach lifeguard services are related to hazard management, funding and resourcing, equity in service availability for residents, tourism and economic benefits. There are limits to the available funding and with this in mind the Australian Lifeguard Services have prioritised their recommendations for service improvement based on a risk and hazard management approach. 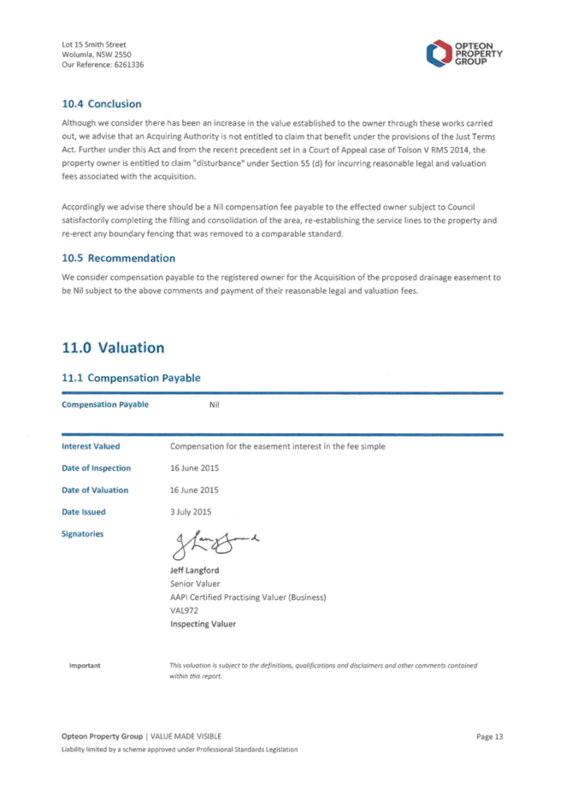 Recommendations to utilise the available funding have been based on the ALS information. b) Increase coverage of the summer school holiday days not currently patrolled (ALS recommendation 2). 3. That future increases in funds, raised through the Lifeguard Program Special Rate Variation, be utilised to increase lifeguarding coverage as outlined in this report. 4. That Council continue to support organisations and groups to sponsor extensions to lifeguard services via existing contract arrangements. 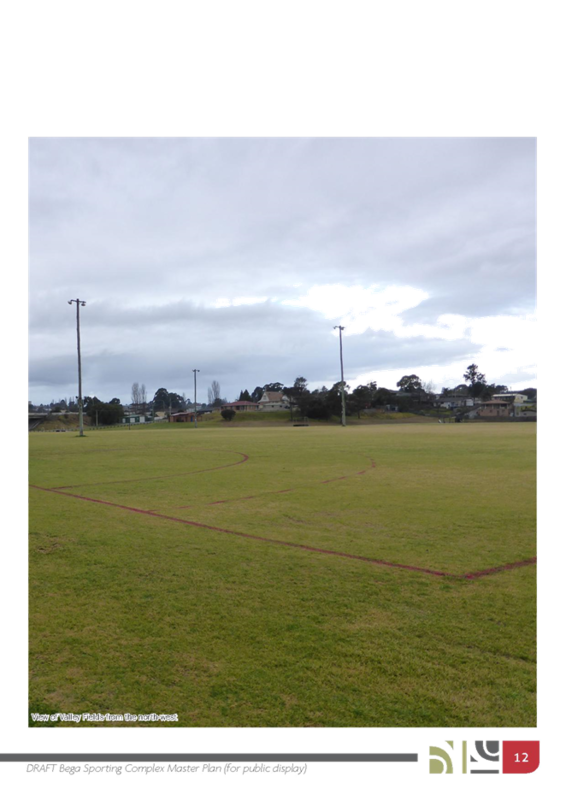 Council, in consultation with key users and stakeholders, has developed draft Master Plans to guide the future development of the two identified regional sports facilities at Bega and Pambula Beach. 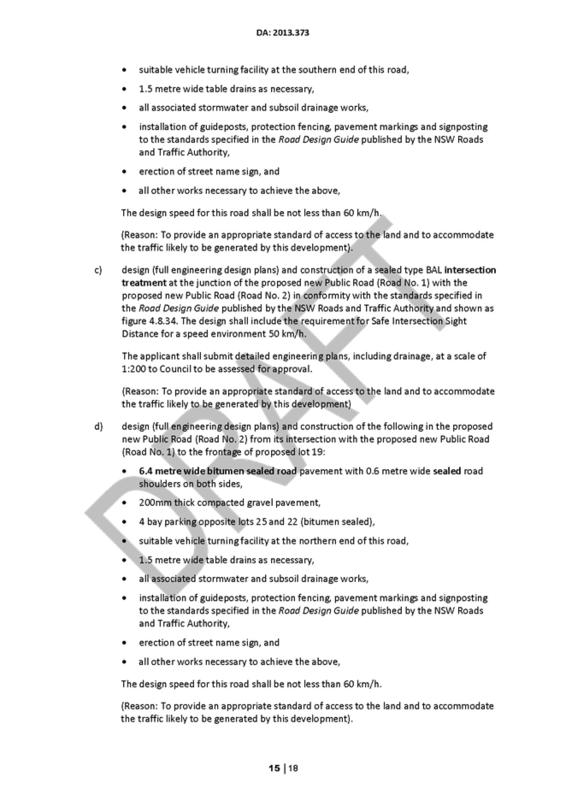 The draft Master Plans are now ready for public exhibition. 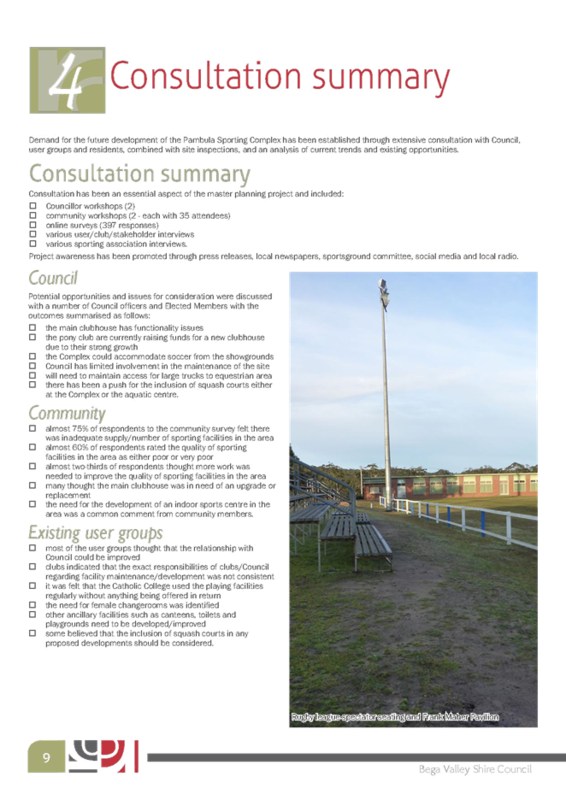 The aim of the Regional Sporting Facilities Master Planning project is to develop and adopt strategic planning documents for the two identified regional sportsgrounds located in Bega and Pambula Beach. 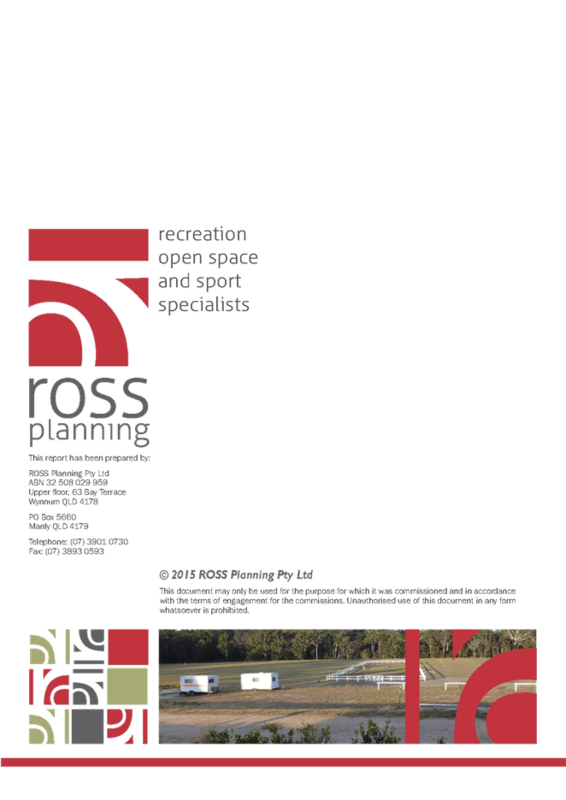 Master planning for both sites has been done concurrently by Ross Planning so the uses of the two sites can be discussed and defined to complement each other. 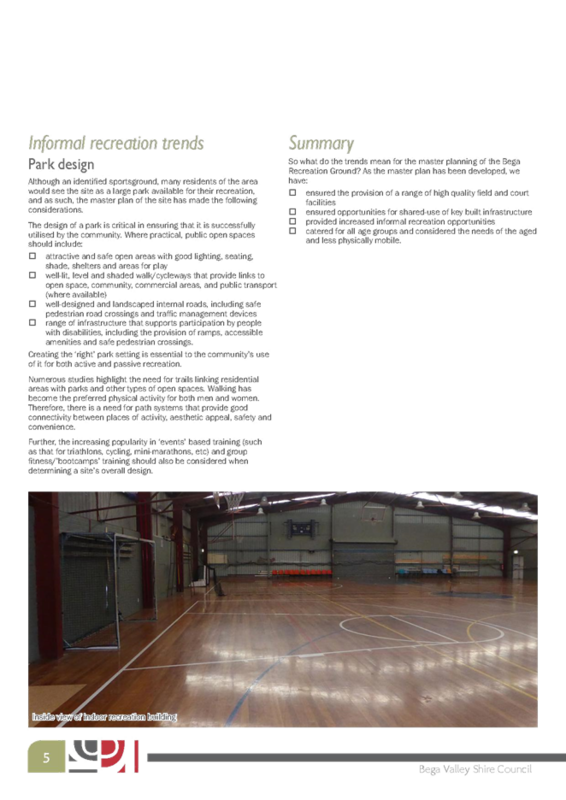 These Master Plan documents will guide the future use and development of regional sporting facilities to meet the current and identified future needs of the community. 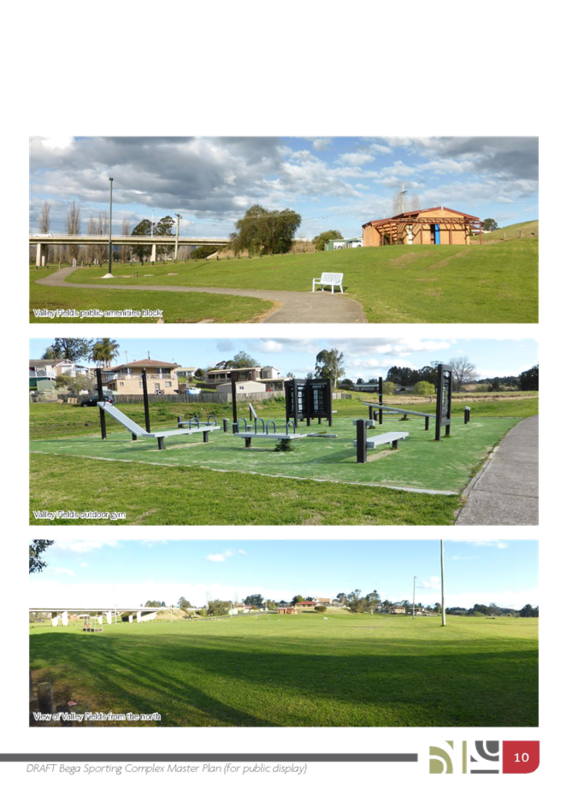 The area known as Bega Sports Complex (and Bega Recreation Ground) is a mix of Council owned community land and Council managed Crown Land. 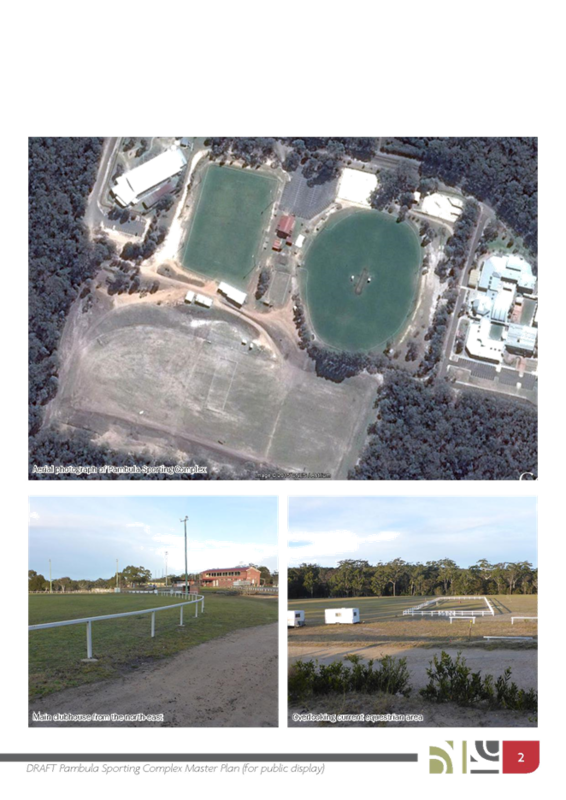 The area of Pambula Sports Complex is Council managed Crown Land. Major projects and works identified will each require a Review of Environmental Factors to be completed in the development of those specific projects. 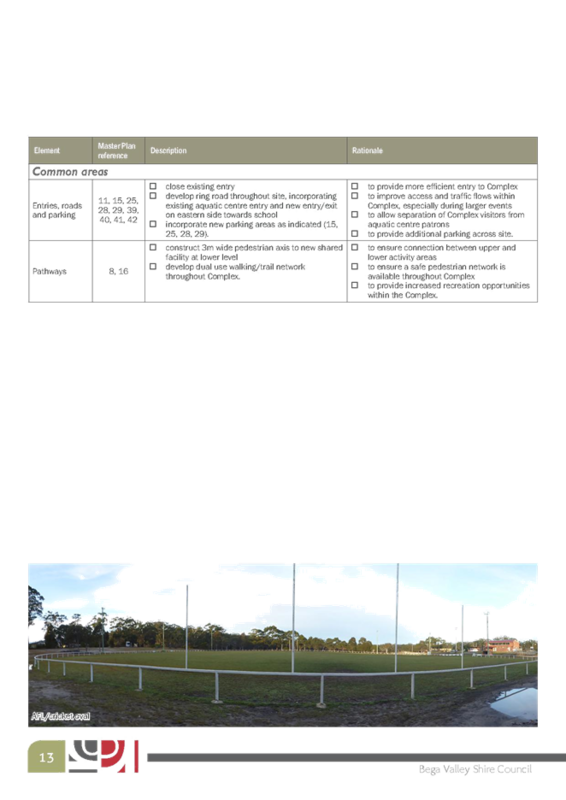 In total, there are 13 sportsgrounds of varying sizes throughout the Shire, managed by Council or a Committee. 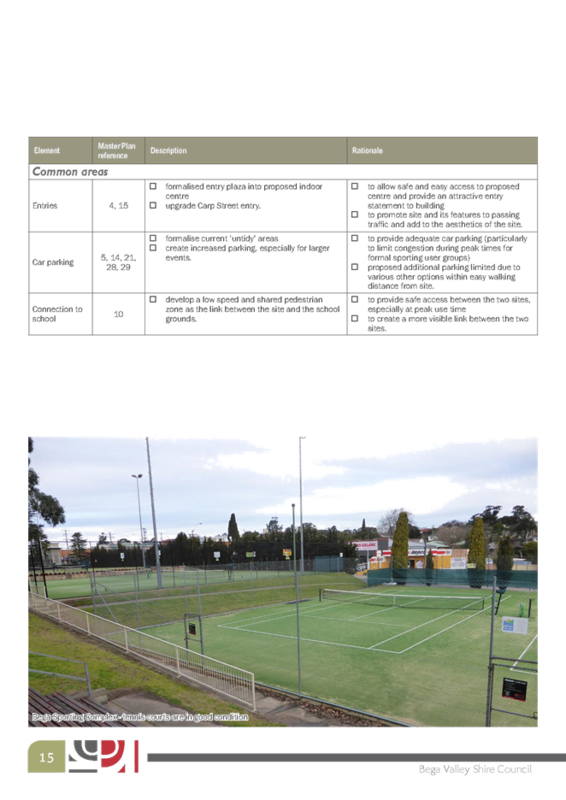 Council, through its asset management process, has classified each of the Sportsgrounds as Regional (2), District (5) or Neighbourhood (6). 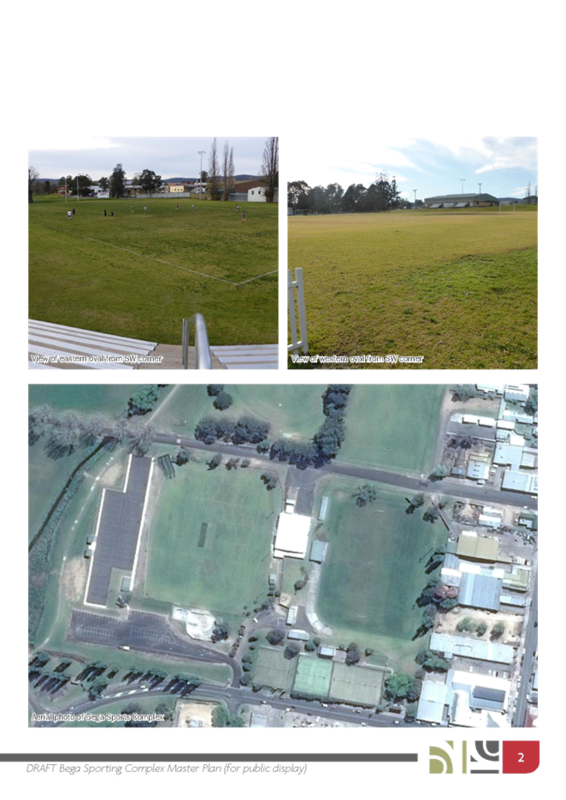 The Bega Sports Complex and Pambula Sports Complex are identified as regional sportsgrounds in Council’s Parks and Recreation Asset Management Plan. Both the sites host regular sports matches for local teams throughout the year for variety of sports. In addition both complexes host other facilities and events including regional finals matches, popular skate parks, indoor facilities that are available to community groups, community events and festivals and both have associations with local schools. When combined, these uses see the facilities serve important community and social functions. 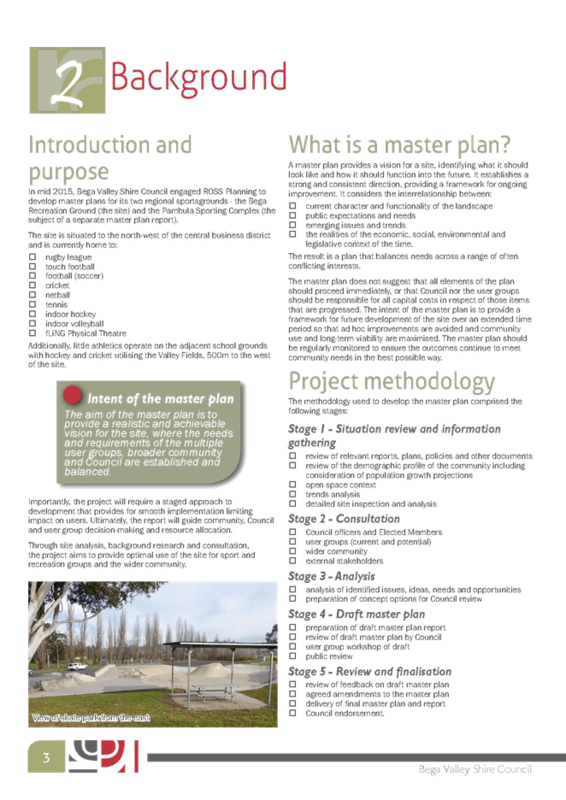 The Master Plans seek to plan sites that provide multi-purpose facilities to meet the needs of the community into the future. 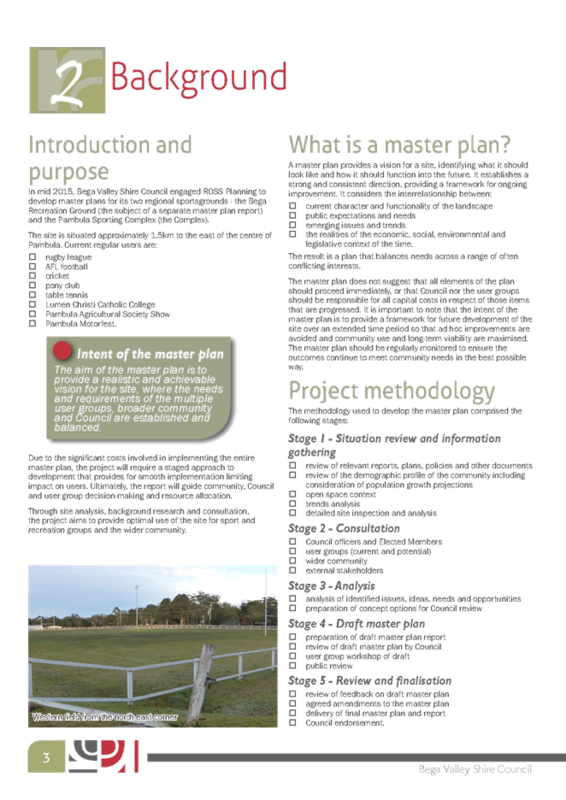 The Master Plans identify the current and future needs of the community and guide the creation of sporting and recreational facilities to cater for those needs. 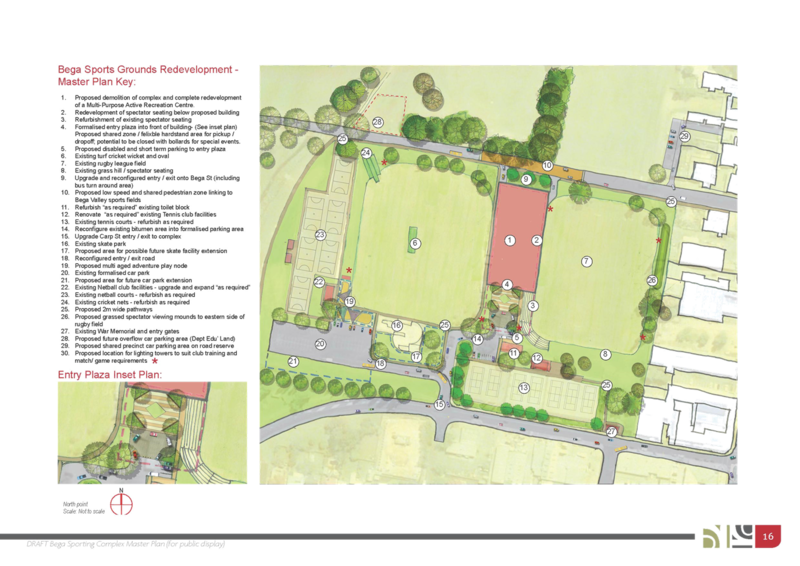 Importantly the planning process also identifies opportunities that will add value to the sites and allow for sites to increase recreation opportunities and participation by taking a ‘multi-purpose’ approach and that future improvements provide good value to the broader community and are fully utilised. Consultation has been a very important aspect of the project. A number of opportunities have been offered for the community to have their say. Key elements of the consultation activities included community workshops, designed to give interested people and groups including residents and business owners plus existing and potential users of the facilities the opportunity to be involved. In addition to the workshops there were also online surveys available to provide further opportunity for involvement. One survey was geared towards feedback from representatives of sporting clubs (presidents, secretaries, coaches etc.) and the other towards feedback from individuals. 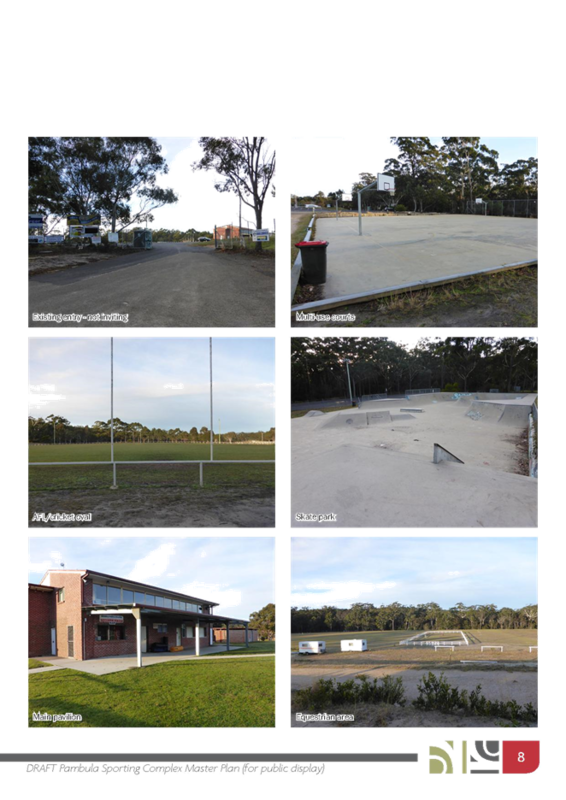 The community workshops aimed to encourage effective and productive discussion of ideas and issues, and provide the broader community input into the future development of the sporting facilities. Response to the consultation was positive with approximately 70 people attending the community workshops and approximately 300 online surveys completed. The final public exhibition period and second round of community workshops are a very important part of finalising the Master Plans. 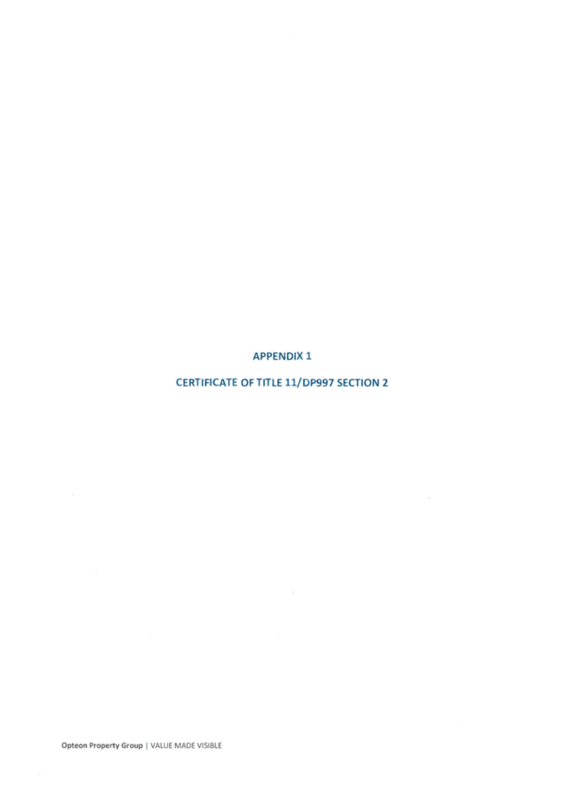 Submissions received through the public exhibition period may lead to changes, which is not uncommon or unexpected, however if there are a large number of submissions requesting significant changes (i.e. likely to have flow on effects to other users) this may lead to the need for a second review of the draft Master Plans. 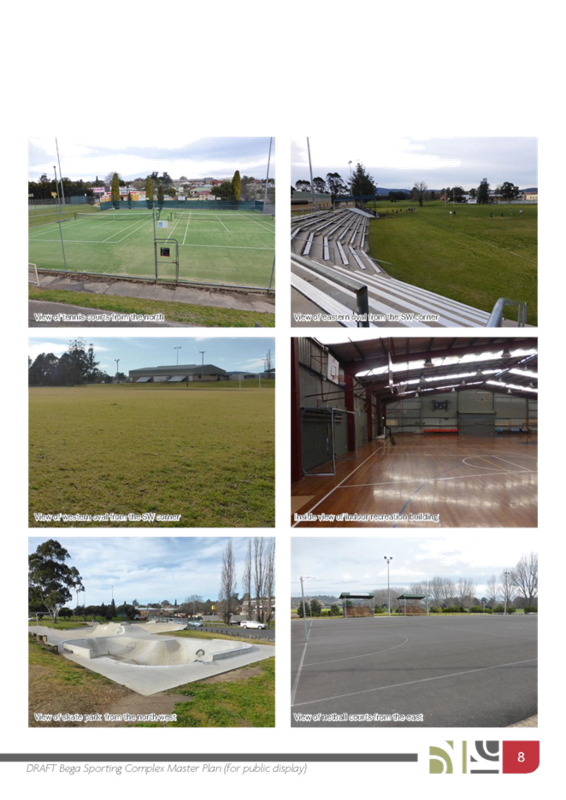 The Regional Sporting Facilities Master Planning Project is being funded through the Leisure and Recreation area budget. 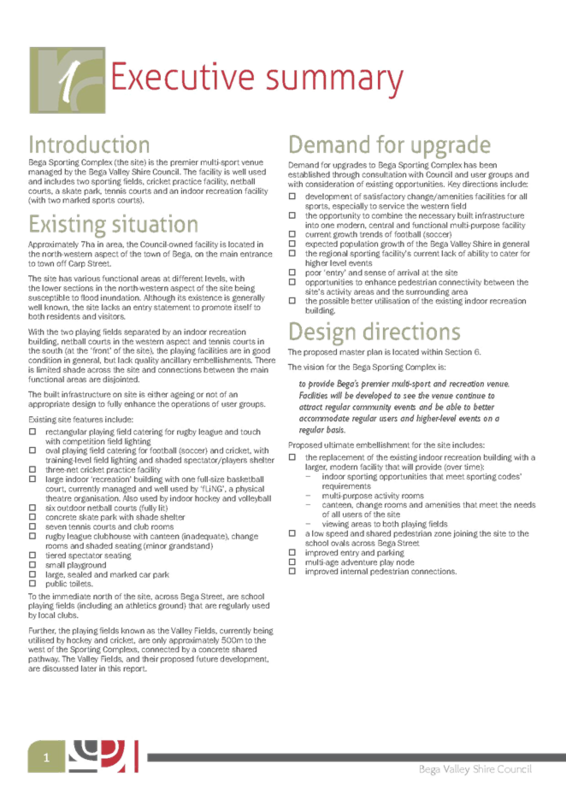 The master planning documents will identify and prioritise significant projects which will require funding and resourcing in the future, however having formally consulted and adopted the Master Plans will put Council and the community in a good position to plan how the projects will be resourced and to apply for external funding as opportunities arise. 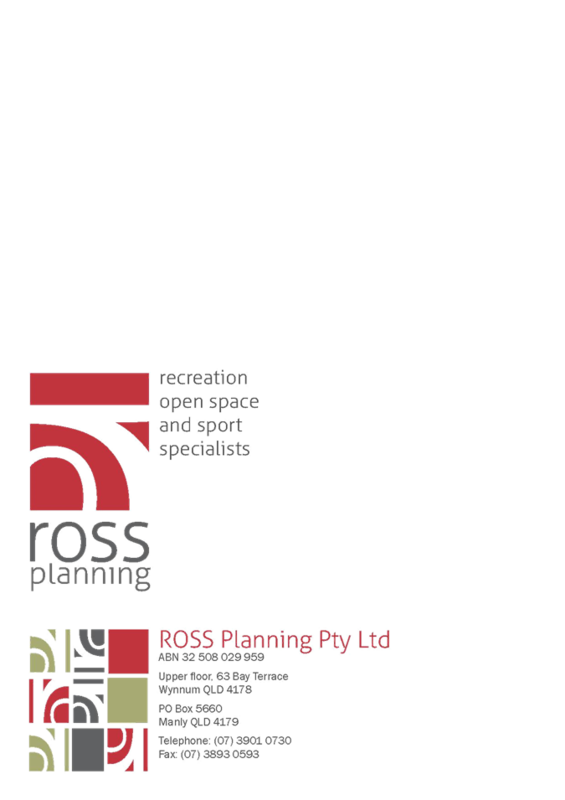 The works have been largely outsourced with the consultants Ross Planning undertaking the bulk of the project works. Council staff has been involved in the development of the project brief, tendering and procurement of consultancy services, project administration and project coordination. Community Ambition A2: Facilities and services: Our facilities and services are strategically planned, designed and maintained to meet the community needs. 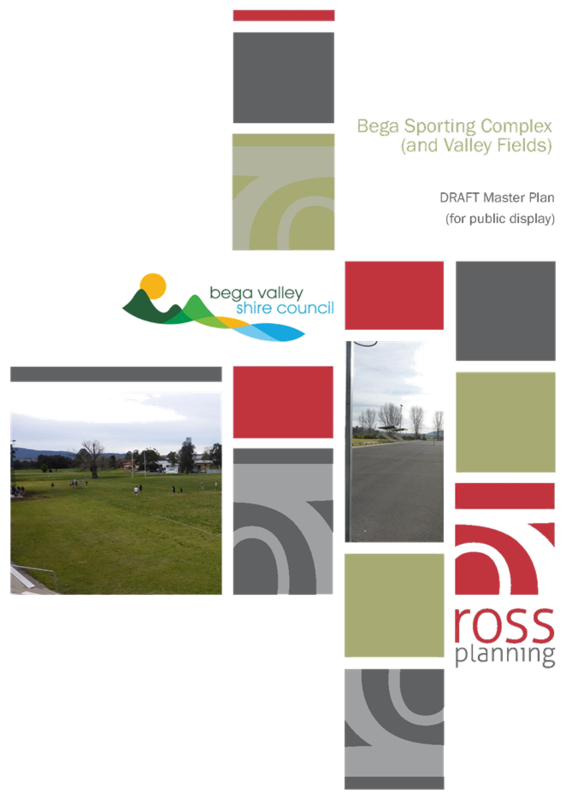 Outcome Area A2.3: Safe and well maintained sporting fields, recreation areas and built facilities meet the cultural, recreational, tourism and community service needs of all ages and abilities in our community. The completion of the project is identified within action A23.2.1 in the BVSC 2015 – 2016 Operational Plan. 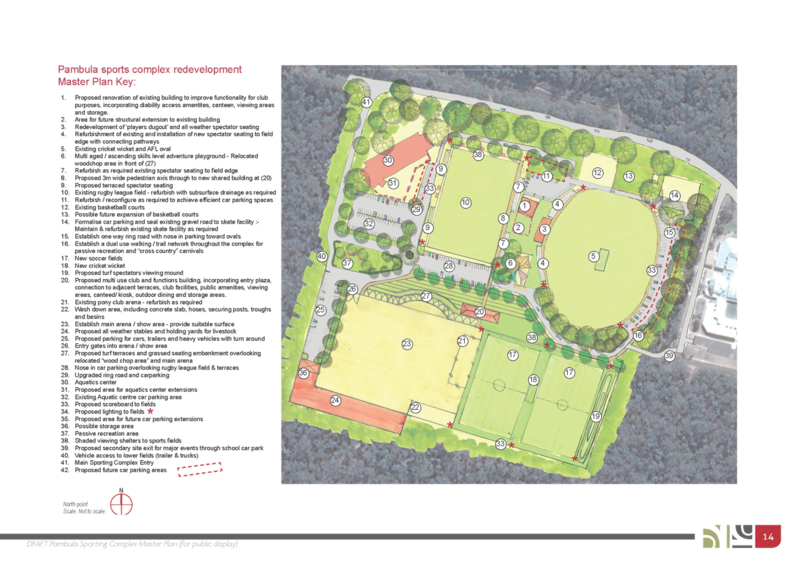 The final draft Regional Sporting Facility Master Plans for Bega Sports Complex and Pambula Sporting Complex have been completed. It is proposed they be advertised and put on public exhibition. Once feedback and submissions from the exhibition period has been considered and any necessary changes made the Master Plans for each site will be reported to Council for adoption. Once adopted, the Master Plans will provide a framework for the future development and enhancement of the sporting facilities. Importantly the planning process has looked to add value to the sites and ensure these sites are well managed and fully utilised into the future. 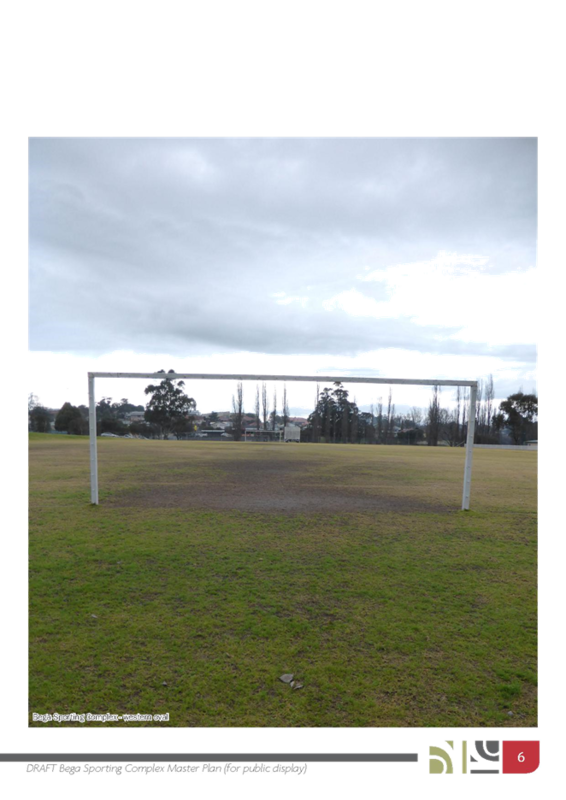 That Council endorse the draft Regional Sporting Facility Master Plans for Bega Sports Complex and Pambula Sporting Complex for a public exhibition period of at least 28 days including a community workshop and information session for each site. Council has previously given support to the staging of an Economic Summit. 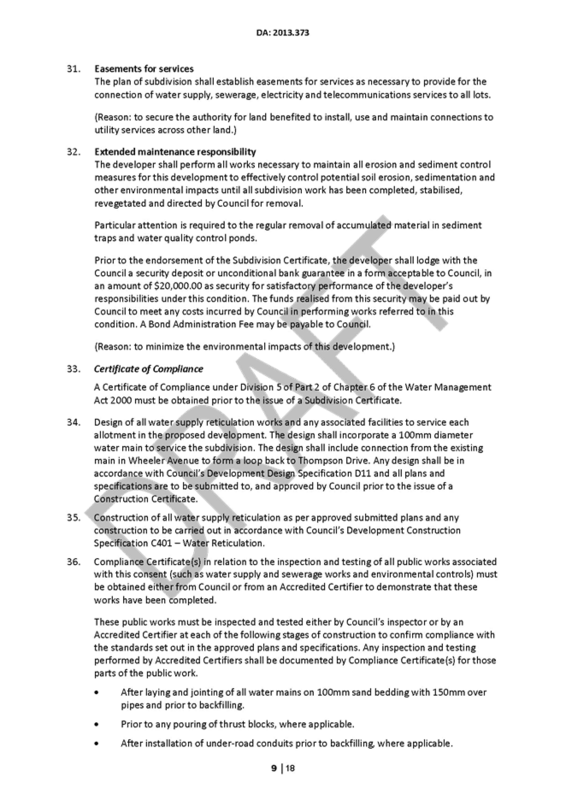 The timing and general synopsis of what is proposed is now ready for consideration. Council has planned holding and Economic Summit in the 2015/16 year. The model to be followed is the Tourism Industry Summit staged in collaboration with Sapphire Coast Tourism in late 2014. The Tourism Industry Summit resulted in a number of benefits, achievements and partnerships. It also served as a rallying point for the tourism industry sector of the Bega Valley Shire and neighbouring regions. It had been expected the Economic Summit would be staged in the October/November period this year, 2015. For practical reasons related to the timing of the adoption of the BVSC’s Economic Development Strategy and the commencement of the recently appointed Economic Development Manager, it is proposed the Economic Summit be held next year namely in 2016. In order to achieve the participation of key business, industry and government personnel critical to maximising the results and purpose of the Economic Summit, it is recommended it be staged in the post summer, pre-Easter period of mid to late March 2016. A number of other economic development conferences have been observed and researched. 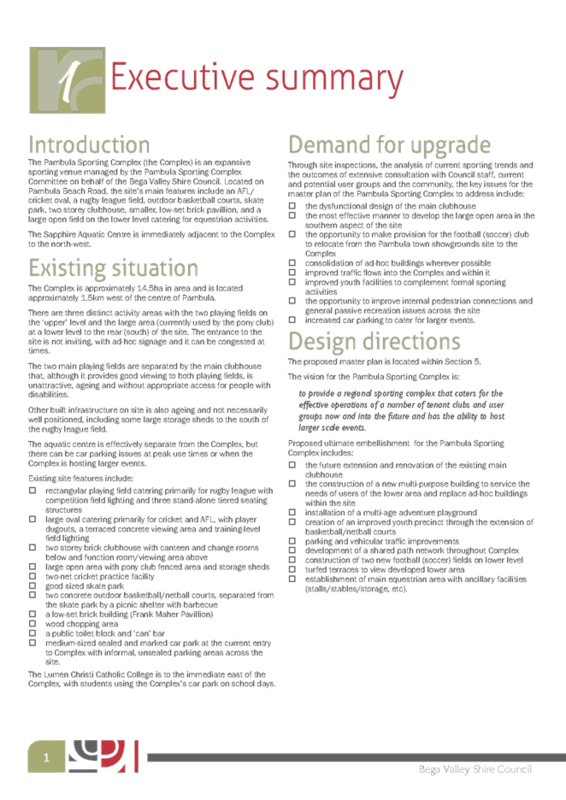 The various approaches and levels of success other similar events have experienced inform the proposed style and format for this Summit. It is recommended the Economic Summit be held over two days at the Bega Commemorative Civic Centre. Day One: would be run in a manner that seeks advice and collaboration of experts in various fields that Council believes require out of the box thinking and clear, long term strategies in order to deliver long term meaningful benefits to the community. 1. 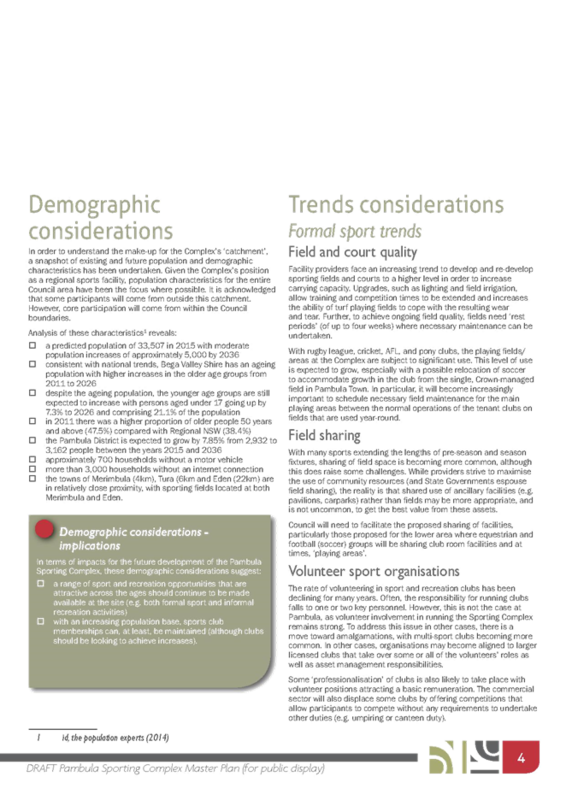 Strategic transport infrastructure needs and opportunities e.g. : Twofold Bay/Eden Port, freight routes, and improved air services. 2. Technology and the benefits of attracting and supporting start-ups and innovators and nurturing a community of such (technology hub). 3. 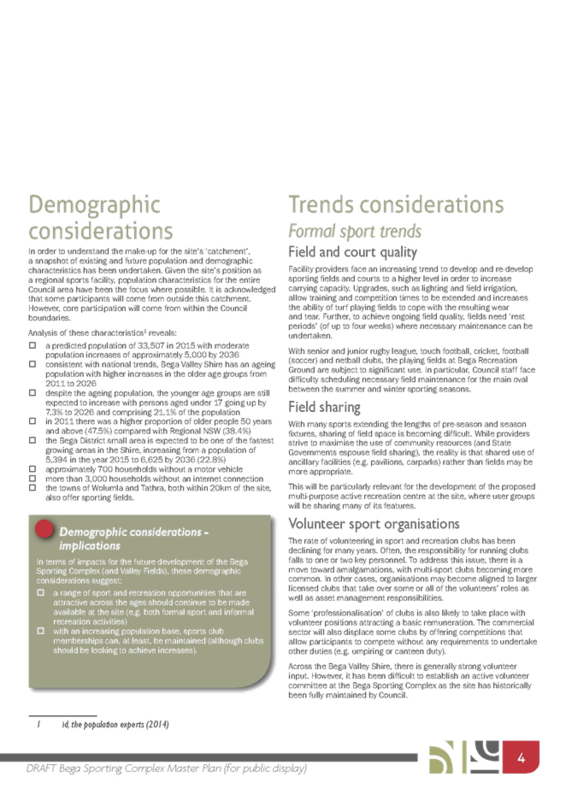 Supply chain challenges and gaps and how they can be addressed to benefit regional producers and connect them with distributors and retailers. 4. Skills training and education opportunities – the relationship to jobs creation, talent retention, economic growth and the direct correlation to meaningful employment. Day Two: would allow for presentations by industry experts to showcase strategic opportunities and enterprise innovations across the area in sectors such as technology, tourism, primary industries and education. A dinner would be held on the evening of the first day. Proposed and tentative dates at this time are Monday 21 and Tuesday 22 March 2016. Logistical considerations including venue, transport, marketing, registrations, accreditation, ancillary activities such as dinner will be planned and regular updates to Council in the period leading up to the summit will occur. The target attendees will ensure the best available thinkers and influencers are in attendance. The Economic Development Summit is an opportunity to highlight experiences and attractions unique to the Bega Valley to participants from outside the region. It is also an opportunity to present the region as a desired location for business events. The Economic Development Summit is an opportunity for communication, collaboration, ideas and agreed actions that will lead to the achievement of objectives adopted in the Economic Development Strategy. Staging an Economic Development Summit is a strategic objective of the Economic Development Strategy. Internal and external (business community) consultation will be part of the program development process. Council staff will consult with the local community and targeted guests to ensure the most effective content and dates are confirmed. The net costs for this event will be funded from the Economic Development budget with attendance revenues used to offset costs. Event management is intended to be provided by a professional event contractor under the direction of the Economic Development Manager. The Economic Development Summit aligns with the Economic Development Strategy. The Summit will provide significant and coherent results that will focus and prioritise the tasks, relationships, timeframes and opportunities (and challenges) in order to achieve tangible outcomes for the regional community. That Council note the current status and proposal for holding the 2016 Economic Summit. 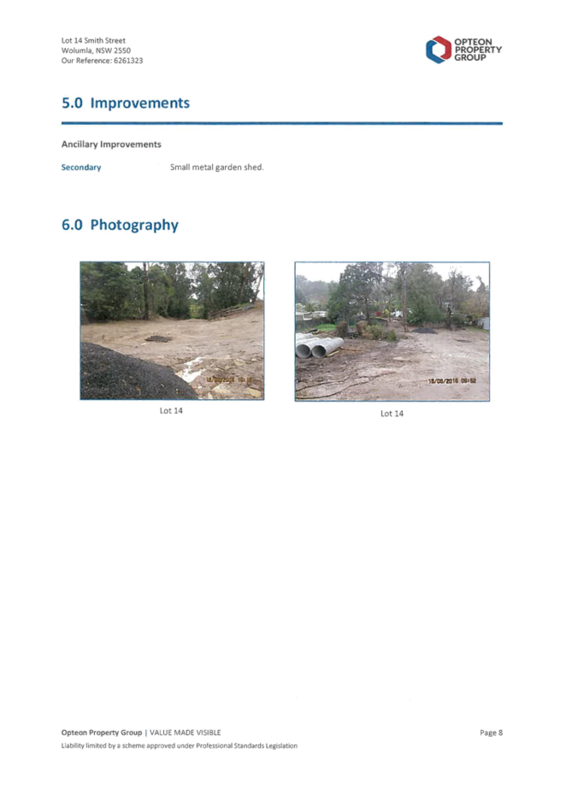 Upgrade easement required for Garvan St, Wolumla for urban stormwater drainage system. Urban stormwater drainage system requires upgrading for Garvan Street, Wolumla between Bega Street and Smith Street. Houses have been built adjacent to the existing natural drainage line and have for a number of year been subjected to localised flooding events during even moderate rainfall occurrences. It is a requirement under the Local Government Act 1993 (NSW) that Council acquisition of interests in property, requires a resolution of Council. If Council approval is granted, the acquisition will proceed by way of agreement with the affected landowners and a Deed of Agreement will be entered into, setting out the undertakings to do all things necessary to affect registration of the easement. The Deed and Section 88B Instrument documentation have been prepared by Council’s solicitor, and all costs associated with creation and registration of the easement will be borne by Council. The work is being carried out in a degraded natural drainage line. These works will increase the length of Council's piped drainage network by 120 metres with additional pits. 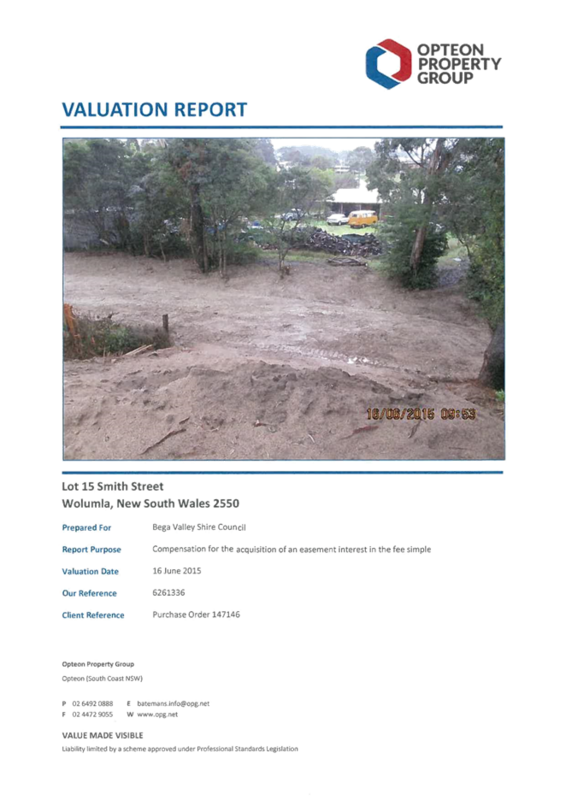 Council staff entered into a permit to enter with the landowners of Lot 11, 12, 14 and 15 Section 2 DP 997 to carry out works to construct the stormwater drainage line from Garvan Street to Smith Street Wolumla. 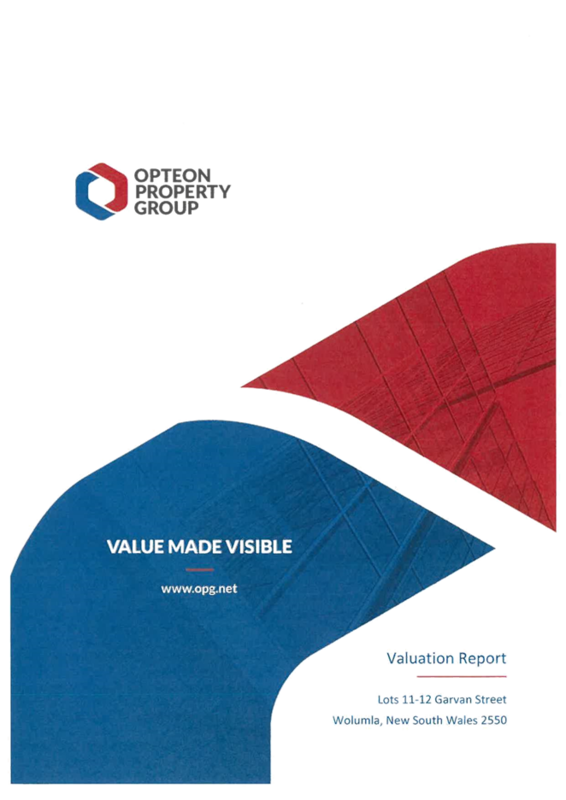 Opteon Property Group were engaged by Council to prepare a market valuation for acquisition of the easement over each property and landowners have now been sent a Deed of Agreement for the acquisition of the easement which includes a copy of the valuation report as Annexure C for execution. Opteon Property Group considered an increase in market value to the effected landowners through the works carried out and advised that compensation payable should be NIL, provided Council satisfactorily complete the filling and consolidation of the area, re-establishing the service lines to the property and re-erecting any fencing that was removed to a comparable standard. There will be legal fees payable by Council to finalise the easement documentation and arrange registration on title. Council property staff and external legal providers will be involved to finalise relevant paperwork and effect registration at LPI. Council approval is required to progress with the acquisition of the easement over private land. 1. That the report and attachments be received and noted. 2. 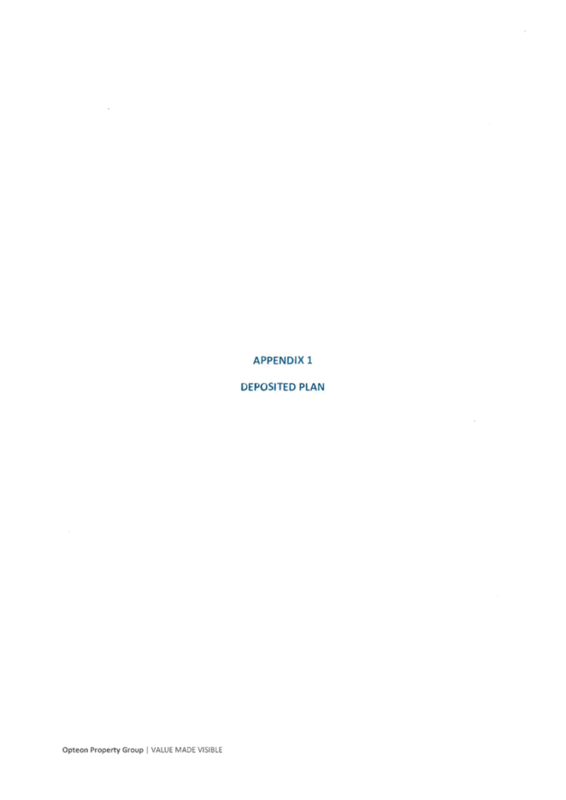 That Council enter into a formal Deed of Agreement with A.W. and S.J. James; W.O. and J.A. Elliot; and B.J. Coleman for the acquisition of an easement through their land, being Lots 11, 12, 14 and 15 Section 2 DP 997 at Wolumla for the purpose of a Stormwater Drainage Line 4 – 5 metres wide, in accordance with the Land Acquisition (Just Terms Compensation) Act 1991 for nil consideration as per valuation. 3. That Council authorise the Mayor and General Manager to execute the necessary documentation. 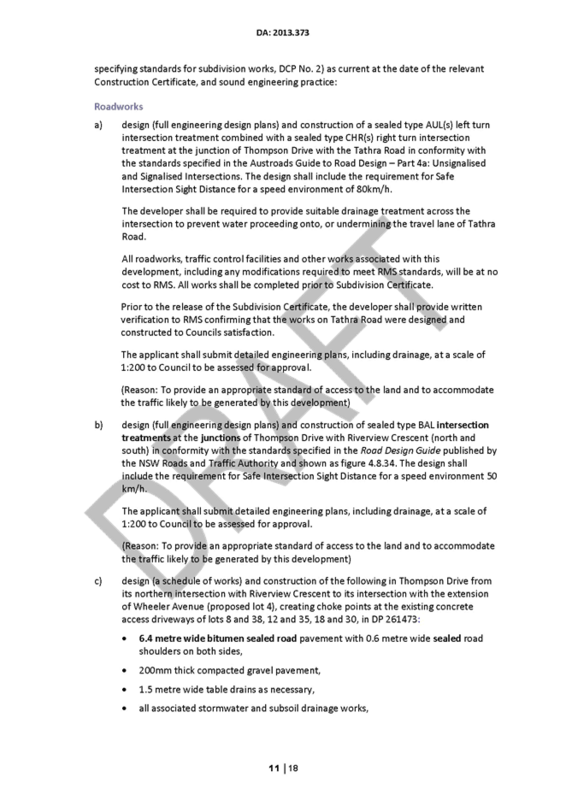 This report recommends Council adopt the advice of the Bega Valley Local Traffic Committee from their meeting held 4 November 2015. The Bega Valley Local Traffic Committee held a meeting on 4 November 2015, the minutes of which have been distributed separately. It is a requirement that Council formally adopt the recommendations prior to action being taken. The recommendations were supported unanimously by the Committee. 1. That participants undertake the procession along Carp Street footpaths via the pedestrian crossing at the intersection of Auckland and Carp Street observing the traffic signals, then progress along the northern side of Carp Street to the Driver Reviver carpark at the intersection of Carp Street and Poplar Avenue then crossing Poplar Avenue to Kisses Lagoon. 2. That persons involved in the preparation and implementation of any Traffic Control Plan must hold the appropriate RMS accreditation. 3. That organisers have approved public liability insurance of at least $20 million indemnifying Council, Police and Roads and Maritime Services by name for the event. 4. That organisers have written Police approval prior to conducting the event. 1. That, subject to conditions Carp Street, Bega be temporarily closed between the intersections of Auckland Street and Gipps Street for the Bega Chamber of Commerce Retail Promotion between 3:30pm and 9:30pm on Thursday 17 December 2015. 2. That the proposed traffic arrangements involving the temporary closure of Carp Street, Bega for the Bega Chamber of Commerce Retail Promotion on Thursday 17 December 2015 be deemed a Class 2 Special Event and it be conducted under an approved Traffic Control Plan in accordance with the Roads and Maritime Services (RMS) Traffic Control Manual. 5. That organisers have fully approved public liability insurance of at least $20 million indemnifying Council, Police and Roads and Maritime Services by name for the event. 1. Council approve the extension of the existing No Stopping zone commencing at the intersection of Oregon and Quondola Street, terminating at the northern end of the on street angled parking, being a total distance of 110 metres. 2. That the proposed traffic arrangements involving the temporary closure of part of Gipps Street, Bega for the Bega Volunteer Rescue Association on Saturday 14 November 2015 be deemed a Class 2 Special Event and it be conducted under an approved Traffic Control Plan in accordance with the Roads and Maritime Service (RMS)Traffic Control Manual. 4. The organisers fully implement an approved Special Event Transport Management Plan. Following implementation of the new NSW Addressing Policy, it has become necessary for Council to formally name an unnamed road located off Boggy Creek Road in Millingandi. A new NSW Addressing Policy was developed by the Geographical Names Board (GNB) in consultation with Land and Property Information (LPI) and came into effect in March 2015. Council's property staff are in the process of undertaking a review of all road names in the Shire to comply with the guidelines and as this unnamed road services more than five address sites, it has become necessary to name the unnamed road located off Boggy Creek Road in Millingandi. Residences in the area have written to Council suggesting the road be named Silver Cliff Road as the name this area was historically referred to. Staff have been able to confirm via historical maps, the area did appear to be known as Silver Cliff and it is therefore recommended to proceed with the use of Silver Cliff Road to name the unnamed road. Naming of the road does not represent any intention for Council to construct or maintain the road, it is simply a means of ensuring that properties can be located in emergency situations. (viii) Names referring to existing natural, physical or other characteristics within localities. The GNB, Surveyor General (SG) and Registrar General (RG) have reviewed the name under GNB Guidelines for the Naming of Roads and there is no objection to its use. The proposed road name of Silver Cliff Road will be advertised in local newspapers, calling for objections and allowing a period of twenty eight days for submissions to be received. If no objections are received the GNB will be advised to arrange gazettal. Advertising costs have been provided for in the current budget. 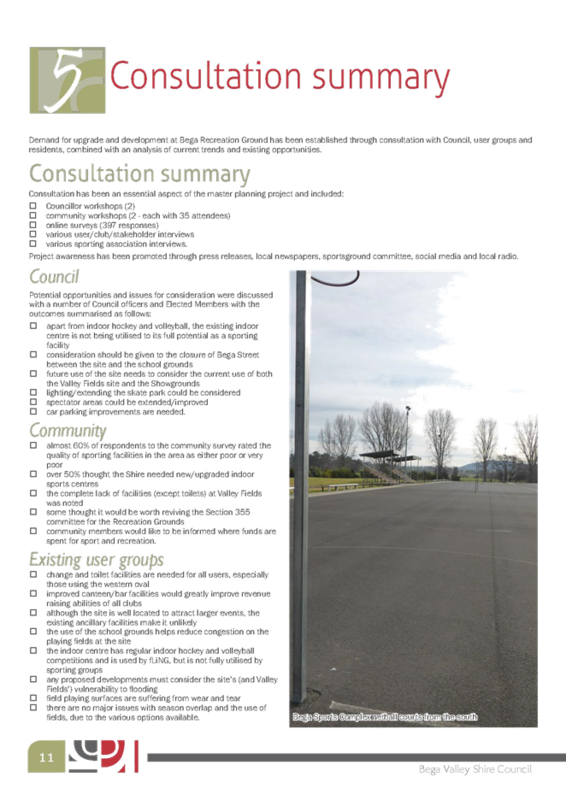 Council property staff will be required to complete the public notification process and arrange installation of signage. Formalisation of the road name is in accordance with Council’s road naming procedure and it is therefore recommended the public notification process now commence to formally name the road Silver Cliff Road, Millingandi. 1. That Council approve the proposal to name the unnamed road located off Boggy Creek Road in Millingandi, as Silver Cliff Road. 3. That if no objections are received within the submission period, staff will proceed with the road naming proposal without subsequent referral to Council. 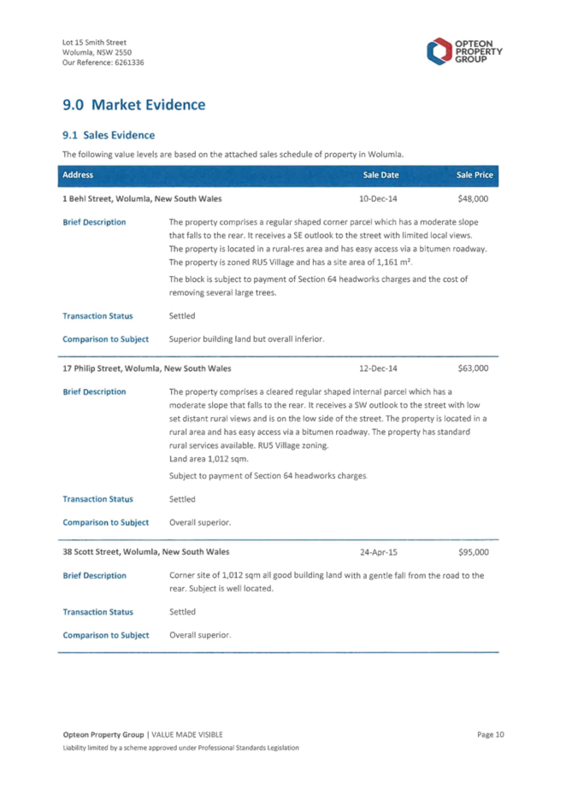 This report details evaluation of RFT 73/15 Construction Tender for Water Mains Renewal/Upgrade programme 2015/16 and recommends acceptance of the preferred tender. Council has an annual program of water mains renewal work, to ensure the ongoing performance of water supply systems, as detailed in the 2014 Water Asset Management Plan. Mains have been selected for renewal during this financial year in Bega, Bemboka, Bermagui, Eden, Merimbula, Pambula Beach, Tathra and Tura Beach. 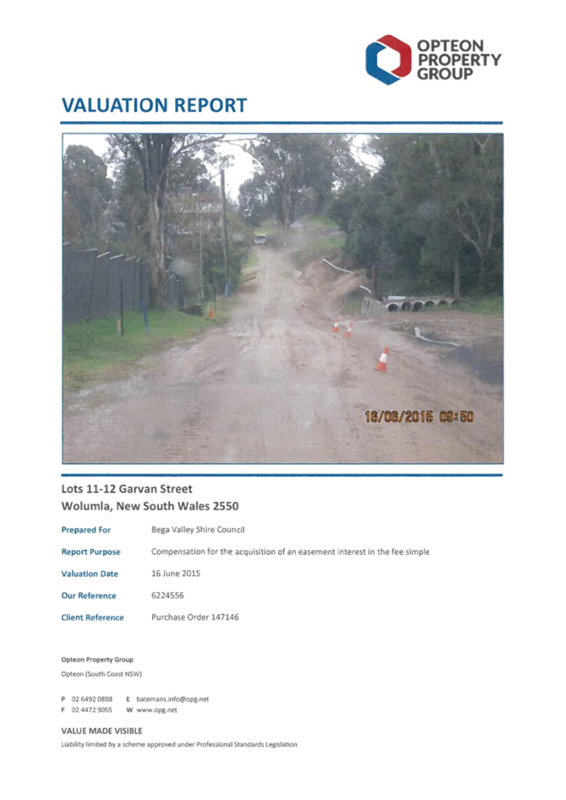 · Relocation of the trunk water main behind Club Sapphire Merimbula, Sapphire Coast Drive - Approximately 313 metres, subject to the development proceeding. 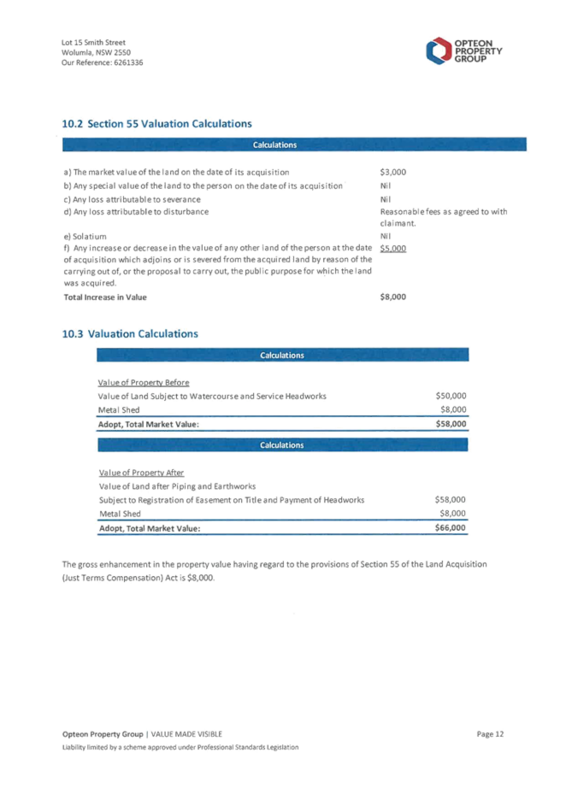 The annual program of water mains for 2015/16 as identified in Council’s Water Asset Management Plan will be undertaken within the allocated budget, using rate items included in this tender. Tenders were advertised on the NSW Government eTendering system and local newspapers from the 30 September 2015 and closed on the 28 October 2015. 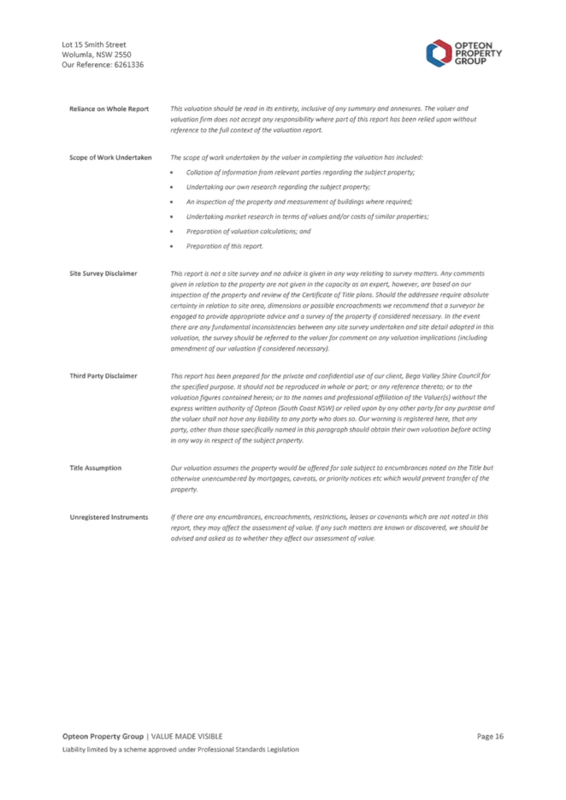 A tender evaluation plan consistent with the NSW Local Government Tendering Regulations and the Conditions of Tendering was prepared and endorsed prior to the close of tenders. The tender evaluation was carried out on the basis of best overall value for money to Council, with scoring and weighting of price and non-price criteria. The submitted tender was assessed against the evaluation criteria by a three person evaluation panel. The weighting ratio of price to non-price criteria was 60:40. · Evidence of sufficient experience in undertaking similar projects, including demonstrated successful completion of water main renewal works. 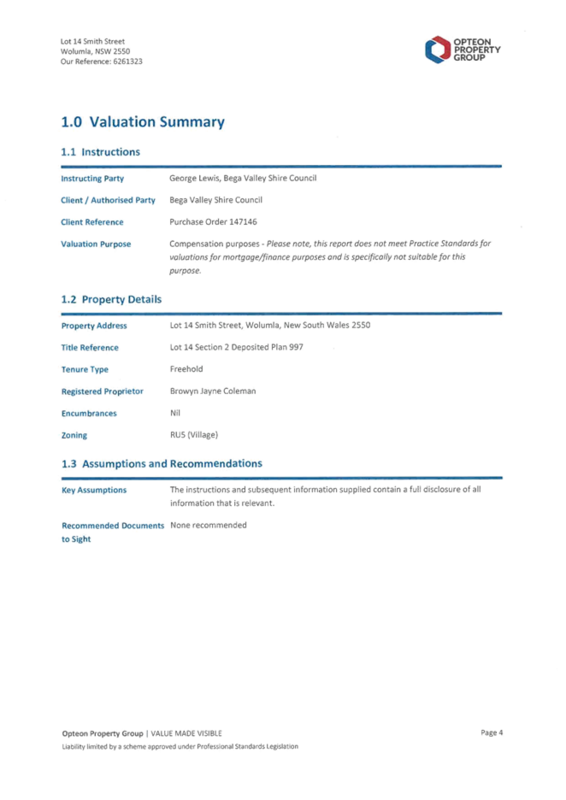 Experience of proposed project team, including role, estimated time commitment (%), qualifications, years of experience, years employed by company and proposed role/ responsibilities for this project. 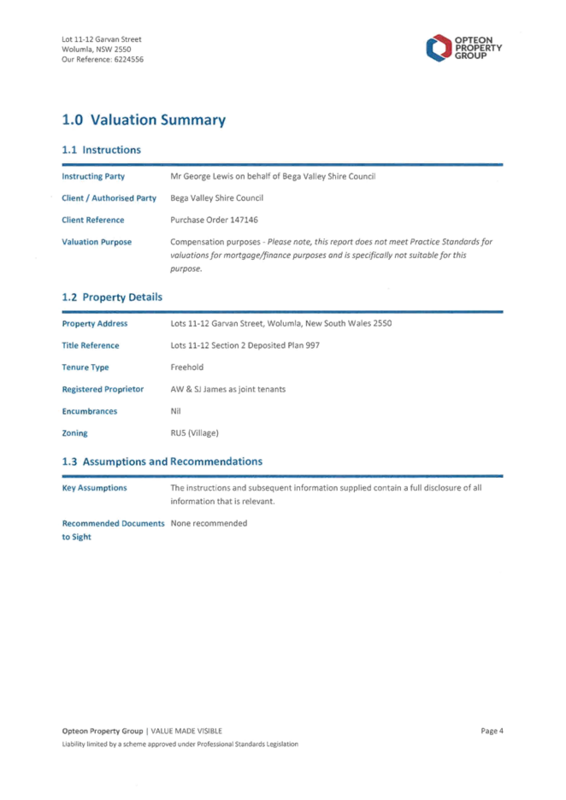 · Proposed construction methodology including preliminary construction program, work and quality systems, safety, environmental, time management. · Recognition of local outcomes and support of local business and community enterprise. 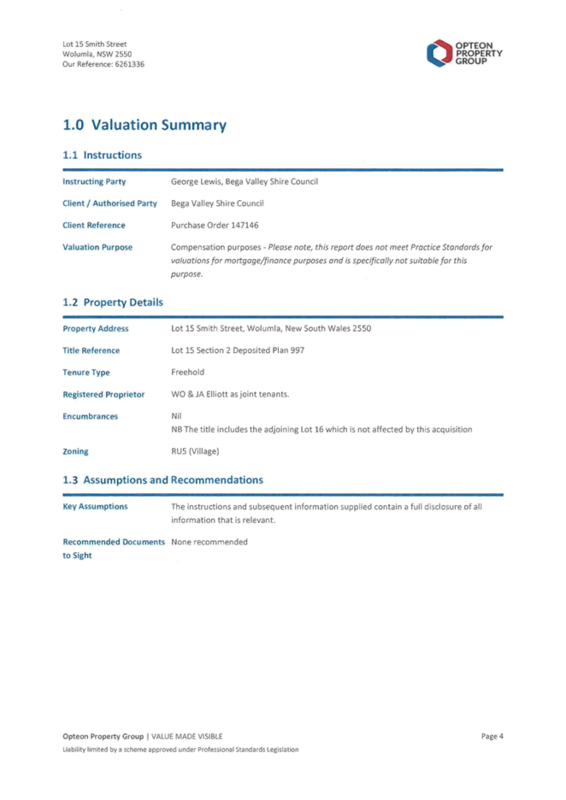 Each non-price criteria had a number of sections for evaluation and scoring purposes. Two conforming and one alternative tender were received by the due date 28 October 2015. The tender evaluation was carried out in accordance with the Tender Evaluation Plan with a preferred tender identified in this process. See details in the attached Confidential Memorandum to Councillors. The subject works are in accordance with Council’s Asset Management Policy. 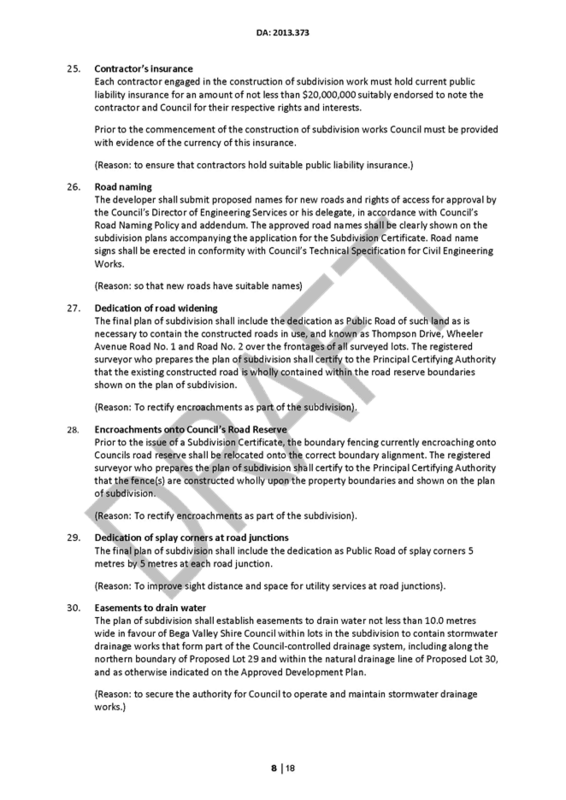 A Draft Review of Environmental Factors (REF) has been prepared and is currently being finalised (inclusive of environmental controls) to support the proposed works and will be issued to the successful tenderer. The ongoing need for water mains renewal/upgrade works is identified in Council’s Asset Management Plan for Water Supply. The project involves renewal of underground assets. Community consultation is targeted towards those residents directly impacted by on-ground works. Notification by letter at least two weeks prior to programmed works is planned. Procedures are also in place for reminder notifications 48 hours prior to work commencement. Where possible alternative temporary water supply arrangements for business customers, will be provided during the works. The costs of the schedule of works are allowed for in the current financial year capital works budget. The tendered price is accommodated in Council’s budget for water main renewal and replacement works. The proposed works are consistent with the current Operational Plan objectives. This report recommends award of the contract to the preferred tenderer in accordance with details presented to Councillors in the Confidential Memorandum attached to this report. 2. 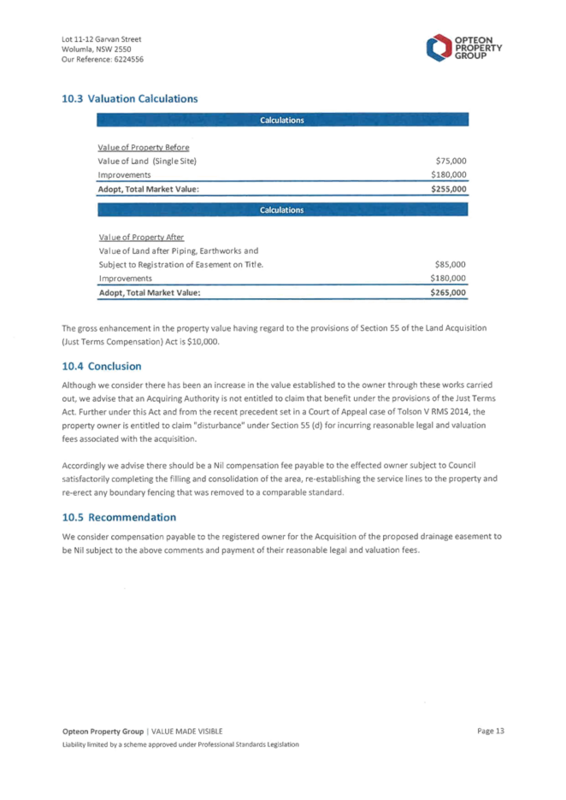 Council accept the tender submission from <insert> in relation to the construction for water mains renewal/upgrade programme as described in RFT 73/15, in the amount of <insert> (including GST), subject to variations and provisional sum items. 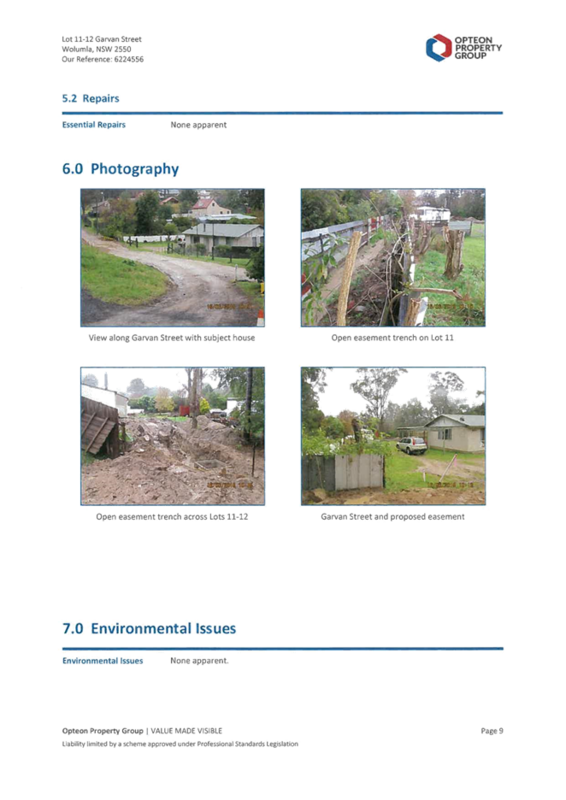 In January 2014 Bega Valley Shire Council entered into a funding agreement with Transport for NSW - Roads and Maritime Services to upgrade the Mogareeka boat ramp under the NSW Boating Now Program. The scope of the project is to construct a new two lane boat ramp, and upgrade the carpark, access and lighting. The tender was publically advertised on 13 October 2015 in the Sydney Morning Herald, local newspapers, the Council website and Tenderlink (e-tendering). The tender closed on 4 November 2015. The project was reviewed by BVSC Planning under the Infrastructure SEPP and endorsed on 22 July 2015. A Review of Environmental Factors for the Project was completed in July 2015, and formed the basis of the BVSC Planning endorsement under the Infrastructure SEPP. The NSW Department of Primary Industries (Fisheries) issued Permit 15/217 dated 10 August 2015 for the Project. 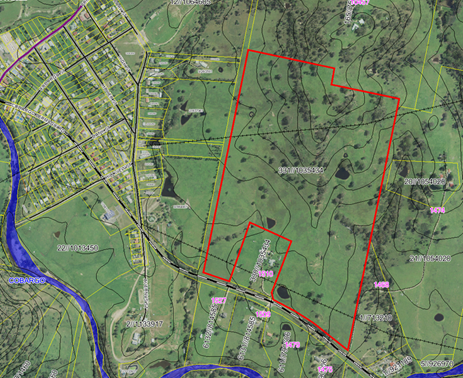 Lots 12, 13 & 14 / DP 710669, foreshore of Bega River, Mogareeka, is Council Managed Crown Land under Licence Agreement. Details of the project have been provided to Crown Lands so that the licence can be updated on completion of the works. 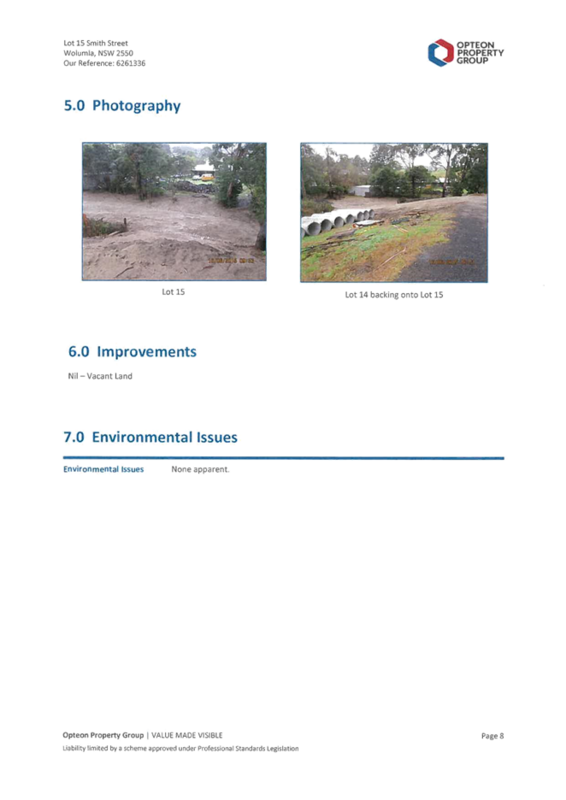 The Mogareeka Boat Ramp Upgrade Project was identified as a priority project in the BVSC Maritime Infrastructure Plan (February 2014) and the NSW Transport for NSW Regional Boating Plan – Far South Coast Region (February 2015). Community and stakeholder consultation has taken place in relation to this project. The Project Engineer for the Merimbula Public Jetty, Merimbula Boat Ramp and Wonboyn Boat Ramp projects will manage the Mogareeka Boat Ramp Upgrade Project. The carpark upgrade and associated works will be undertaken by Council road construction crews, as Council’s in-kind contribution, on completion of the new boat ramp construction works. The Project works will commence in February 2016, after the commencement of the school year for NSW, ACT and VIC. The boat ramp construction will take approximately 10 weeks, and the carpark upgrade and associated works will take approximately 6 weeks. The existing boat ramp will remain operational throughout the construction period. The Mogareeka Boat Ramp Upgrade Project will replace an inadequate and below standard facility, as identified in the BVSC Maritime Infrastructure Plan, with a new two lane boat ramp, upgraded carparking and associated works, that will significantly benefit the local community, visitors and tourists. 1. 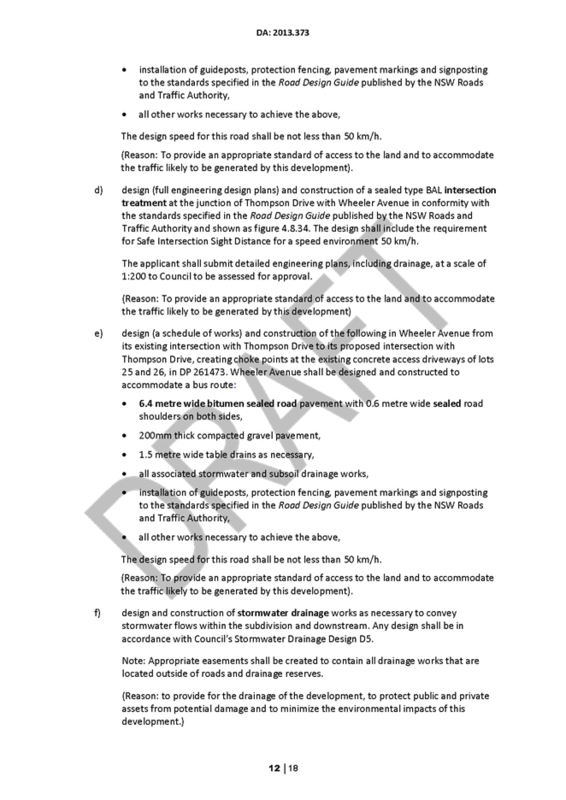 Council accept the recommendation as outlined in the confidential attachment. 2. 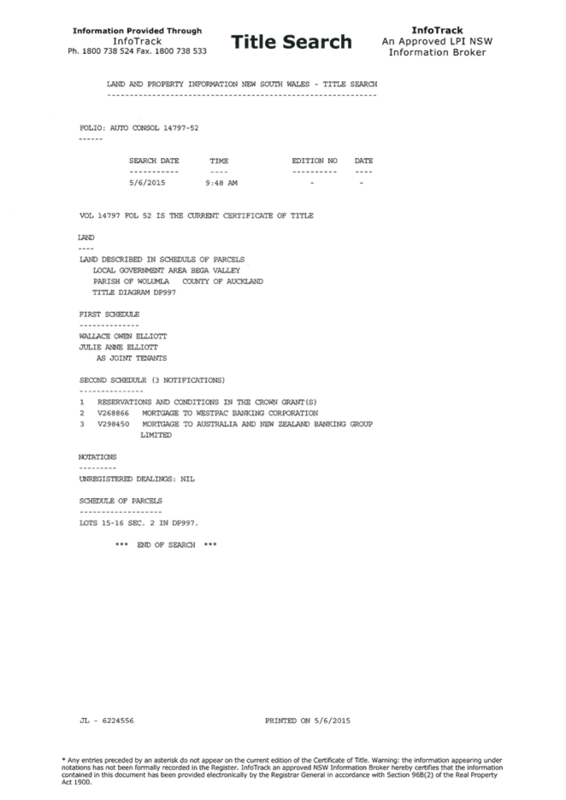 That Council accept the tender from (insert) in relation to contract for the works described in Tender RFT 72/15, in the amount of $(insert) (including GST), subject to variations and provisional sums. Applications for Financial Assistance –Community Partnership Fund - under Section 356 of the Local Government Act 1993 have been received for the second quarter of 2015/2016. 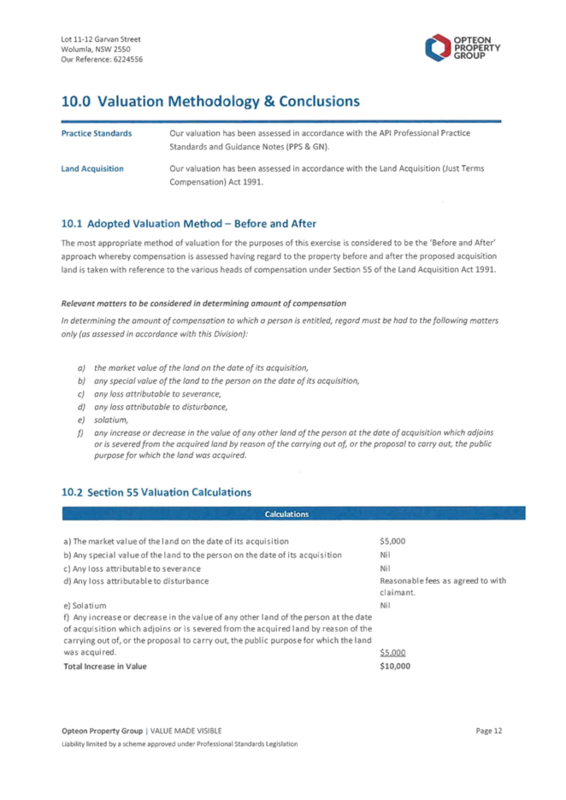 A report was provided to Council on 25 June 2014 outlining the revised procedure for handling Applications for Financial Assistance under Section 356 of the Local Government Act 1993 (the Act). 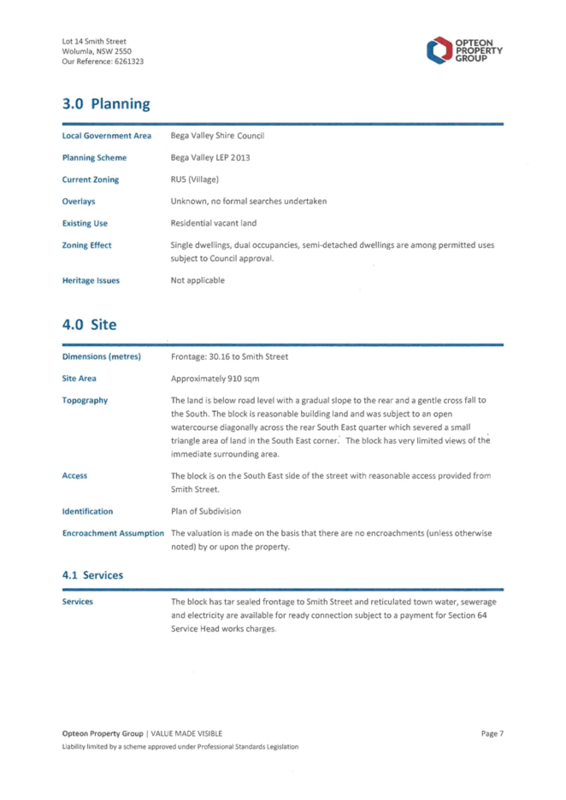 The applications in this report have been received over the period from 9 September 2015 to 9 November 2015. 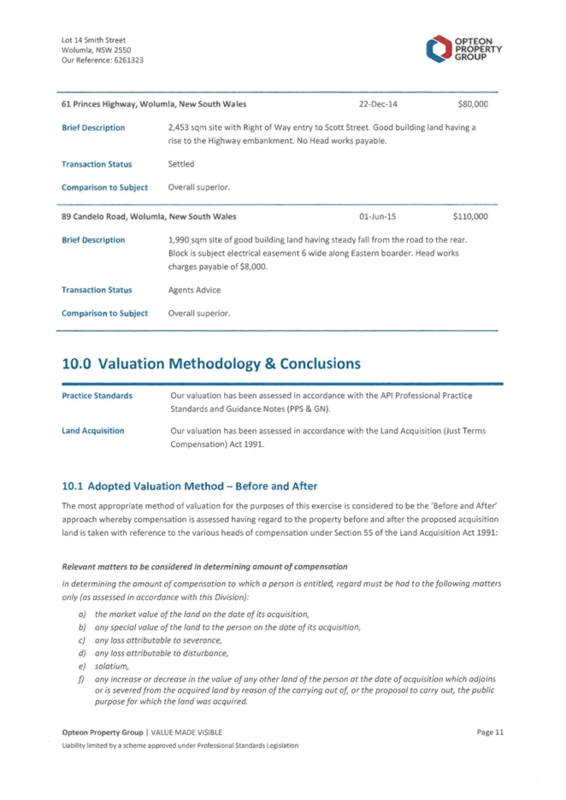 In addition to the applications received above for the Community Partnership Fund, one application has been submitted under the General Manager Approvals component of Section 356 for reimbursement of Development Application fees, which is above the General Managers delegation of $2000.00 – therefor it is required to be resolved by Council. A full memo with assessment criteria is being finalised for Council consideration and will be provided prior to the meeting. The allocation of funds requested is able to be distributed in accordance with Section 356 of the Act. The funds available to date are $161,598.50. Applications for Financial Assistance – Section 356 have been received for this quarter. It is appropriate Council continue to provide financial assistance to assist and support positive community outcomes. 1. That Council support the following projects at the nominated level of support <insert>. 2. That all successful applicants be advised accordingly. 3. That all unsuccessful applicants be contacted and provided feedback on their application. Applications have been considered and approved for the 2015 Southern Phone Grants Scheme. Southern Phone Company Ltd is a public company owned by 41 Local Councils in NSW, one of which is Bega Valley Shire Council. In 2014, the company implemented a new initiative – The Southern Phone Grants Scheme. Bega Valley Shire Council participated in this scheme, and provided $25,000.00 in funding to community-based projects within the local Council area funded by Southern Phones. Earlier this year, Southern Phone announced that the Southern Phone Grants Scheme will be once again run in 2015. Bega Valley Shire Council falls into the first round – August 2015. 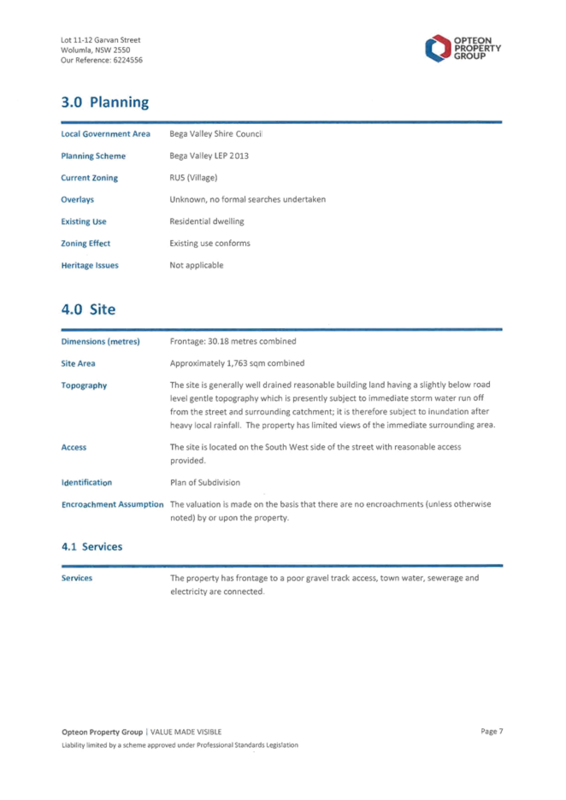 In accordance with the timeframes above, on 20 August 2015 Council provided a Media Release detailing information about the Scheme, and advertising that applications were open. Council received 7 applications from community groups, all of which were assessed individually by the Mayor, and all 7 were recommended to Southern Phone for its internal review. Tathra School P & C Assoc. Sapphire Coast Active Kids Playgroup provision of play equipment. It is anticipated a formal presentation to each community organisation will occur at an afternoon tea to be hosted by the Mayor on Monday 16 November 2015. Southern Phone has advised the provision of the grants is in line with their ongoing commitment to develop thriving regional communities. The funding for this program does not impact any other Southern Phones program. Council also receive an annual dividend from Southern Phones which is separately reported to Council. Approved Southern Phone Grants will be distributed to community groups via each local Council’s Mayor. Council recognises the importance of community-based events and projects in the Bega Valley Shire. Whilst Council is proactive in providing support to these organisations in various ways, there are limitations as to how and when funds can be afforded to these groups. Council’s 2014-15 Annual Report is presented for the information of Councillors. The report is required to be lodged with the Office of Local Government by 30 November 2015. Each year Council is required to produce a comprehensive Annual Report that provides details on the organisation’s activities and finances over the period of the previous financial year. The Annual Report is one of the key points of accountability between Council and our community. Under the Integrated Planning and Reporting framework, the Annual Report focuses on Council’s achievements towards the Community Strategic Plan framework, and also includes some information that is prescribed by the Local Government (General) Regulation 2005. Council’s Audited Financial Report and itemised update against the Operational Plan are provided as attachments to the Annual Report. 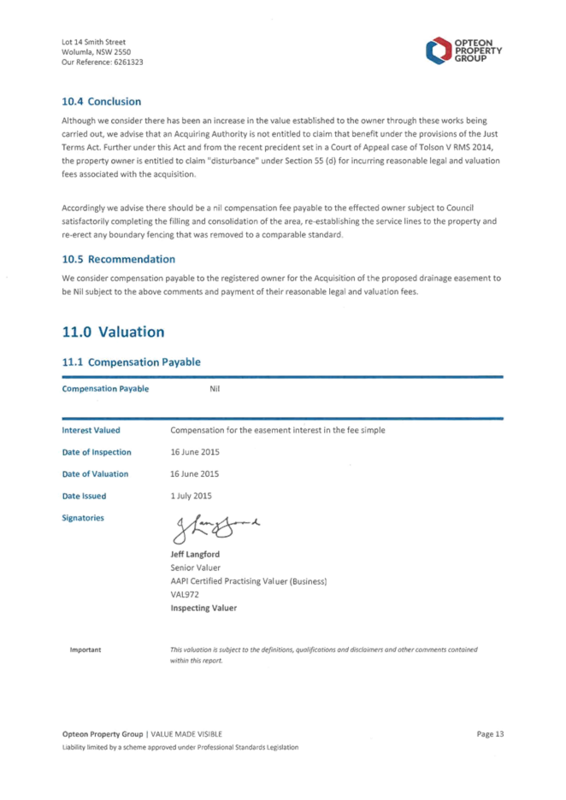 The NSW Office of Local Government provides Guidelines for the development of the Annual Report and requires a copy of the report for its records. 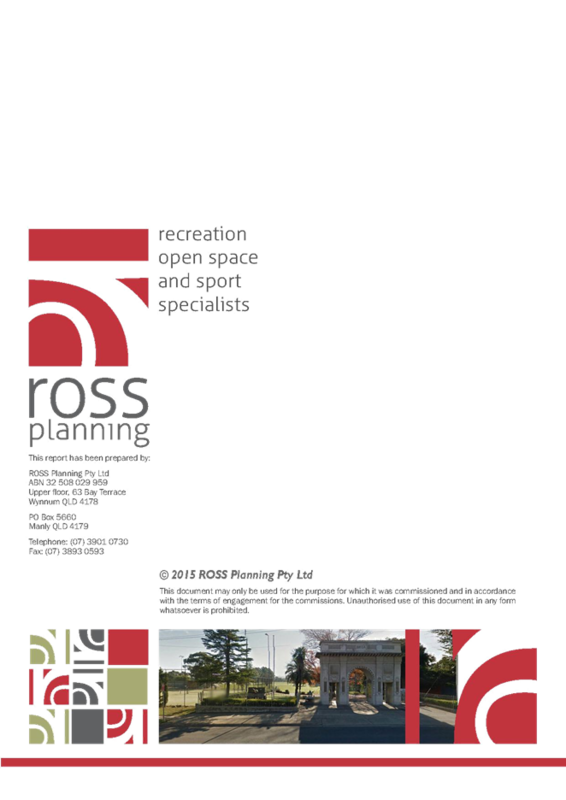 The 2014-15 Annual Report includes updates against Council’s major projects covering the Bega Civic Centre, Eden Port, Town Centre design projects, Littleton Gardens, Merimbula Airport, Merimbula By Pass, Merimbula effluent management, Tura community centre, Fit for the Future, business growth and the communication and community engagement review. In addition to highlighting progress in the Annual Report, Major Projects are also updated quarterly and reported to Council and published on the Council website. The report also highlights achievements against the Delivery / Operational Plan by theme area with an overview of projects and case studies presented on high interest achievements. The Delivery / Operational Plan identified 222 actions in addition to Council’s core service delivery areas, and in addition to the works scheduled in the Capital Works program. Of the 222 identified projects / tasks, 151 have been reported as completed / or as an ongoing service delivery, 57 as progressing (project covering two financial years), 11 are delayed with reason and three as not due to start due to changes in legislation. · Details of overseas visits undertaken during the year by councillors, council staff or other persons while representing the council (including visits sponsored by other organisations). § expenses involved in the provision of care for a child of, or an immediate family member of, a councillor, to allow the councillor to undertake his or her civic functions. § contracts for less than $150,000 or such other amount as may be prescribed by the regulations, including the name of the contractor, the nature of the goods or services supplied by the contractor and the total amount payable to the contractor under the contract. 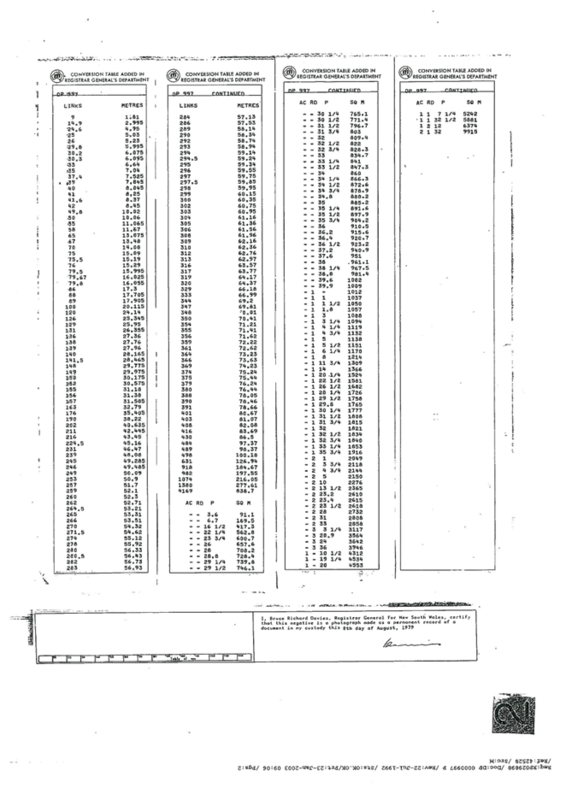 § A summary of the amounts incurred by the council during the year in relation to legal proceedings taken by or against the council (including amounts, costs and expenses paid or received by way of out of court settlements, other than those the terms of which are not to be disclosed) and a summary of the state of progress of each legal proceeding and (if it has been finalised) the result. 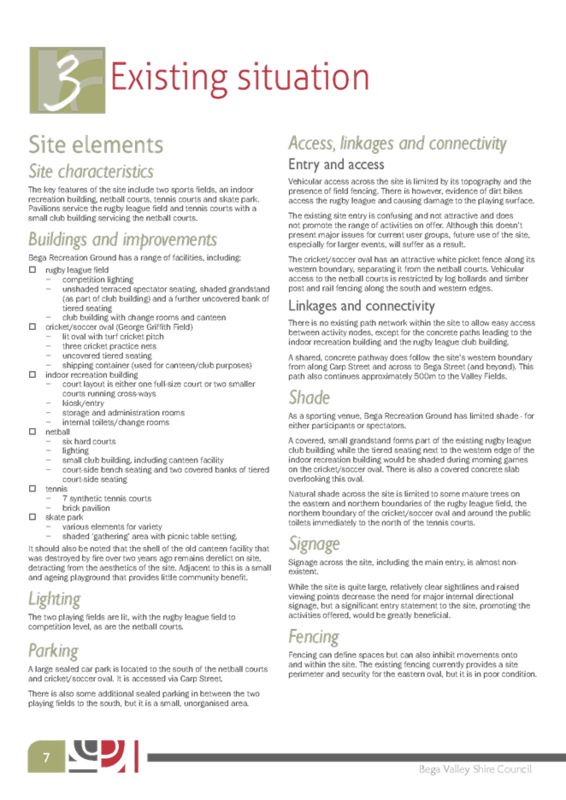 § Details or a summary as required by section 67 (3) of the Act of resolutions made during that year under section 67 of the Act concerning work carried out on private land and details or a summary of such work if the cost of the work has been fully or partly subsidised by the council, together with a statement of the total amount by which the council has subsidised any such work during that year. § The total amount contributed or otherwise granted under section 356 of the Act. § A statement of the activities undertaken by the council during that year to implement its equal employment opportunity management plan. § the total amount payable by the council by way of fringe benefits tax for any such non-cash benefits. 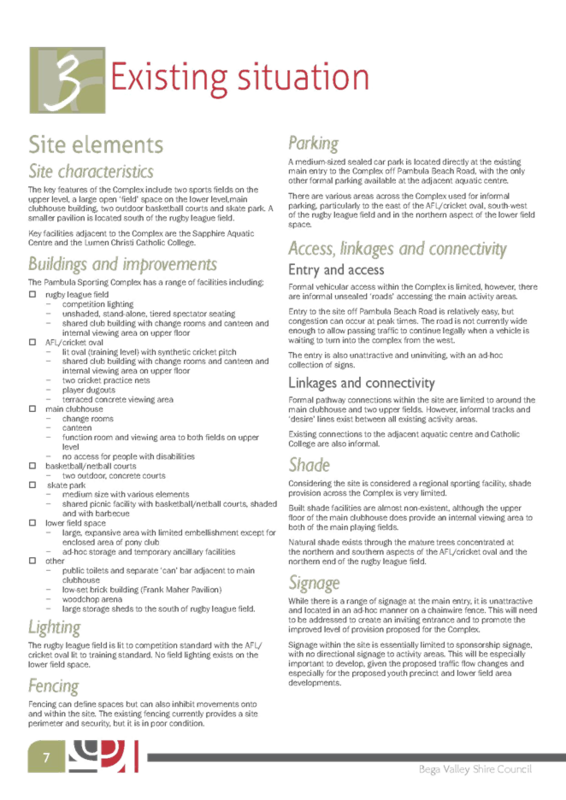 § A detailed statement, prepared in accordance with such guidelines as may be issued by the Director-General from time to time, of the council’s activities during the year in relation to enforcing, and ensuring compliance with, the provisions of the Companion Animals Act 1998 and the regulations under that Act. 2014-15 Annual Report has been prepared to comply with the legislative requirements and to overview the achievements against the 2014-15 Operational Plan. The Annual Report is to be provided to the Office of the Local Government by 30 November 2015. It will also be published on the Council’s website on November 30. 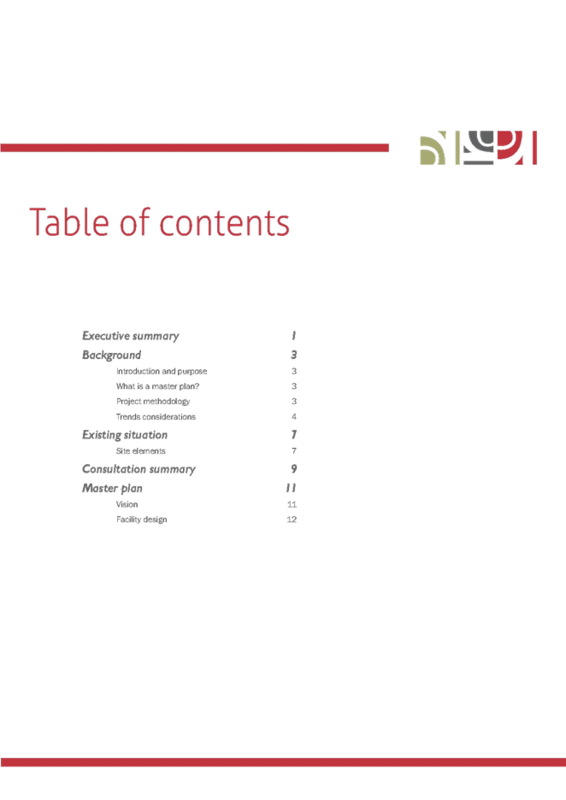 That the 2014-15 Annual Report be endorsed for publishing on Council website, provision of hard copies to library branches and lodged with the NSW Office of Local Government. This report presents the draft financial statements to Council to be confirmed by the presentation of the Audited Financial Statements to Council on 25 November 2015. Council’s Financial Reports for the year ended 30 June 2015 have been completed and in accordance with Section 418 (1) of the Local Government Act are now presented to the public. Council’s Auditor, RSM Australia Pty Ltd have completed the audit of the financial statements for the year ended 30 June 2015 in accordance with Section 415 of the Local Government Act, 1993. The financial statements include the general purpose consolidated accounts of Council and its controlled entities and the special purpose financial statements, detailing the income and expenditure of Council’s business units and their financial position at balance date. The audit opinions on the 2015 financial statements of Council are issued without qualification. Public Notices advising of this meeting were placed in the Bega District News, Merimbula News Weekly and Eden Magnet. In accordance with Section 420 of the Local Government Act 1993, any person may make a submission in writing with respect to Council’s Audited Financial Reports or the Auditor’s Report. The closing date for submissions is the 2 December 2015. Copies have been placed on public display at the Council Administration Building (Zingle Place Bega). 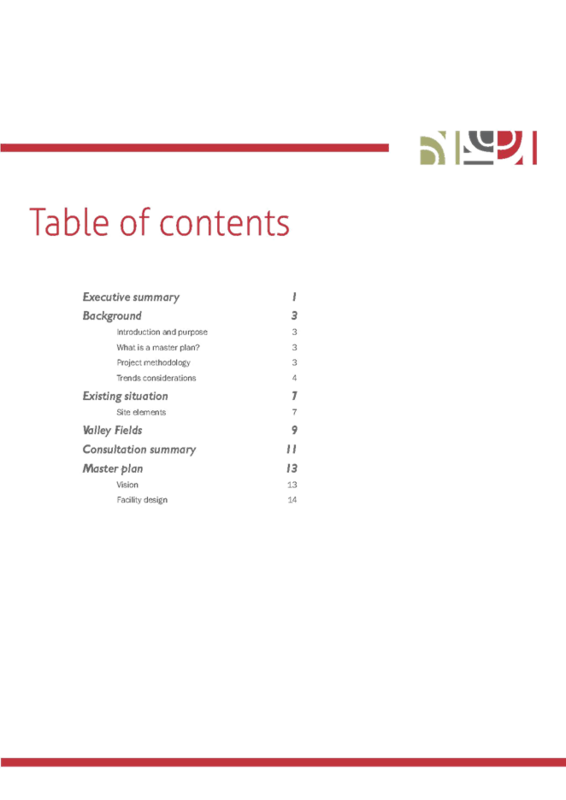 A PDF copy can also be downloaded from Council’s website. Council has achieved an operating result of $6,717k across all Funds (General, Water, and Sewer). Bega Valley Shire Council (Council’s) operating revenues have increased by 12% in 2015. The increase can be largely attributed to the Operating Grants and Contributions and this is a one off increase primarily due to the Financial Assistance Grant being fully paid in the normal cycle. Council is forecasting a general reduction in operating and capital grants over the short to midterm with the change in Government and the longer term effects of the Global Financial Crisis. 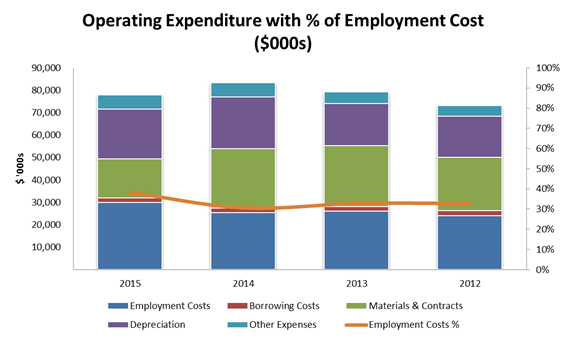 Operating Expenses decreased by 0.43% in the 2015 financial year. The major contributor to the decrease is reduction of Materials and Contracts and Depreciation. 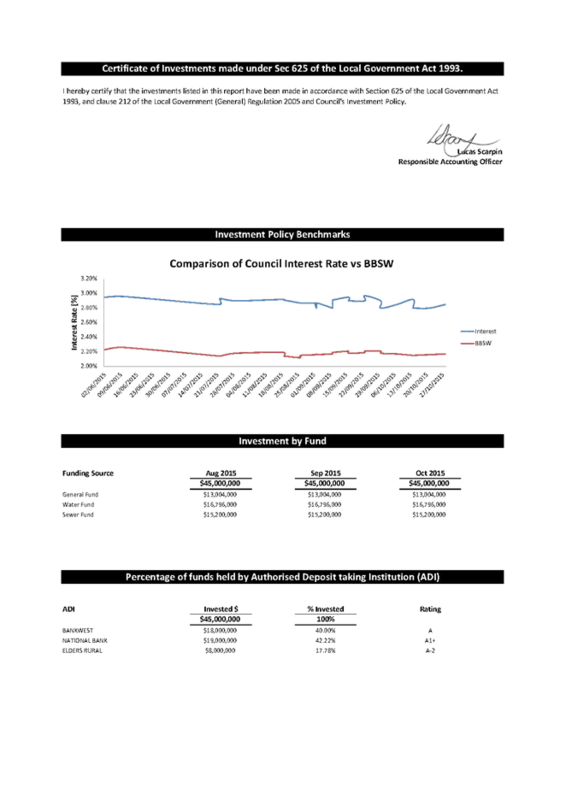 Transport asset class was revalued with a net uplift of $2.6M. 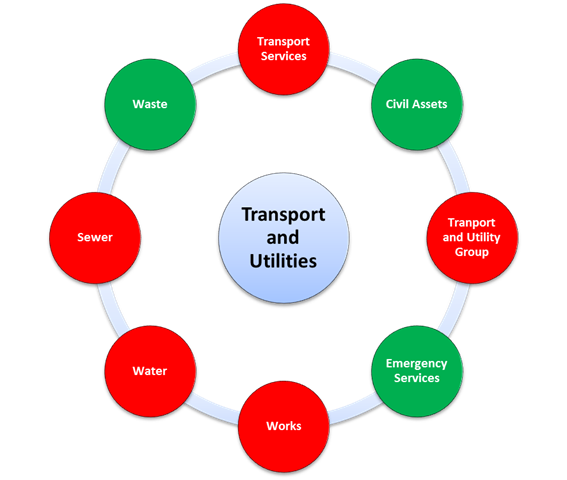 The asset class includes items such as Roads, Bridges, Footpaths, Bulk Earthworks and Stormwater Drainage. 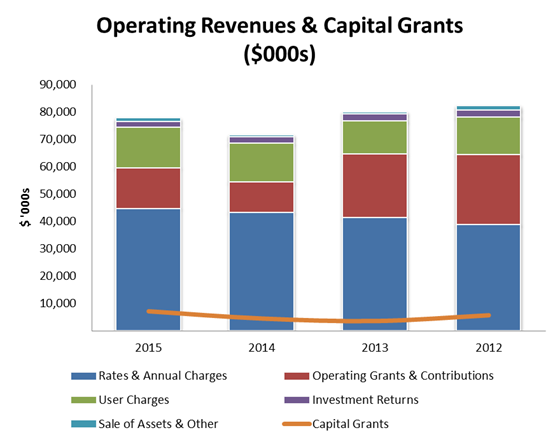 This ratio measures Council’s achievement of containing operating expenditure within operating revenue. Council's Operating Performance Ratio is still a deficit but this is due to higher deficits in Water and Sewer Funds. General Fund has returned to a surplus which is principally due to the Financial Assistance Grant being fully paid in the normal cycle. This ratio measures fiscal flexibility. 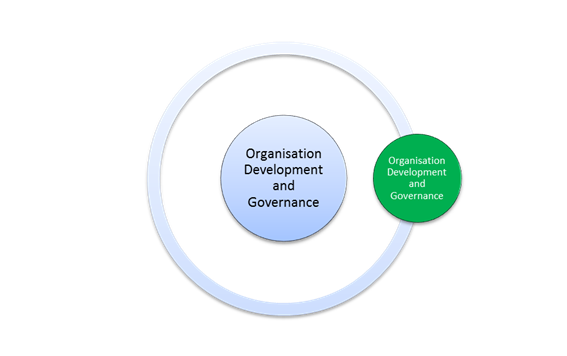 It is the degree of reliance on external funding sources such as operating grants and contributions. Council is above the benchmark for own source revenue. An integral part of Council’s adopted Long Term Financial Plan is to attempt to increase own source revenues. Unfortunately as the State and Federal Government reduce the number and value of grants available to Local Government, this ratio starts to show Councils having to rely on own source revenue to fund their works programs. The ratio measures the adequacy of working capital and its ability to satisfy obligations in the short term for the unrestricted activities of Council. Council’s unrestricted current ratio is below benchmark due to deferral of two significant proposed borrowings totalling $3M to 2016 Financial Year. This means council had to use unrestricted cash to fund those projects in the interim. The ratio measures the availability of operating cash to service debt including interest, principal and lease payments. Council's debt service ratio is in strong position. Council has sufficient fund to meet its debt obligation. 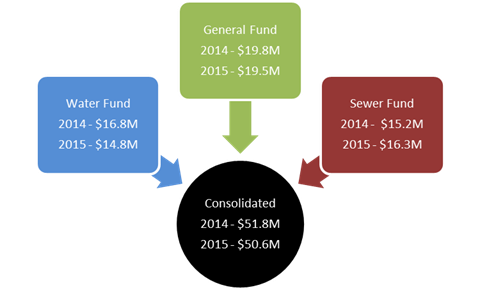 Council holds approximately $33M in debt across all three funds. Council's Long Term Financial Plan outlines that Council will see draw down of more debt to enable Council to reduce infrastructure backlog and construct some community priority projects while still remaining below the benchmark. This ratio assesses the impact of uncollected rates and annual charges on Council’s liquidity and the adequacy of recovery efforts. Outstanding Rates, Charges and fees are 3.71% which is within industry benchmark of 5%. Council has strong debt collection procedures in place to collect its rates and charges. Council has managed to maintain an outstanding collection percentage close to the Office of Local Government benchmark for a number of years now. It is critical Council keep this ratio as low as possible to aid with Council's cash flow. For example, allowing this ratio to increase by 1% will result in more than $500,000 that Council will not collect and by extension would not be able to utilise to resource works in the community. This could either lead to the work not being performed or alternate funding arrangement being made, such as borrowings, increased fees, etc. It is worth noting Council has seen its recovery costs increase from approximately $40k in 2009 to approximately $300k in 2015. These costs are passed onto the ratepayers that Councils has had to instigate collection on. No costs are passed onto the general rate base. This liquidity ratio indicates the number of months a council can continue paying for its immediate expenses without additional cash inflow. Council again has a very strong liquidity ratio and is well above the benchmark. § $9.4M on Environmental Management projects. § $4.5M on Community Support projects. § $1.4M on Economic Development projects. 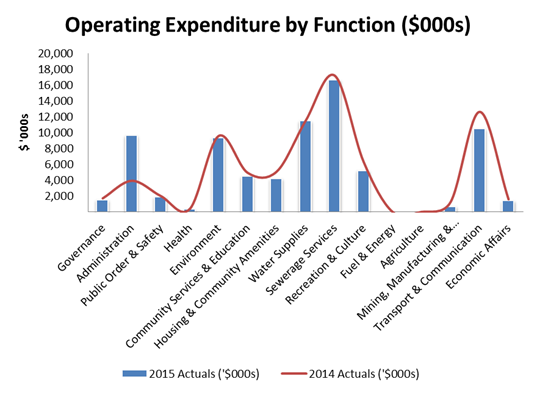 The chart below illustrates 2015 operating expenditure $ per function with comparative. Council’s financial results for the 2015 financial year are indicative of the approach Council has taken over the past few years. The adoption of the Community Strategic Plan, the Asset Management Plans, and the Long Term Financial Plan has allowed Council to set out a pathway for the short to mid-term horizon. The results as reported for 2015 illustrate that Council is progressing well. All indicators are satisfactory and Council's finances remain in a healthy position. Council has also undergone several internal and external audits during the 2015 financial year. All of these reviews have indicated Council is in a stable and sound financial position. That Council accept the tabled audited 2015 Financial Statements. 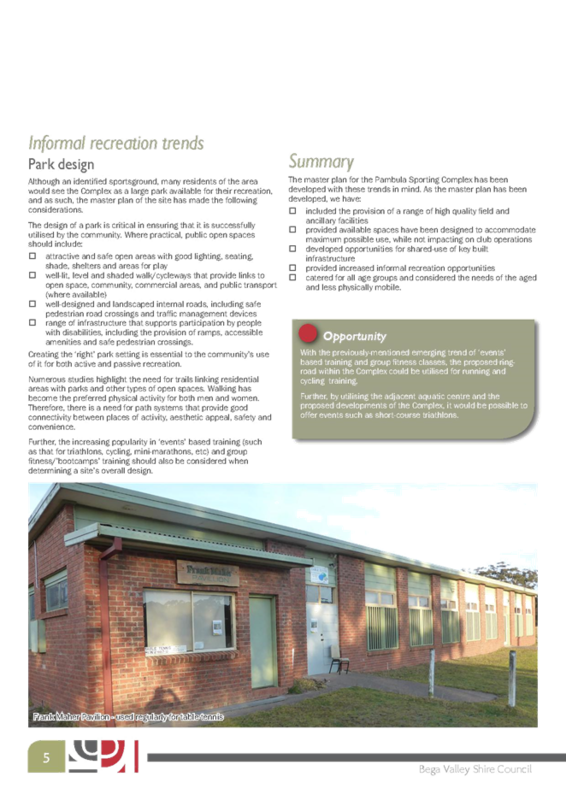 This report details the evaluation of RFT 67/15 – Cleaning of Bega Valley Shire Council Buildings for 2015-2018 with two further one year options. 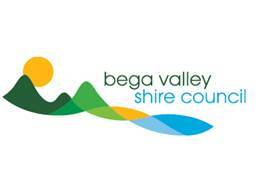 Bega Valley Shire has recently called for tenders for a service contract for the cleaning of Bega Valley Shire Council buildings. Tenderers were asked to nominate which region(s) they were tendering for. Individual tender assessments were carried out for each sub-region as well as for the Shire as a whole. 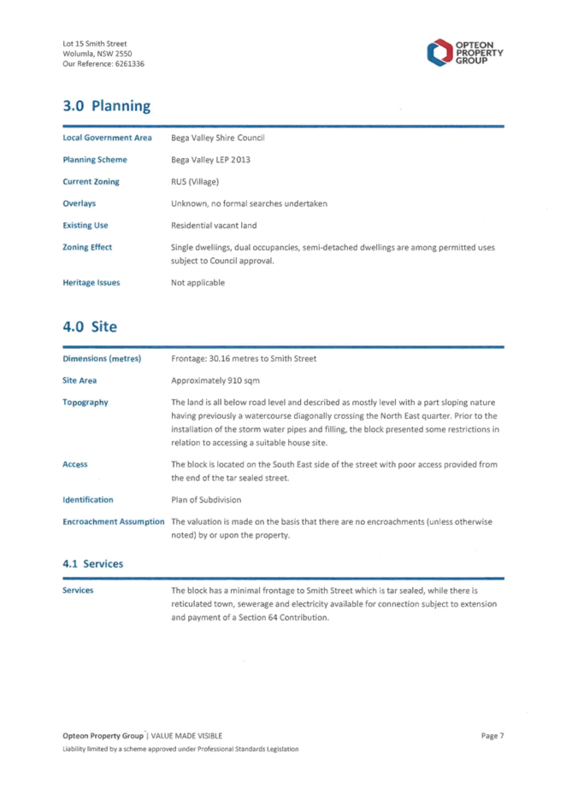 This Tender is for a service contract for cleaning of Bega Valley Shire Council Buildings and is a Quality Control Contract with method of payment being monthly progress payments. The Tender was advertised in the Sydney Morning Herald on 8-9 September 2015, in local newspapers and on Council’s webpage during the week commencing 8 September 2015. 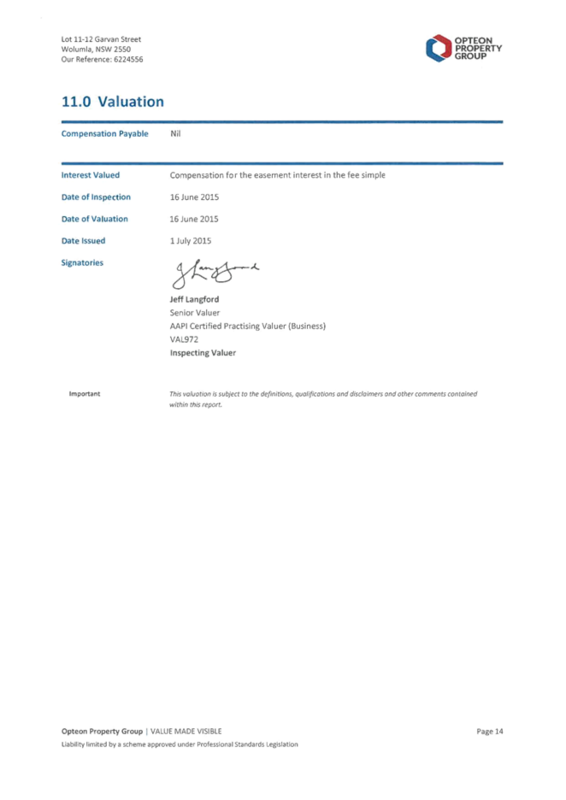 Tender documents were issued on the 8 September 2015, with tenders received up until 12 noon on 30 September 2015 via the Tenderlink electronic tendering system. Eighteen companies obtained documents with two parties attending pre-arranged site inspections. No companies attended the optional pre-tender meeting held on 18 September 2015. 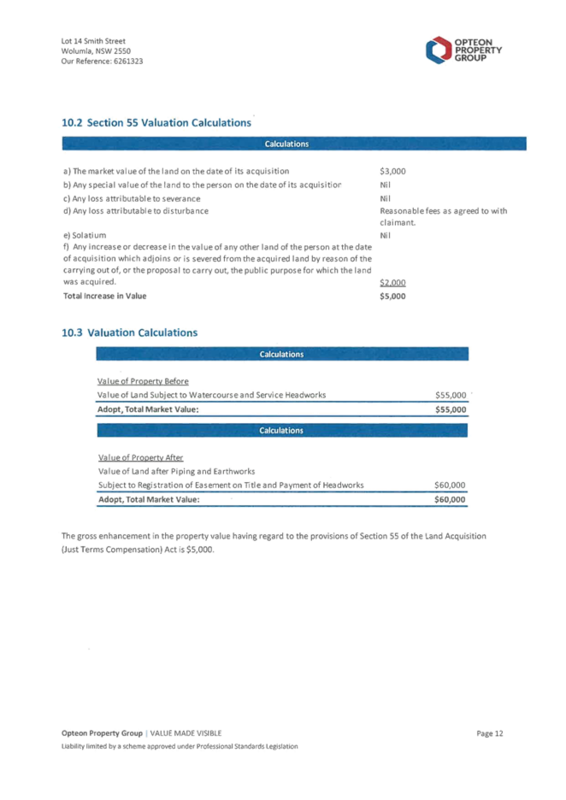 A tender evaluation plan consistent with the NSW Local Government Tendering Regulations and the Conditions of Tendering were prepared and endorsed by the tender evaluation panel prior to the close of tenders. At the time the tenders closed, two conforming tender submissions were received for all regions, 3 conforming tender submissions were received for individual regions and 2 non-conforming tender submissions were received. The tender evaluation was carried out in accordance with the Tender Evaluation Plan with a preferred tender identified in this process. 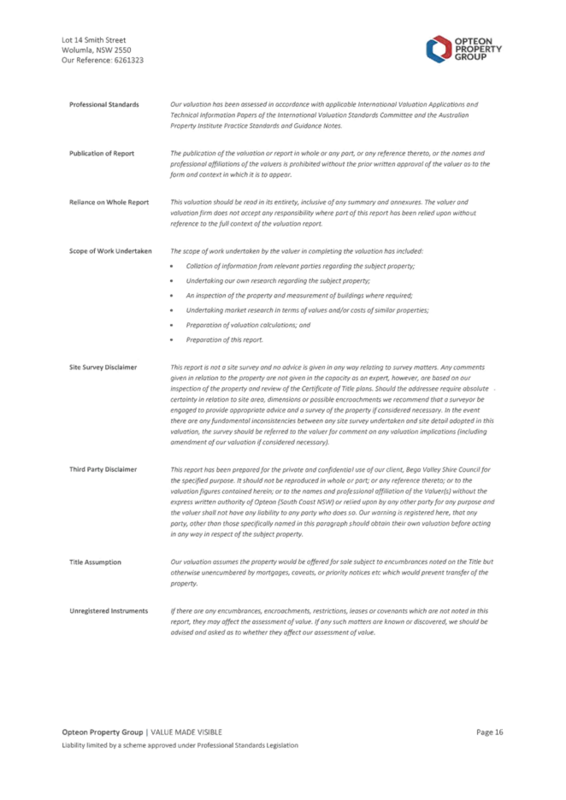 Full evaluation details are contained in the attached Confidential Memorandum to Councillors. The subject works are in accordance with Council’s Buildings Asset Management Plan. Having a cleaning service contract in place will ensure Council buildings are maintained and cleaned to a satisfactory level to meet the needs and expectations of the community and staff that occupy and use them. The tender evaluation panel have consulted with the relevant referees supplied by the complying tenderers. 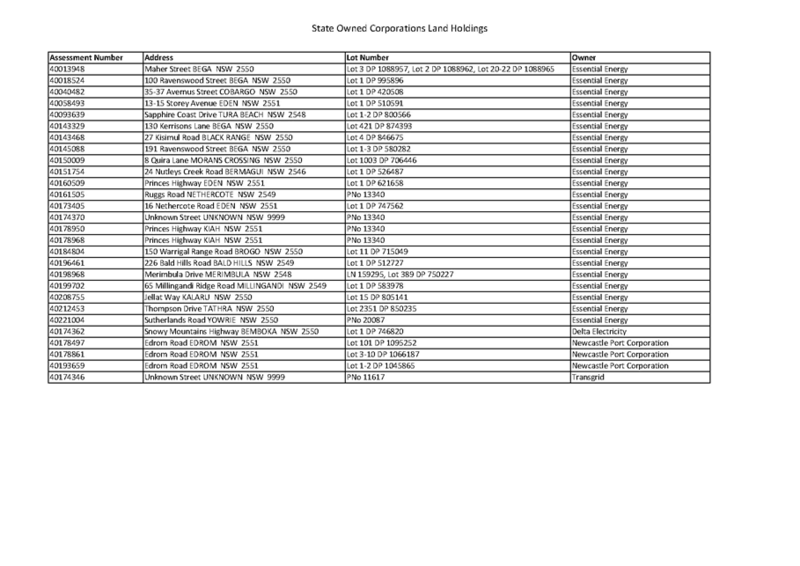 All comments received have been documented and can be supplied upon request. The current budget allocation is sufficient to cover the proposed cleaning contract. Project management and routine site inspections will require staff resources as required. This report recommends award of the contract for services to a preferred tenderer in accordance with the details presented to Councillors in the Confidential Memorandum attached to this report. 2. Council accept the tender submission from <insert> in relation to RFT 67/15 Cleaning of Bega Valley Shire Council Buildings in the amount of <insert> (including GST), subject to variations, provisional sums and prime cost items. 3. 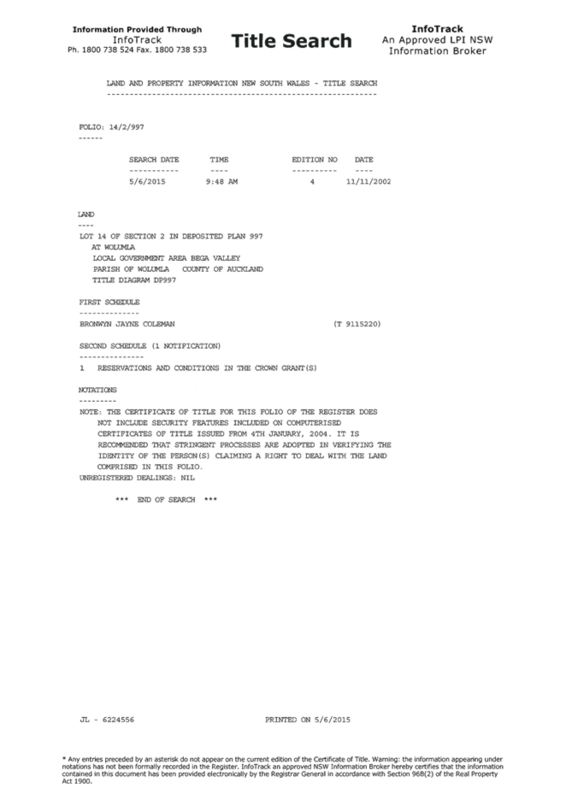 That authority is delegated to the General Manager to execute the necessary contract documentation. 4. That all other tenderers be advised of Council’s decision. In order to make it clearer for Councillors and the public, the following graphic depicts the flow of financial information in any given financial year and how the various financial documents interact. 1. The financial statements are true audited records for the financial year. These results are used to “reset” the Long Term Financial plan (LTFP). 2. The “reset” LTFP plan is then remapped with moving works schedules and is confirmed to still be in a sustainable position. The LTFP is presented to Councillors at this time for adoption. At this time Councillors can request changes in direction of staff. The LTFP is adopted in January/February. 3. The adopted LTFP plan then is expanded into the relevant year's operating budget. It is adopted by Council in March/April. 4. 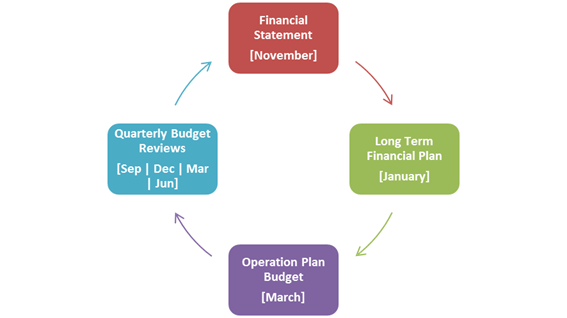 The Quarterly Budget Review Statement process occurs throughout the financial year at the end of each quarter. Variances are noted and adopted by Council. 6. Then cycle commences again. 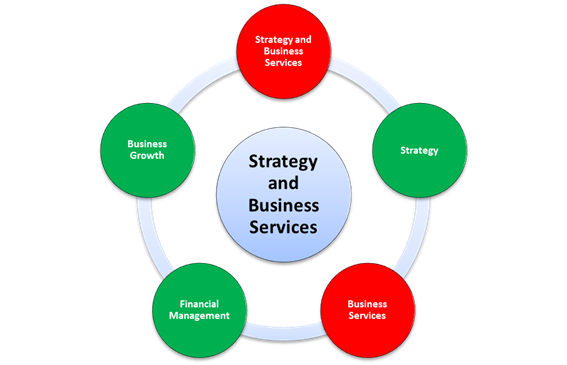 Each stage feeds information into the next until we have a very tight strategic finance frame work. There are a range of other statutory documents Council adopts each year, this diagram only reflects the financial documents. b) If that position is unsatisfactory, recommendations for remedial action. 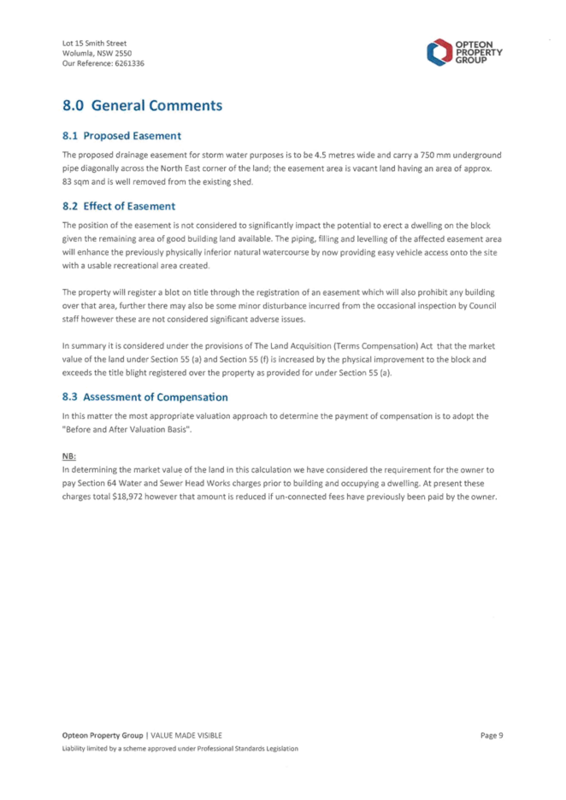 c) A budget review statement must also include any information required by the Code to be included in such a statement. As noted above, a June QBRS is not mandatory, most of the information is already prepared and presented within Council’s Annual Financial Statements. As such, this report does not contain information that is reported within the Financial Statements, but instead focuses on the non-operating items that are not covered in the Financial Statement. Council’s budget result for the 2015 financial year is positive. 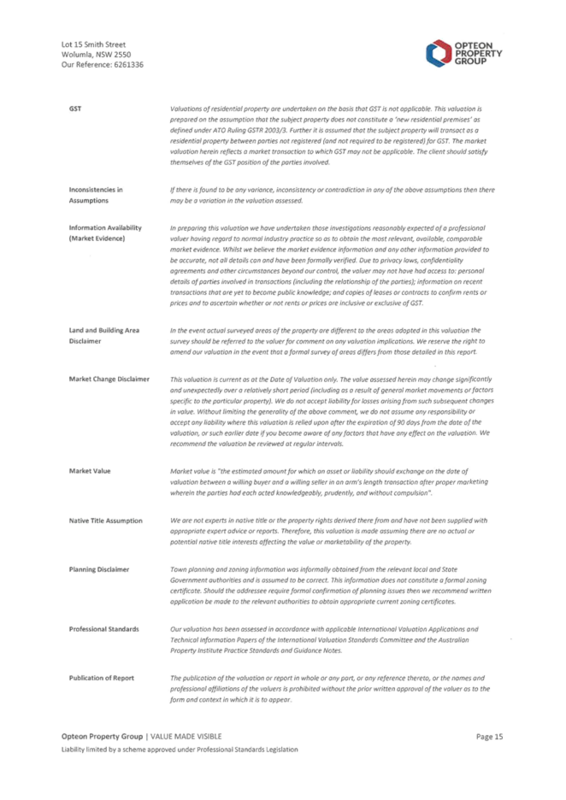 While there are specific issues that need to be addressed which will be covered in more detail in the attachment, the overall picture for Council is positive. Council’s restrictions (reserves) totalled $51.8M at the conclusion of the 2014 financial year. The following chart illustrates the current value of Council's restrictions. Council's LTFP outline how those restrictions will be utilised over time. Operationally Council performed reasonably well in its individual functions. Council’s operating budget is broken into functions which are managed by Council staff. 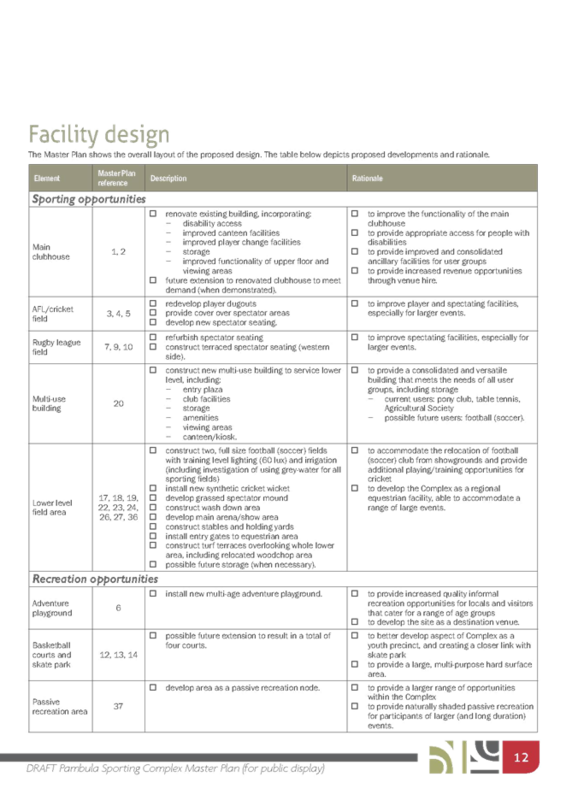 Council has 23 designated functions across its five Community Strategic Plan themes. Of those 23, 19 were deemed to have performed better than budgeted. The remaining four were deemed to have performed less than expected. Council’s senior management has met about these functions to discuss why the results have occurred and more importantly how to avoid them happening into the future. The issue that has been identified as the main cause of these budget issues relates to asset definition and transactional capture deficiencies. Overall cash performance is fine; it is the actuals versus planned expenditure that requires work, with the issue being the classification of expenditure between the various transaction types (Maintenance, Renewals, & Upgrades). These issues will be rectified in future years with the establishment of an Asset Management Group to drive consistent approach on Planning and Capture across all asset classes. The following charts Council's budget performance against actuals over the course of the financial year. The following charts show the Council functions and their performance. The functions marked red have explanations included in this report for Council's consideration. Leisure includes service areas of Swimming Pools, Sportsgrounds, Park and Beaches. Issues relating to swimming pools were over-estimation of fees by $300k. 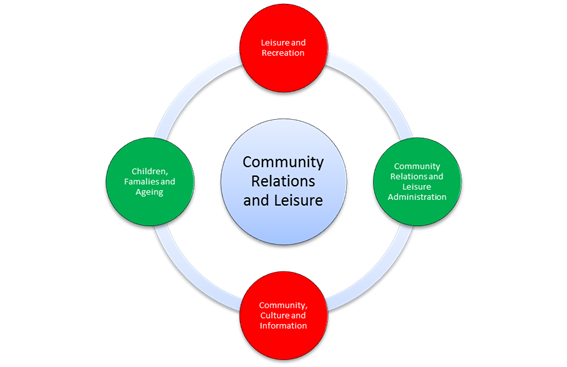 Community, Culture and Information includes various functions such as Library, Cemeteries, Community Development, Halls, Gallery, Contact Centre, etc. The interest revenue was lower than anticipated due to low interest rate in the financial market. Also staff redundancies cost Council about $797k in unanticipated cost. These costs were funded from the Employee Leave Entitlement Reserve which had dropped the cash backed portion. 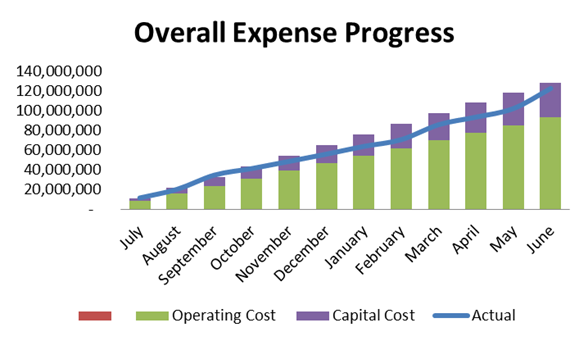 Operating Expenses over budget and Capital Expenses under by $530k and $1,1M respectively. Works includes activities such as Plant, Council Depots, Public Amenities, Private Works, Carparks, Saleyards and Quarries. Plant Income for the past 5 years has achieved only 70% of estimated trade-in/disposal income. Again an operating over run and capital under spend of $40k and $125k respectively on Public Amenities. It is important to note that overall, each of Councils functions and groups finished 2015 in budget surplus. A red marker against a function does not denote that the function performed negatively throughout the year. It is an indication that the actuals spend incurred differed from the planned spend in that particular area. The function could have planned to spend its money in maintenance but for valid reasons spent its funds in renewals. This would be marked as red as no prior indication was given through Councils budgetary process. Council has limited revotes for the 2014 financial year. Rather than revoting the works from one year to the next, under the Long Term Financial planning framework Council has adopted, we place the funds back into reserve and we reset the AMP and LTFP to account for the unfinished work. This then results in the reserves being called upon to fund that work in the relevant year that the job is scheduled for. The amounts revoted relate to Unspent Grants and Council Contribution towards those projects along with some other carry forwards associated with unspent revenue and deferred borrowings. Council’s overall 2015 end of year position has concluded favourably compared to budget. All surplus funds have been moved to Council’s reserves. All revoted projects have been noted and will be tracked through the 2015 financial year QBRS reports. In order to maintain a sound financial performance for future years, we need to put processes in place to rectify issues identified in this report. There is a consistent theme across all asset expenditure areas where what was planned and what was actually done were not aligned. Therefore an Asset Management Group will be formed to streamline the way we capture and report Asset data. 2. That Council adopt the Reserve schedule for 2015. Council note the updated reserve balances will be incorporated into the September QBRS due to Council in November. 3. That Council adopt the Revote schedule for 2015. Council note the updated revotes will be incorporated into the September QBRS also reported to this meeting. § Reserves table: This table outlines cash reserves linked to that particular function and their movements throughout the financial year. § Revotes Table: This table tracks the progress of the revotes from the 2015 financial year. Council staff retains the ability to enquire, transact, and report on the detailed General Ledger, which includes budgets. If there are specific questions relating to detailed transactional information, staff can provide answers to those questions. 1. Not later than two months after the end of each quarter (except the June quarter), the responsible accounting officer of a council must prepare and submit to the council a budget review statement that shows, by reference to the estimate of income and expenditure set out in the statement of the council’s revenue policy included in the operational plan for the relevant year, a revised estimate of the income and expenditure for that year. 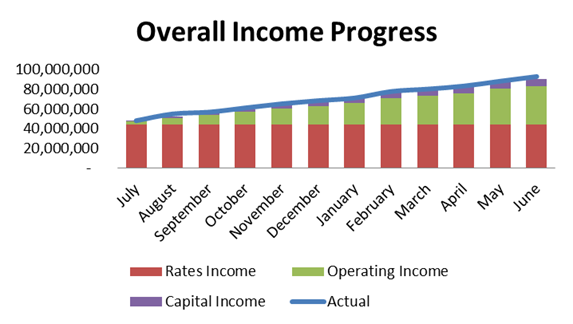 The QBRS reports the detailed variances for the September 2015 quarter. The September QBRS generally only includes the revotes from the preceding year as variances. Revotes are those works committed to in the preceding year that were not completed. The works are shifted into the current year with an increase in the relevant expenditure lines and a corresponding increase in funding from the preceding year. The value of carry forward from the 2015 financial year equal $4.366M. These transfers relate to unspent grants of $2.388M and other committed expenditure along with their funding sources. The trends highlighted in the 30 June review, of expenses incurred in areas that are not consistent with Council’s adopted budget is still present at the end of September quarter and an Asset Management Group will be formed to identify and rectify these issues. As at the end of September 2015, Council held $51.5M in cash and investments – the bulk of which remain restricted for use with planned infrastructure or projects preconditioned by loans, grants or development contributions. Council’s September 2015 QBRS has been presented to Council. Council financial performance is healthy and within the operating budget set by Council in June 2015. 1. That Council note and endorse the September 2015 Quarterly Budget Review Statement (QBRS). 2. That Council adopt the variances, in this instance being revotes from the 2015 financial year, to its operating budget as outlined in the QBRS. 3. That Council place the QBRS for September 2015 on its website for public information. This report details Council’s investments during the month of October 2015. 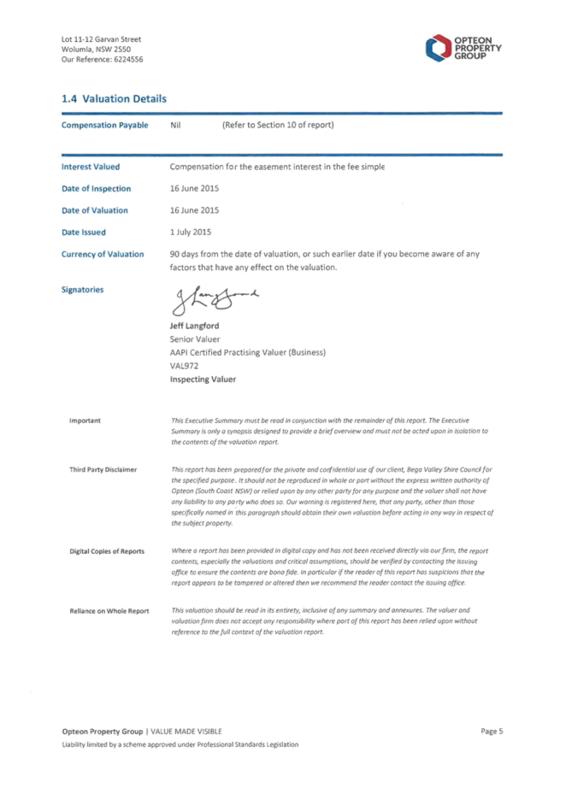 The attached report indicates a current investment portfolio of $45,000,000. The restrictions reported in Table 2 relate to 30 June 2015. A report on the Southern NSW Local Health District's Annual Public Meeting held Thursday 5 November 2015 at Batemans Bay. · A return to a small surplus after years of a major deficient. · This was particularly pleasing as the LHD was also able to meet or exceed its own KPI in regards to Emergency Department wait times and the Operation/theatre wait time. · Their next priority will be the Dental service for the area. 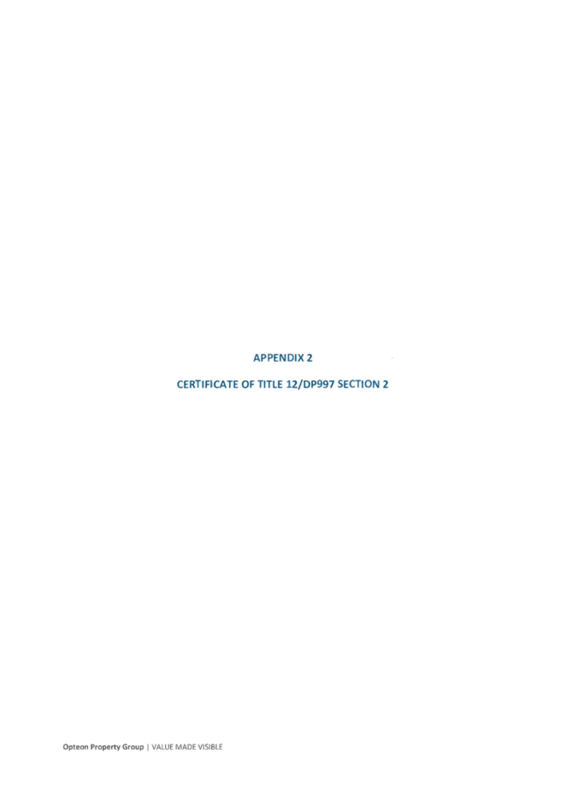 · The area has seen two awards come into our Health District. This project involved a team of Aboriginal and non-Aboriginal clients taking up the challenge of weight loss. They needed 30 participants but had 80 apply. The team won the George Rose Prize which had a prize of $20k that went back to the community. 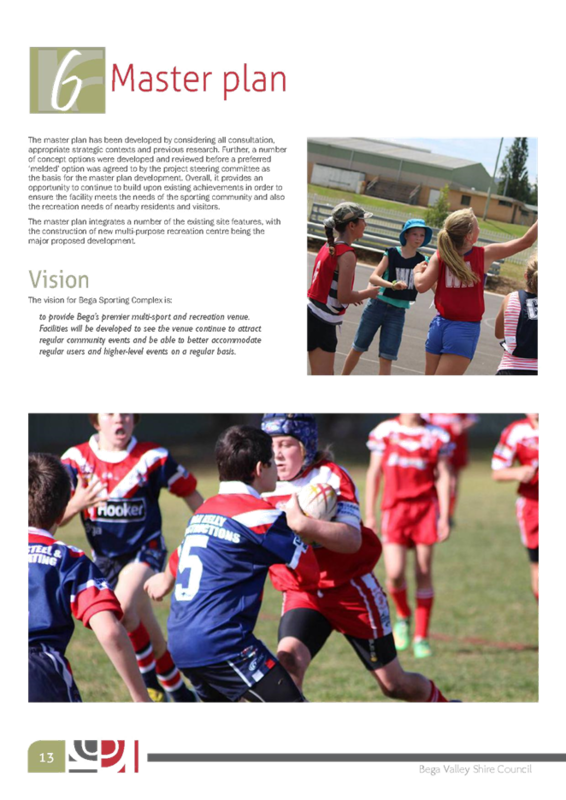 The National Rugby League sponsored teams to the value of $1,000. The education programs regarding nutrition and eating well has been the major outcome that is an ongoing positive. These programs also feed into the local GP health care plans for individuals. Health Ministers Award for Excellence in Mental Health. This Project involved facilitating long term psychiatric patients back into their community. The idea being that community care is better than Institutional care. 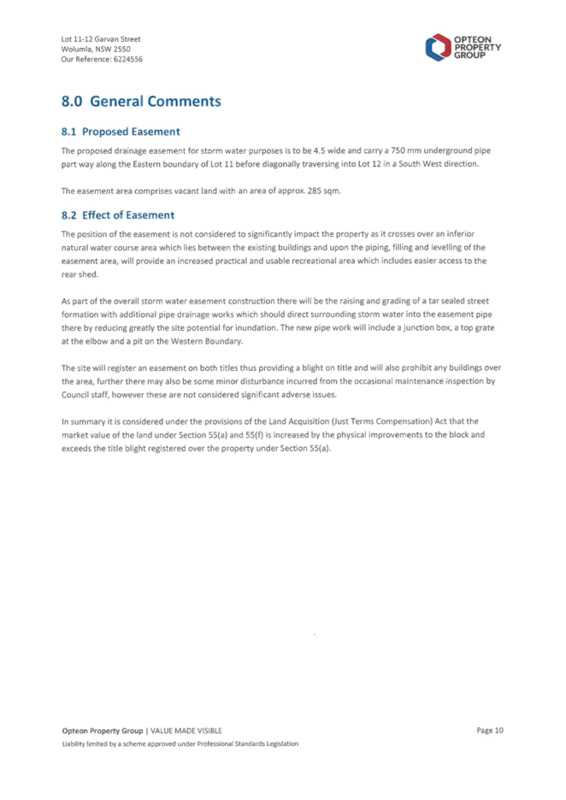 One case study showed discussed a client had been in an institution for 42 years and was integrated with support and a care plan back into their community. 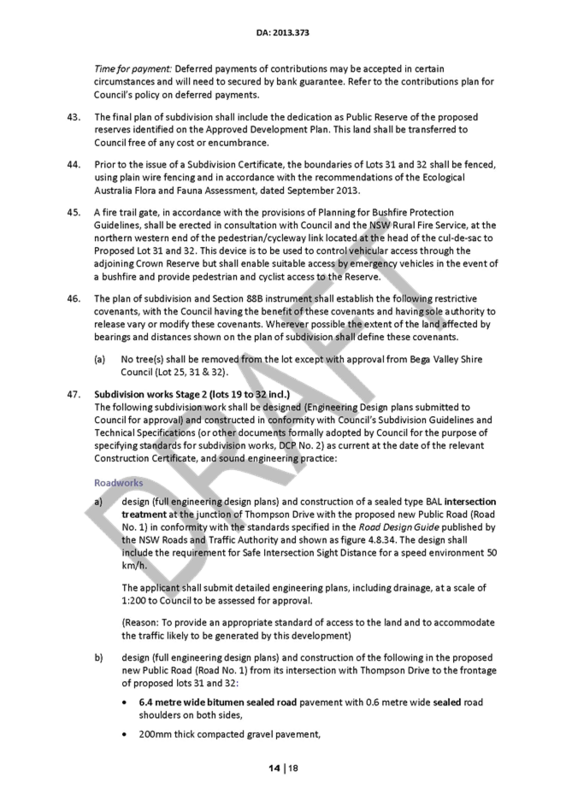 This project came out of the Living Well document and the NSW Ombudsman report on the Denial of Rights report. 20 clients were involved in the programme and had success in moving patients from the Kenmore Facility back into their community. It was noted that keys to the South East Regional Hospital have been handed over and it is expected a moving day of will occur in March 2016. At its Ordinary Meeting of 12 August 2015, Cr Hughes asked could a report be provided regarding the payment of rates by State Owned Corporations. Cr Hughes advised that when the Forestry Corporation of NSW became a Statutory State Owned Corporation (SOC) through the Forestry Act 2012 (NSW) (Forestry Act), it came under the State Owned Corporations Act 1989 (NSW) (SOC Act). In its previous status as a corporation sole, Forestry Corporation of NSW was arguably protected by the shield of government. As a SOC it is not  and may no longer be able to claim exemption from paying such things as taxes and rates. 1. Has BVSC sought legal advice on the possible implications of this change of status of the Forestry Commission in relation to rates? 2. What other SOCs own property within the BVSC area? What property do they own? 3. Which of these pay rates? Bega Valley Shire Council has not sought legal advice in regard to this matter. “The following land is exempt from all rates: land owned by the Crown, not being land held under lease for private purposes. In summary, notwithstanding SOCs are not exempt from rates, the Local Government Act does exempt Crown Land from rates. The Forestry Act empowers the relevant Minister to classify Crown Land a State Forest. NSW Forestry Corporation operates on Crown Land classified as State Forest. As a consequence NSW Forestry Corporation is exempt from paying rates. According to Council records, of these only Essential Energy is classified as rateable. 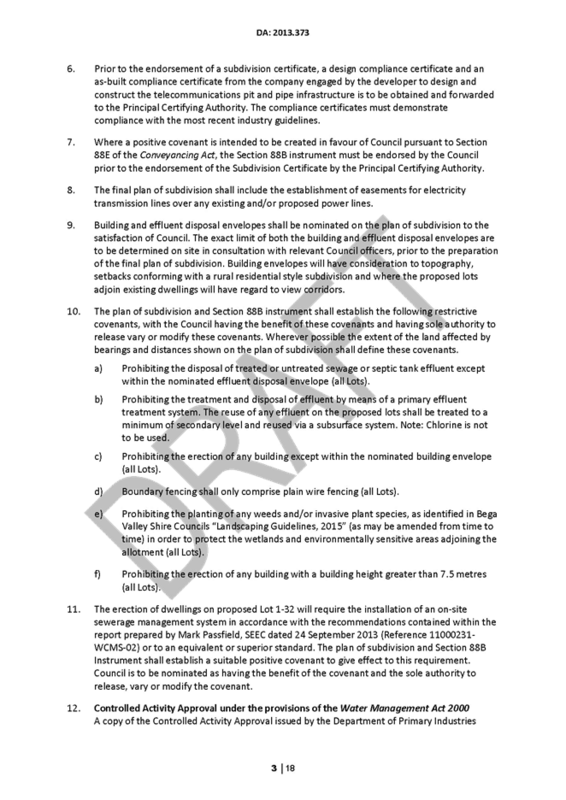 Information relating to the land these SOCs own is identified as an attachment to this report. Q: Has BVSC sought legal advice on the possible implications of this change of status of the Forestry Commission in relation to rates? A: To date, no legal advice has been sought in relation to this matter. Q: What other SOCs own property within the BVSC area? What property do they own? See attachment for property owned by these SOCs. Q: Which of these pay rates? A: According to Council records, of these only Essential Energy is classified as rateable. Would Crs Allen and or Fitzpatrick please provide evidence to Council on the financial viability of marinas on the South Coast of NSW to substantiate their opposition to the wharf extension proposed as part of the development of the Port of Eden. I am asking this question as both Cr Allen and Cr Fitzpatrick voted to support the Council committing $2 million to the development of the wharf at Eden, to assist in obtaining $10 million in Federal Government Funding to extend the Eden Wharf. The purpose of the extension is to attract economic growth for Eden. Both Councillors have now indicated opposition to the wharf extension and appear to be supporting construction of marinas as a preference.